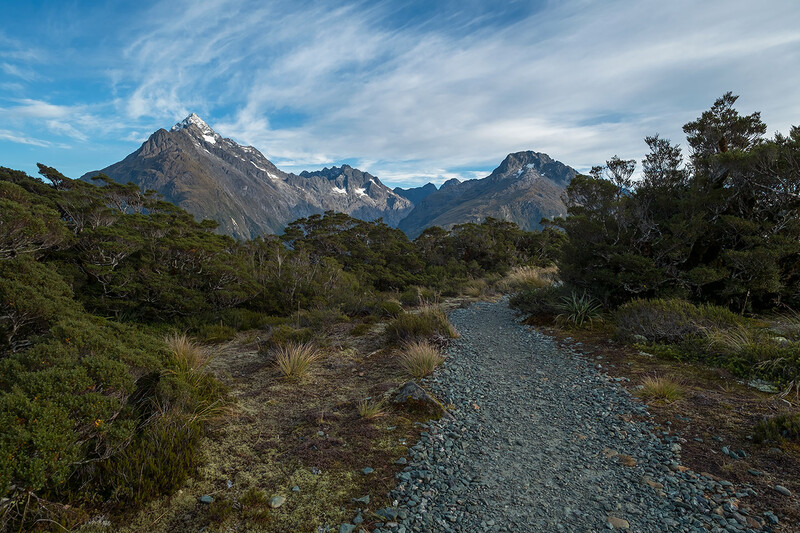 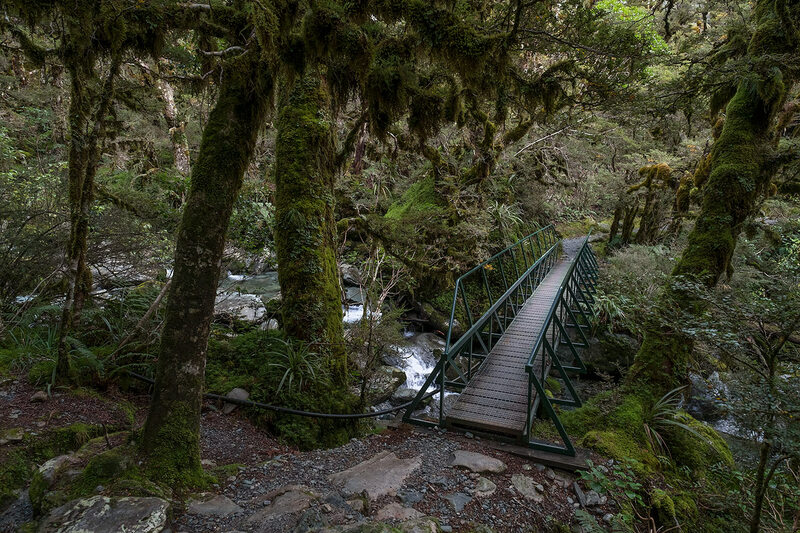 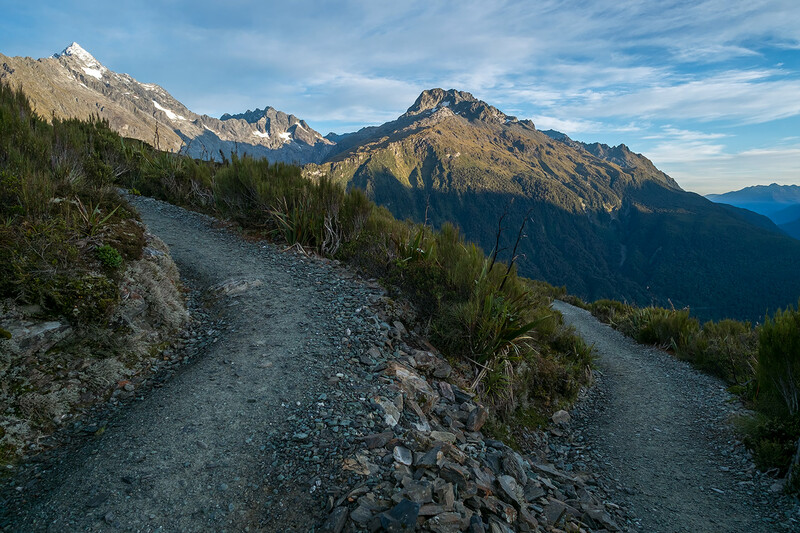 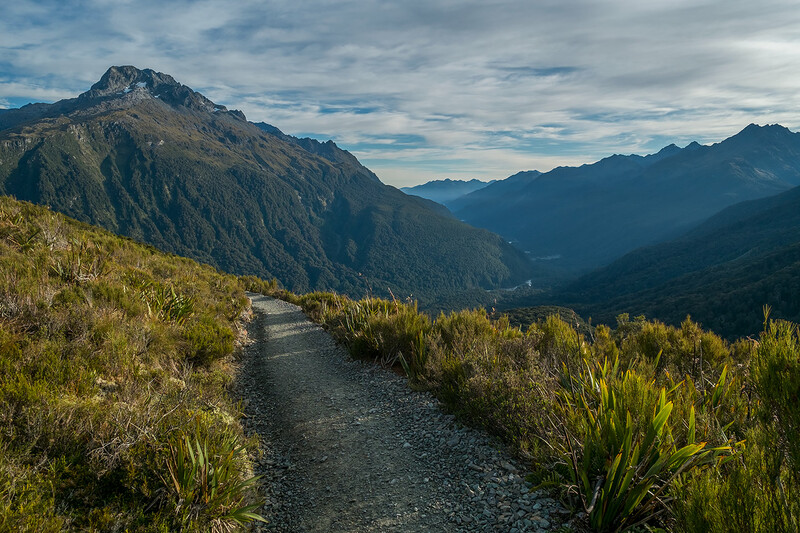 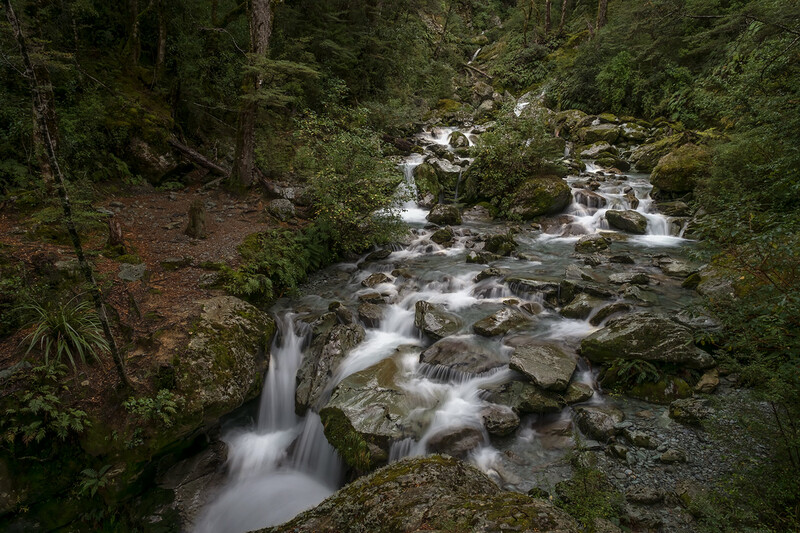 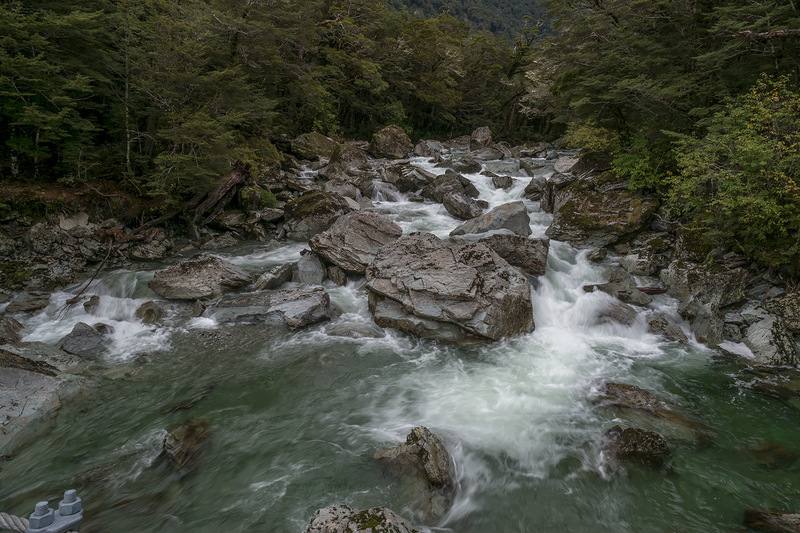 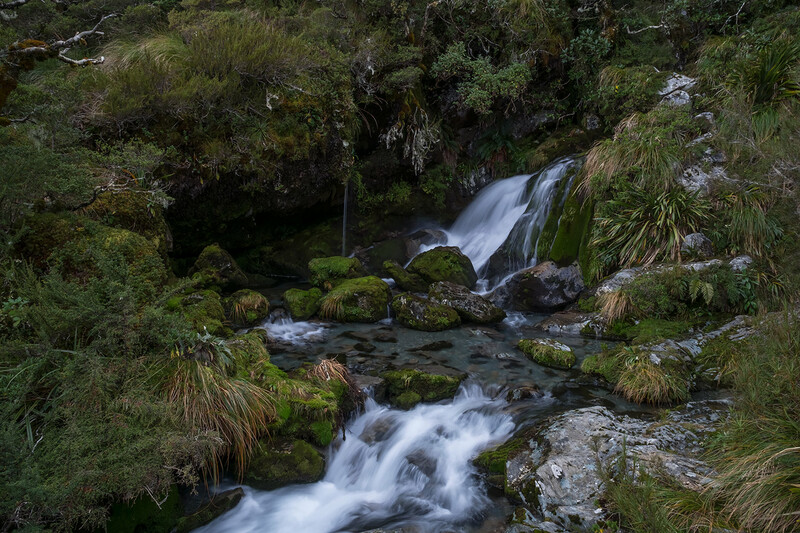 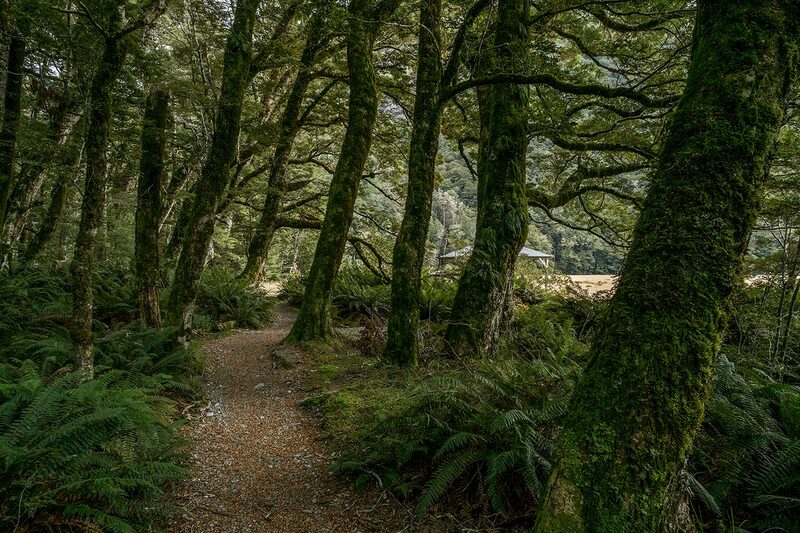 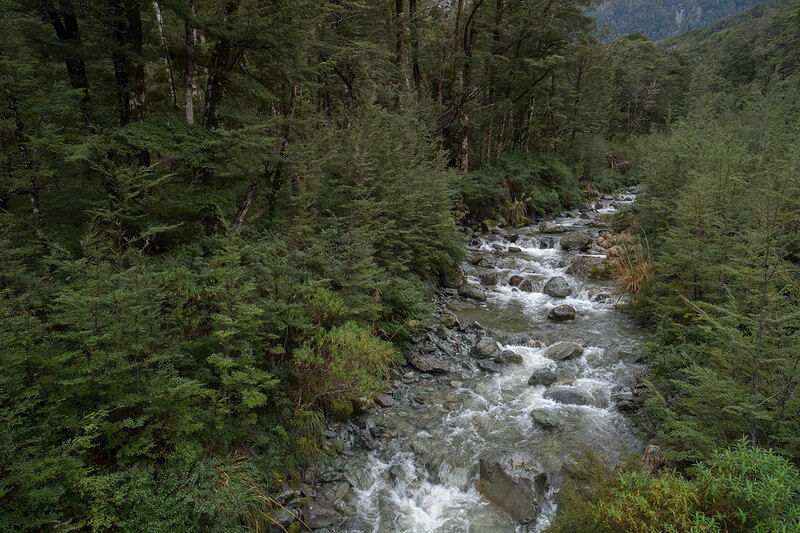 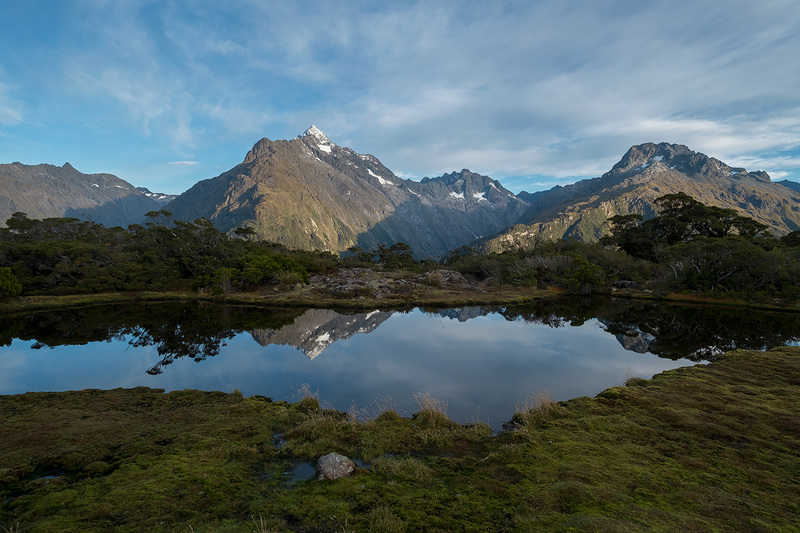 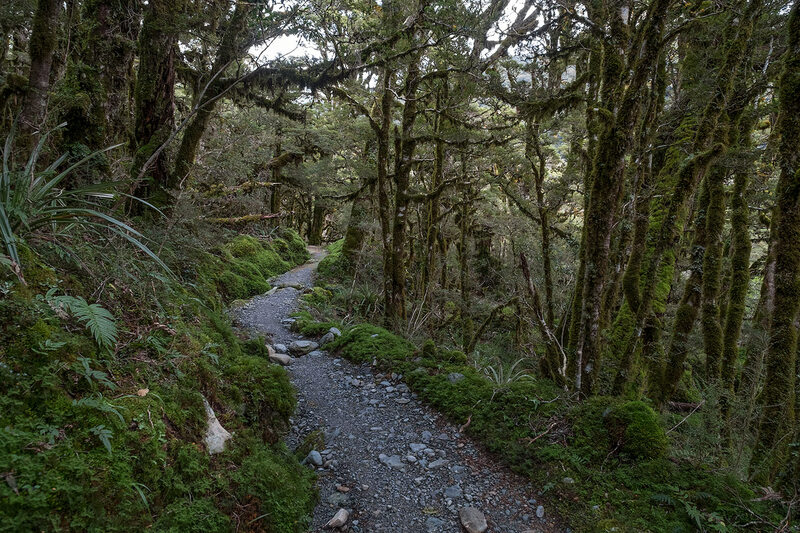 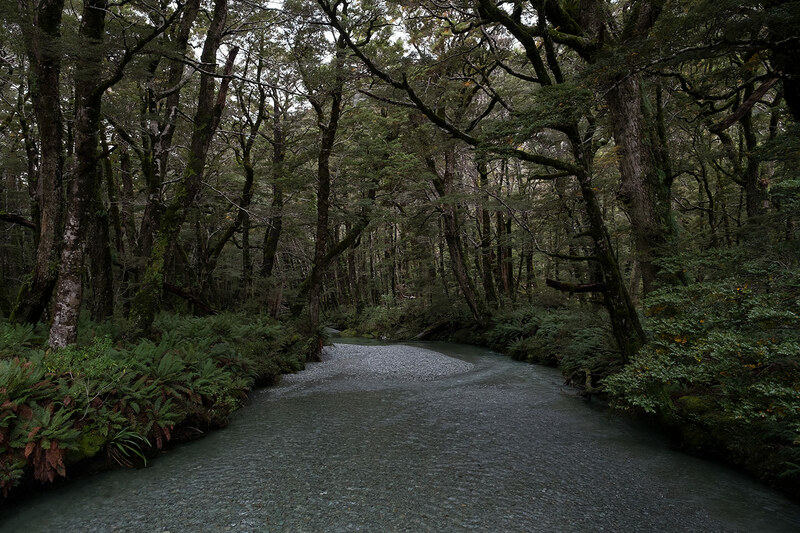 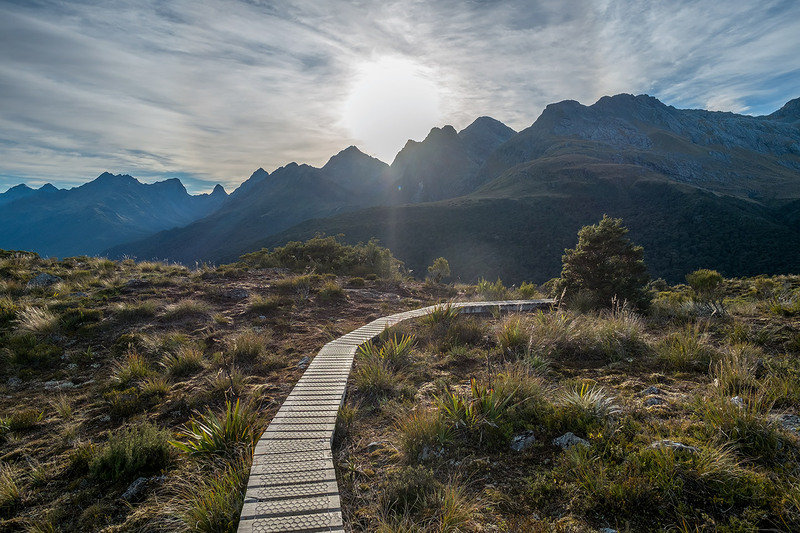 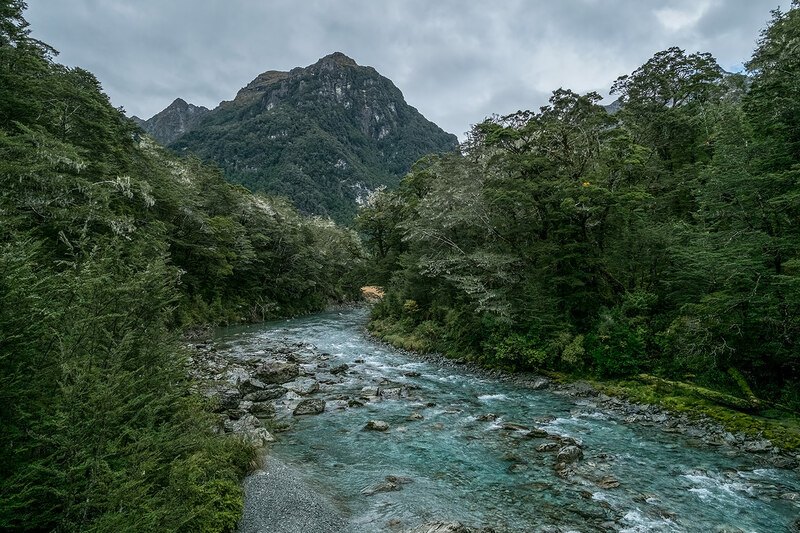 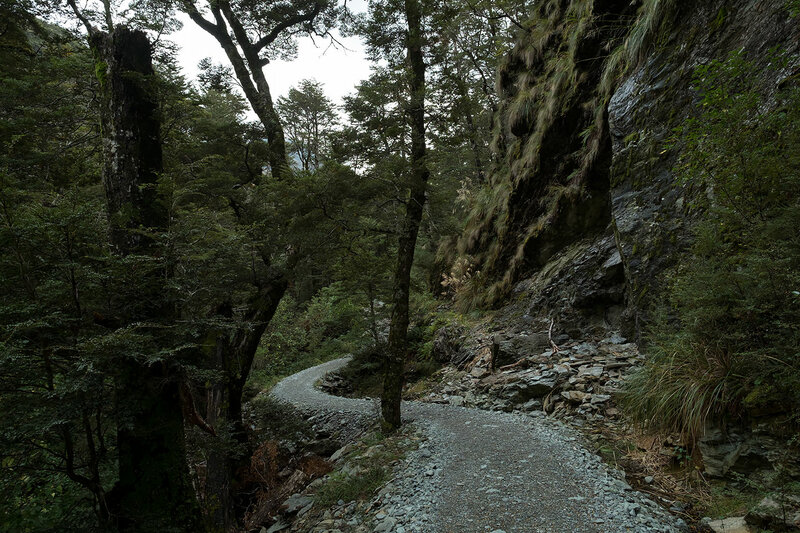 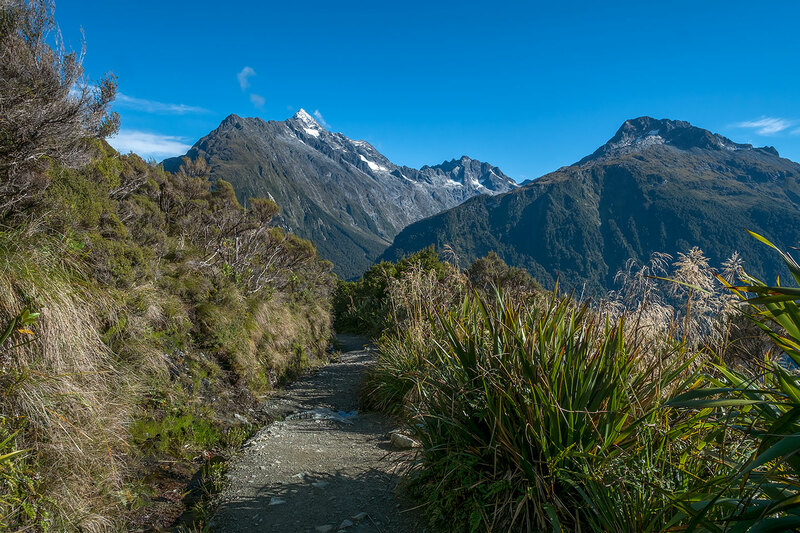 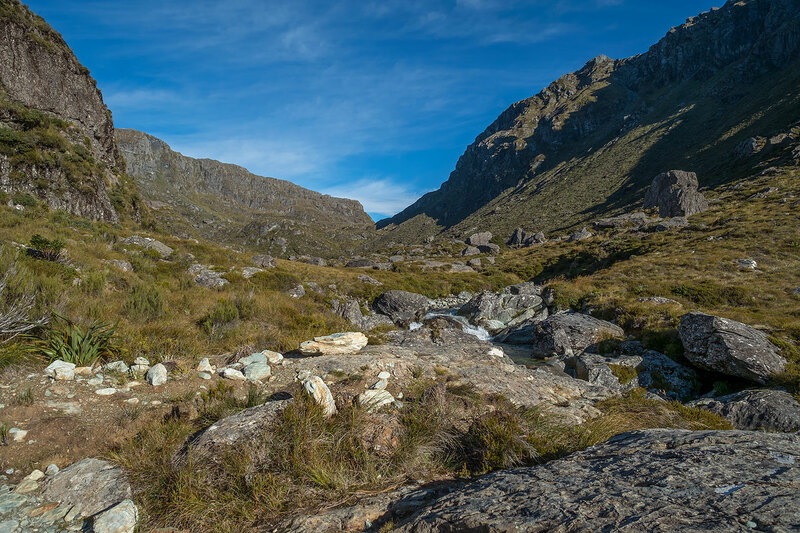 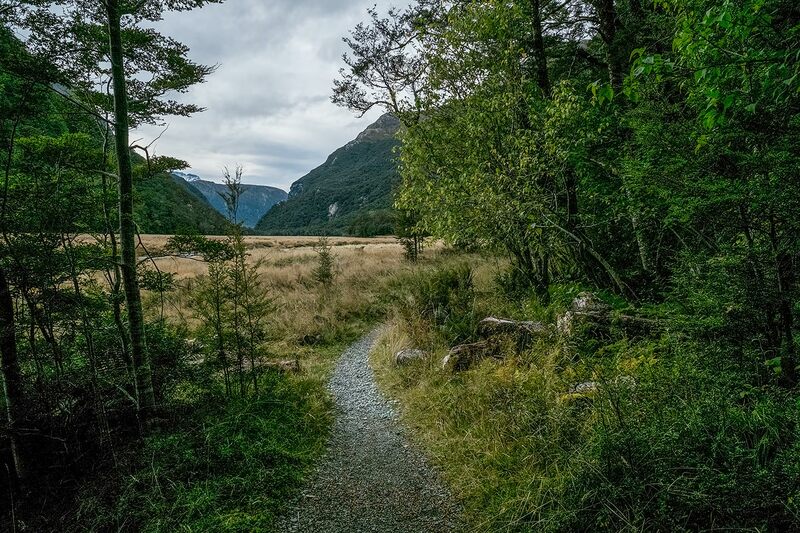 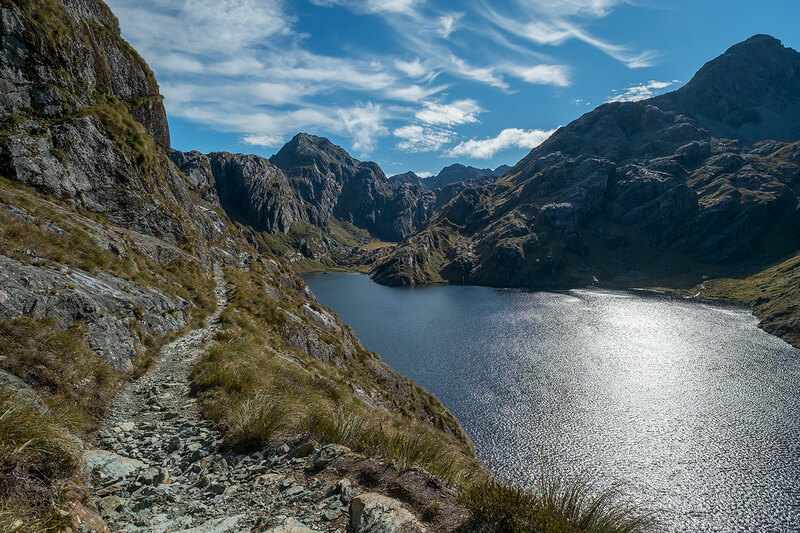 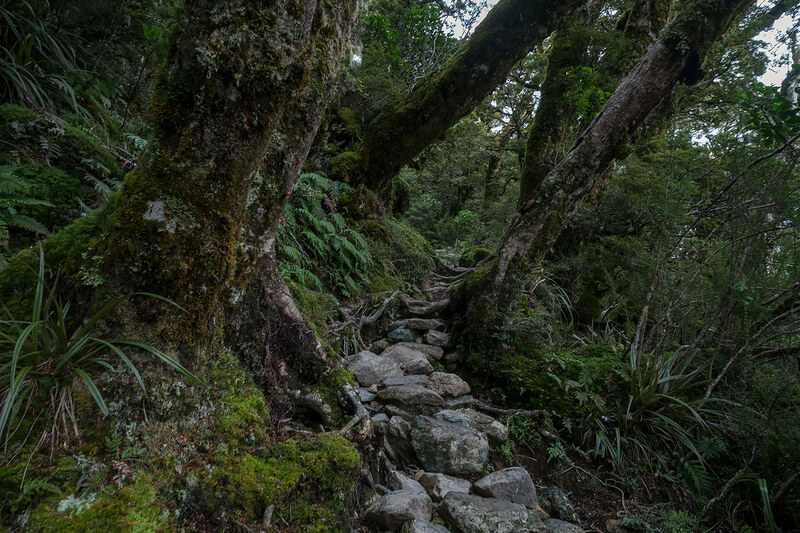 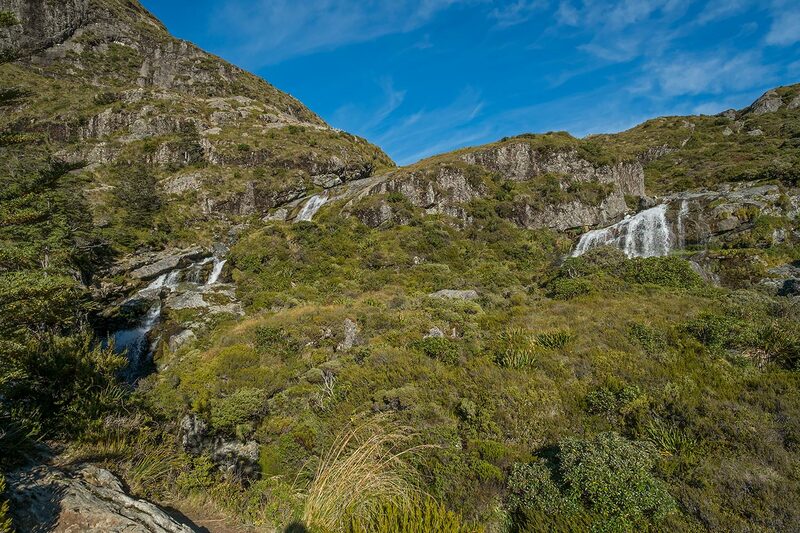 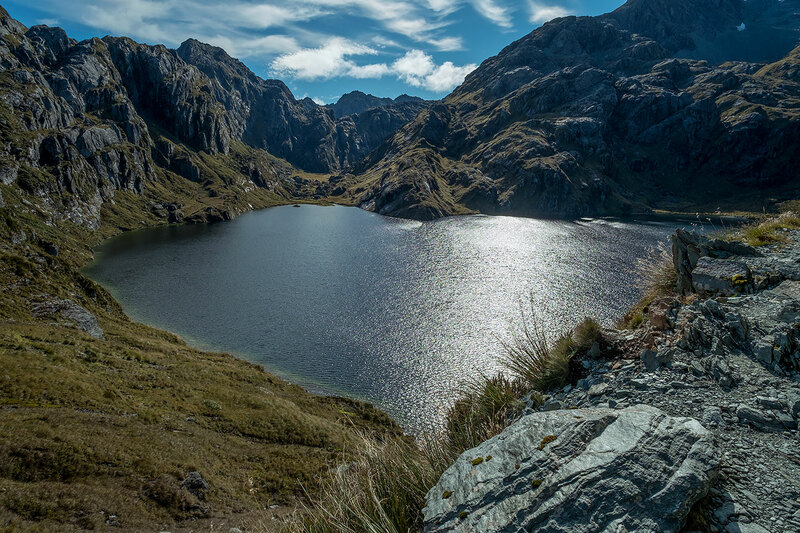 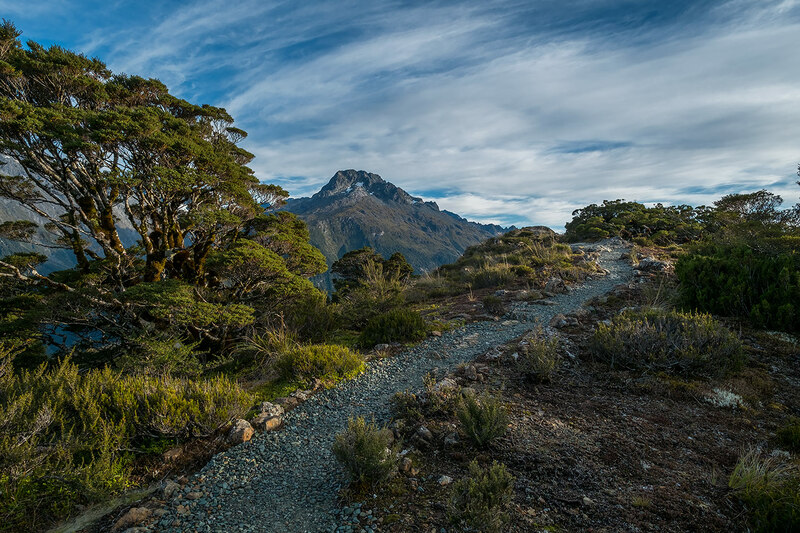 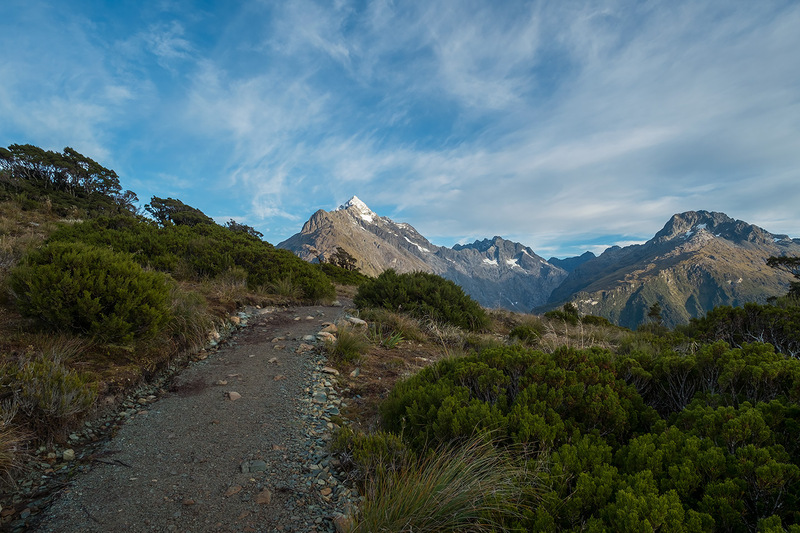 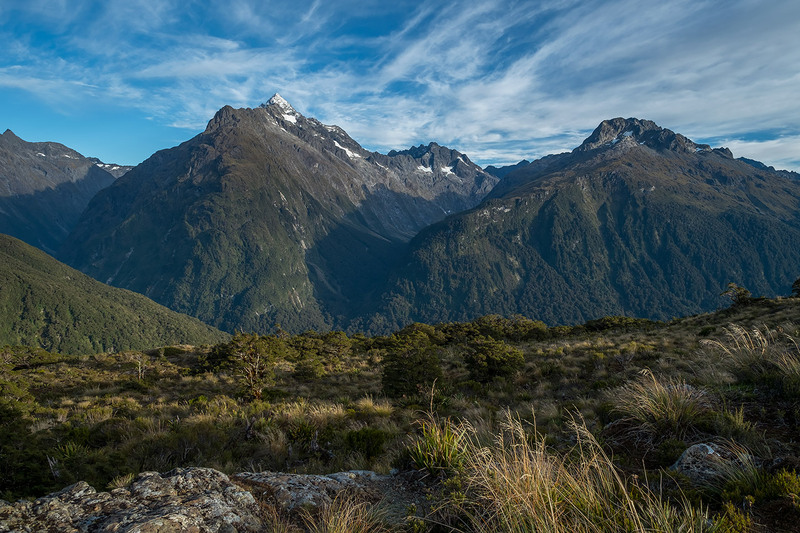 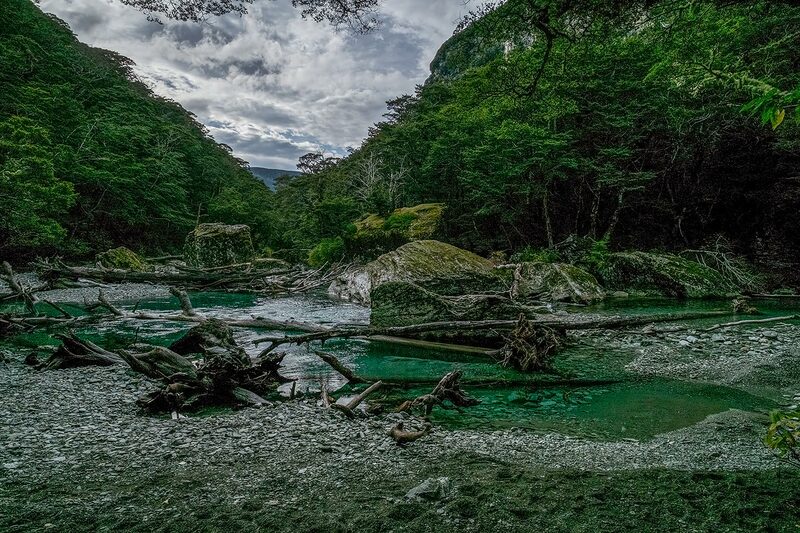 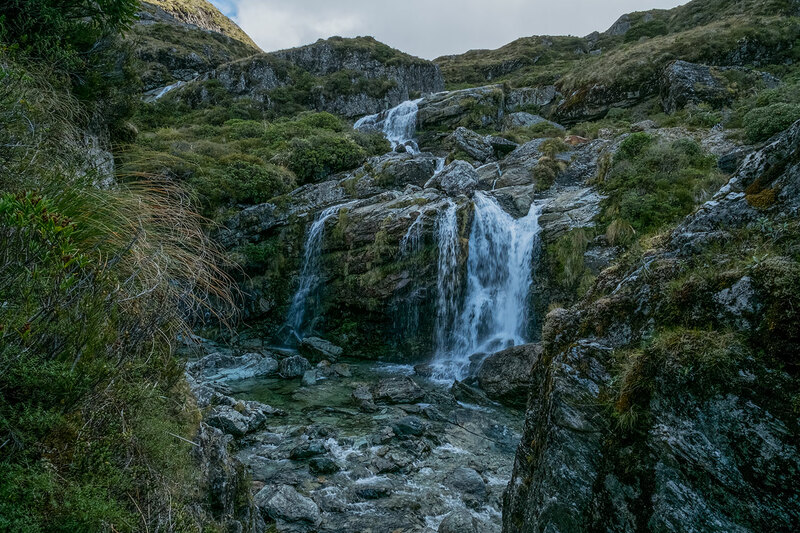 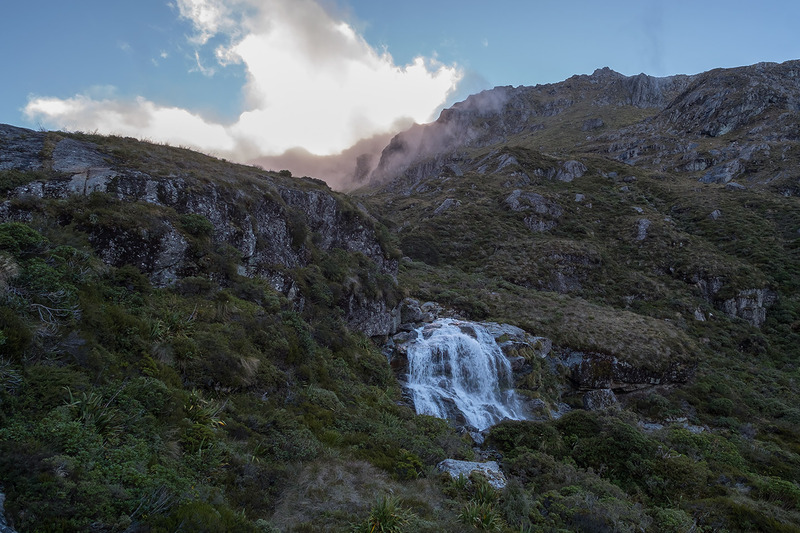 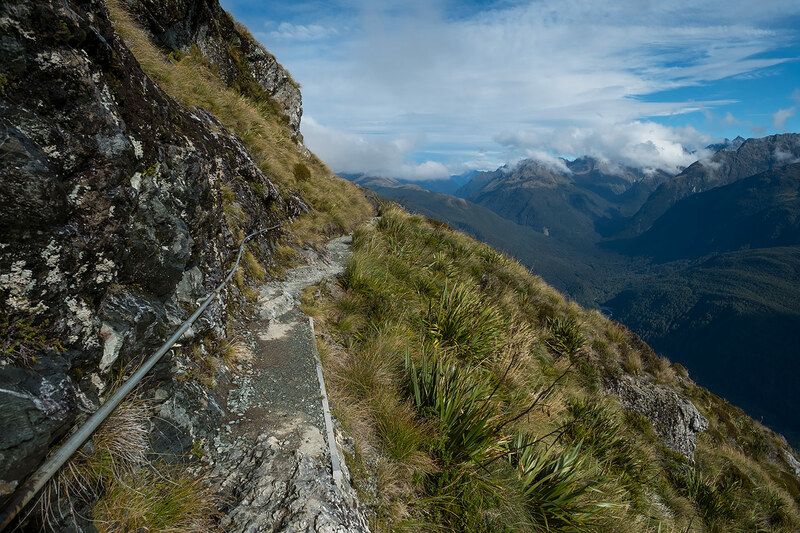 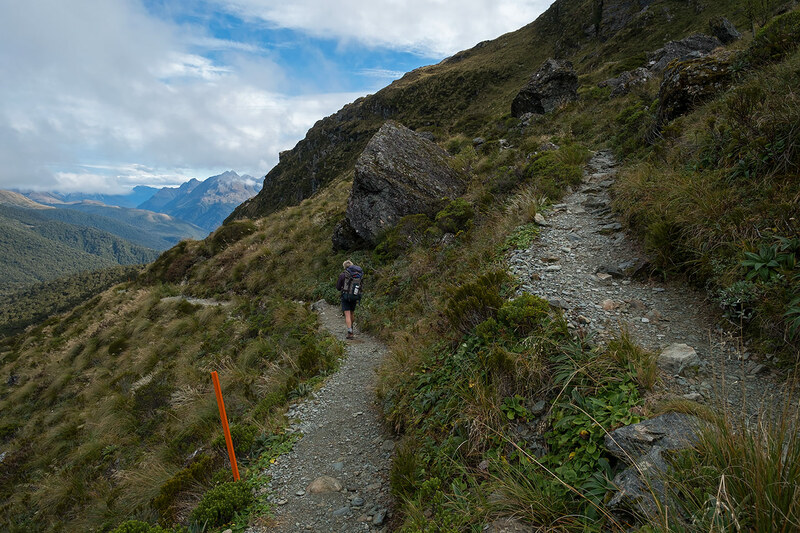 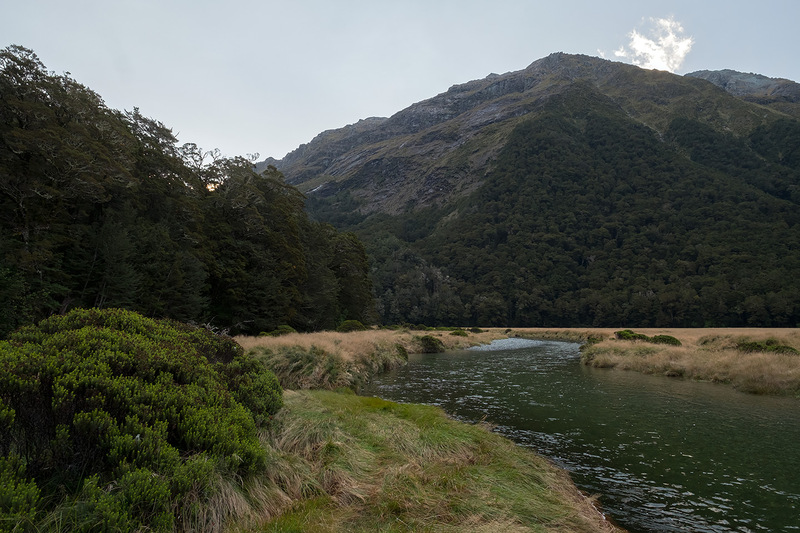 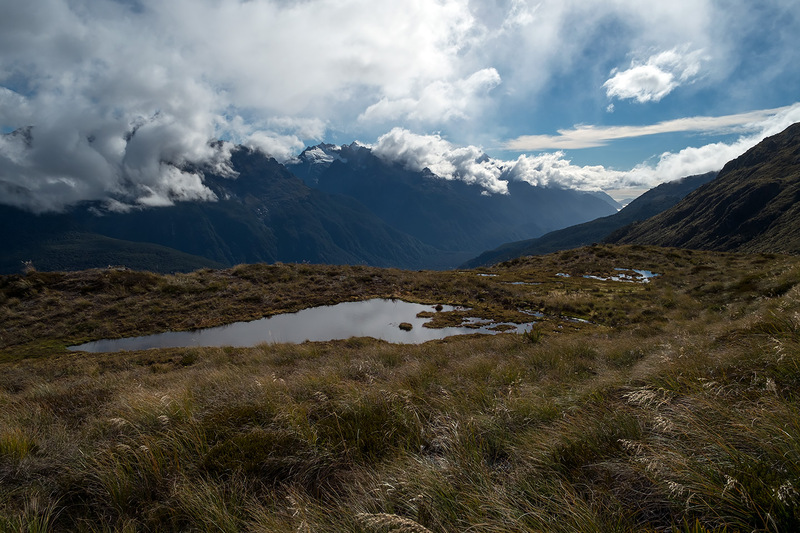 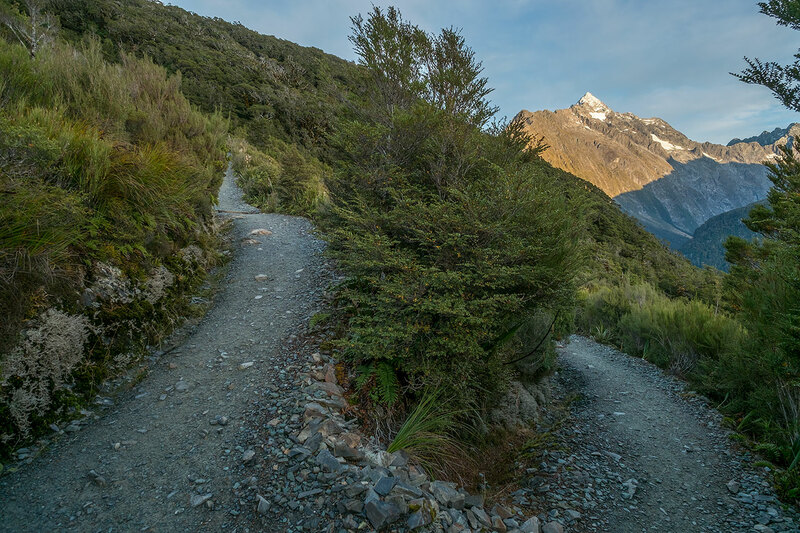 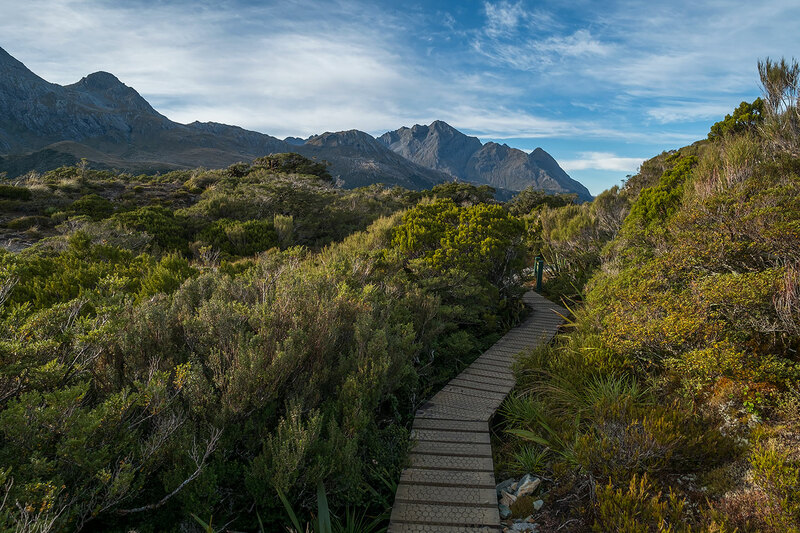 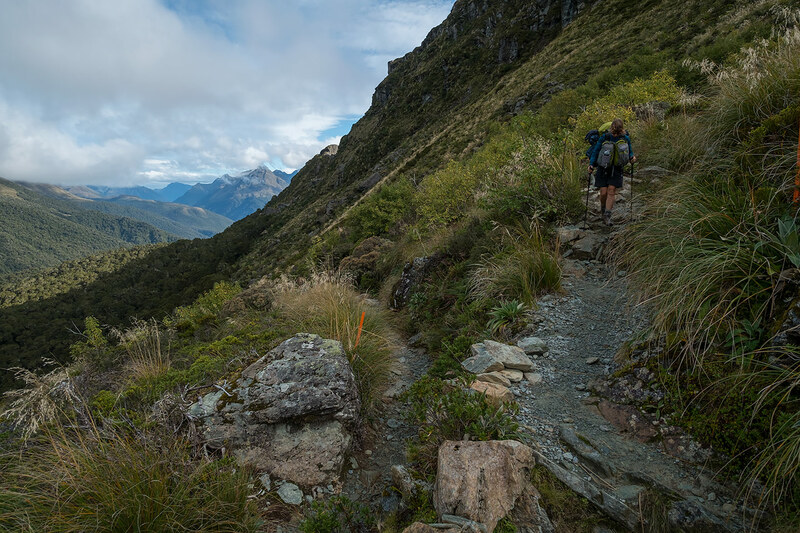 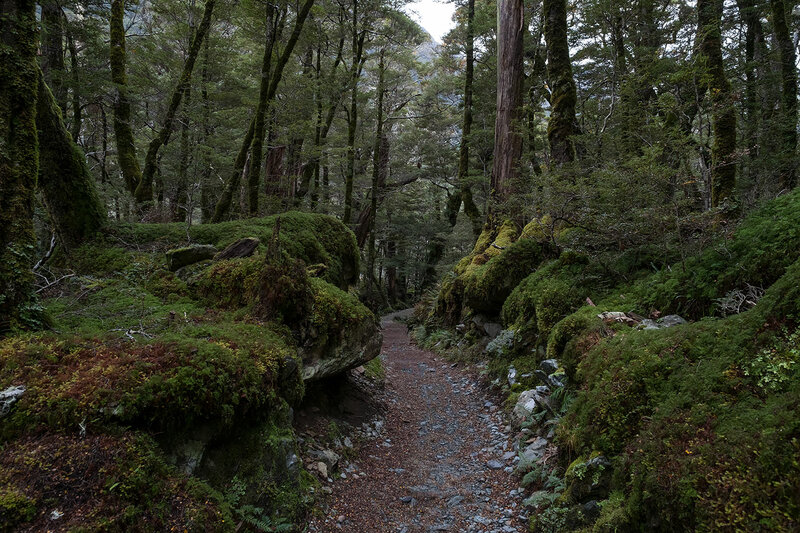 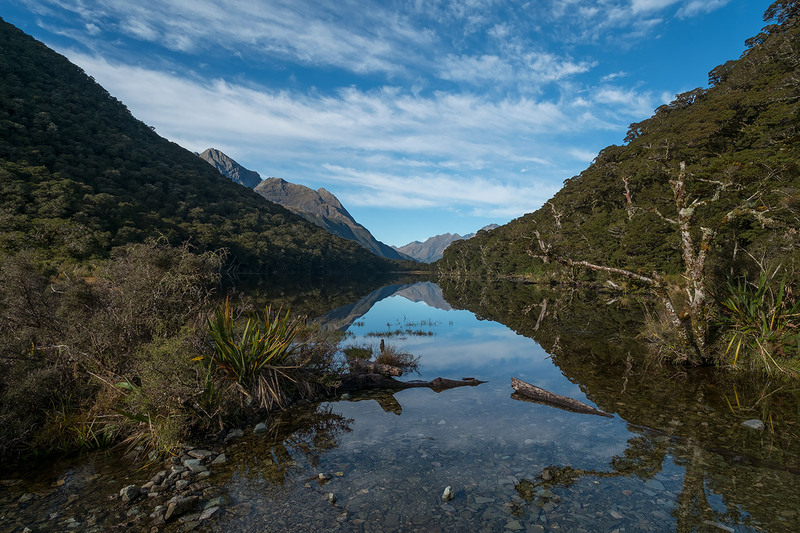 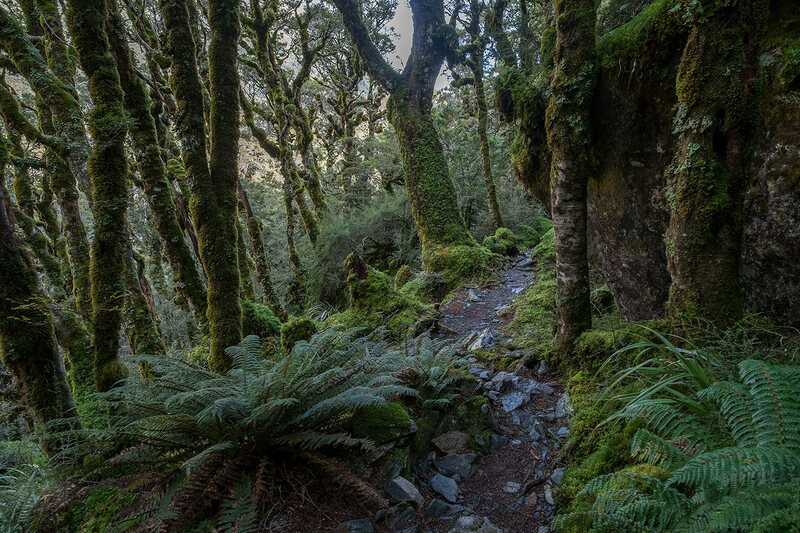 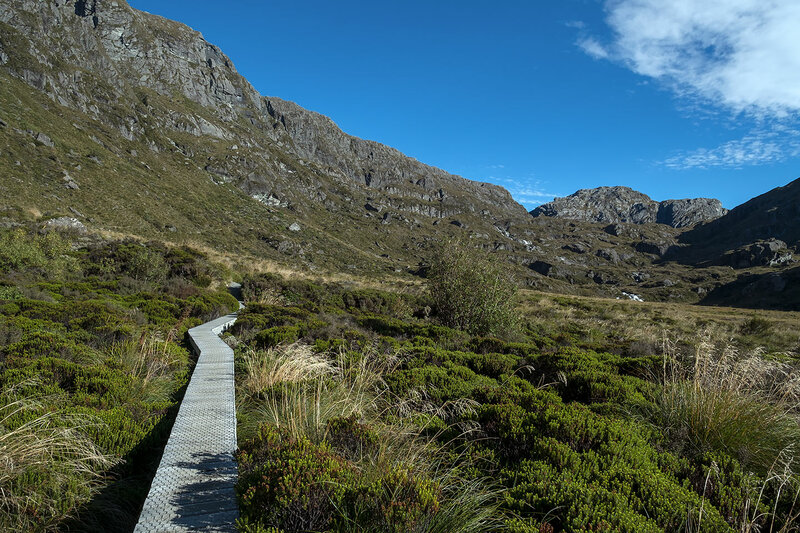 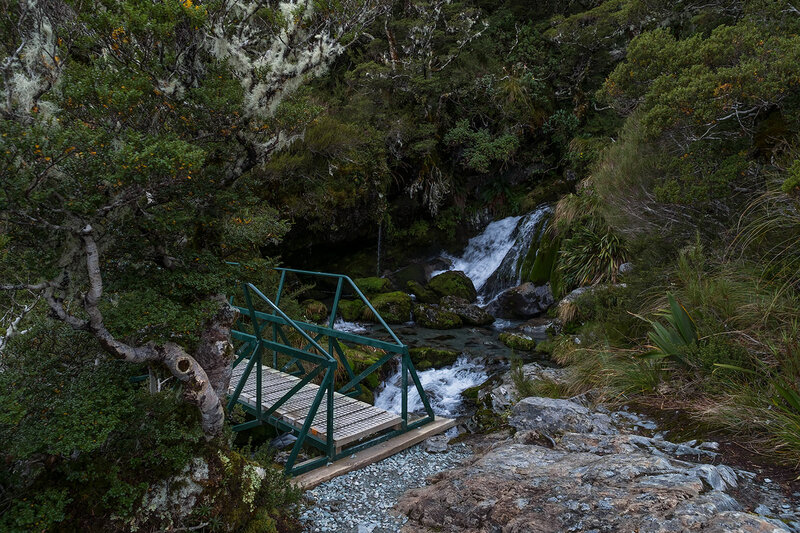 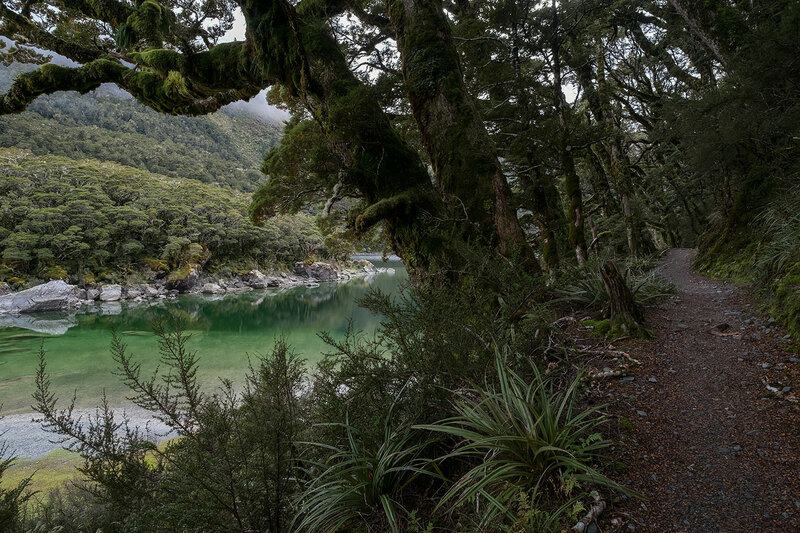 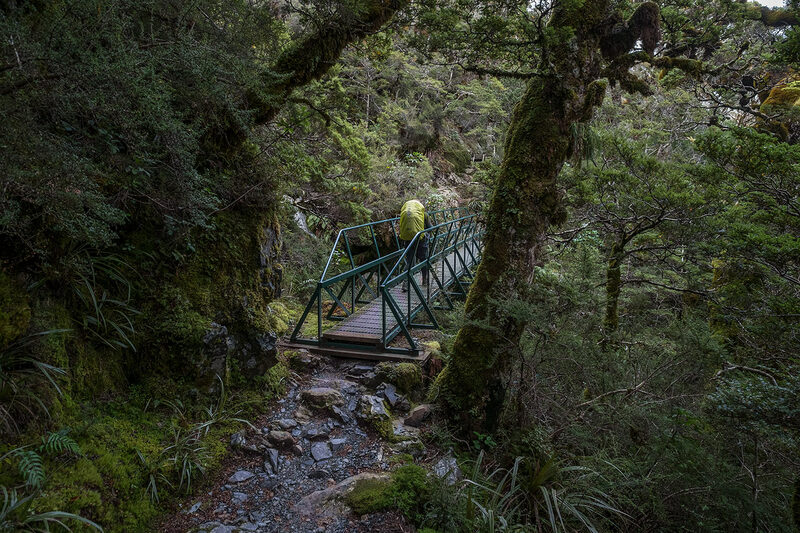 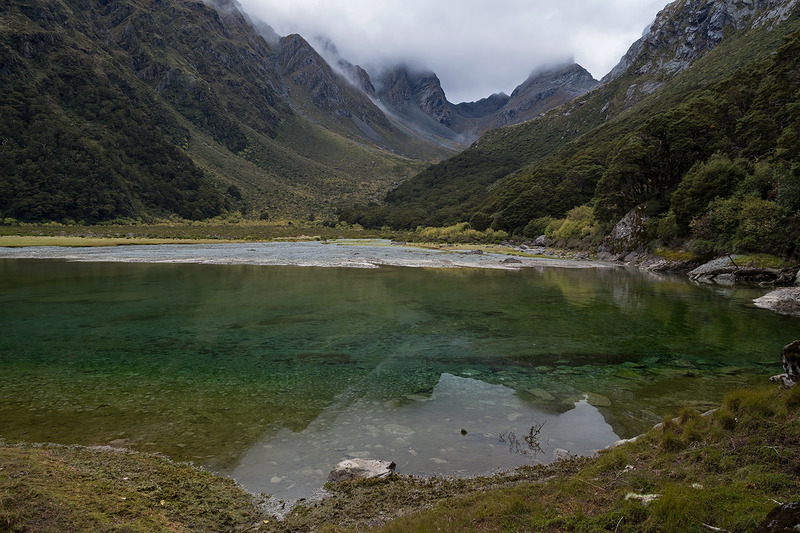 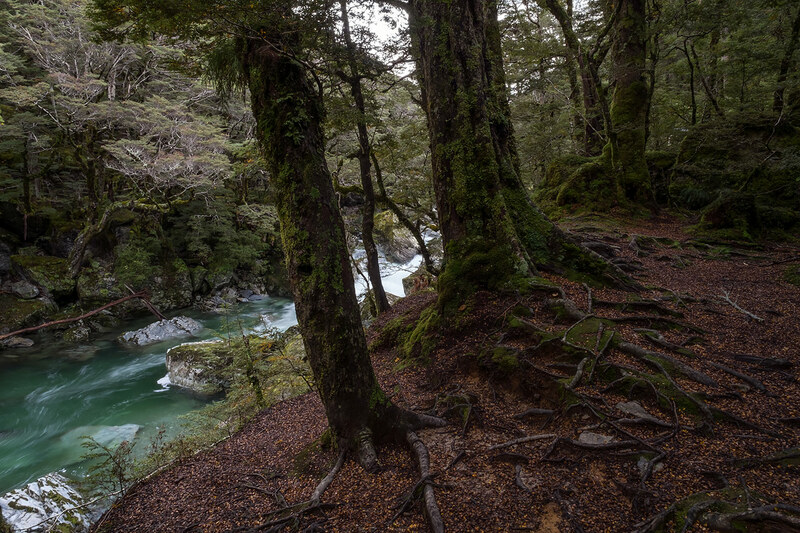 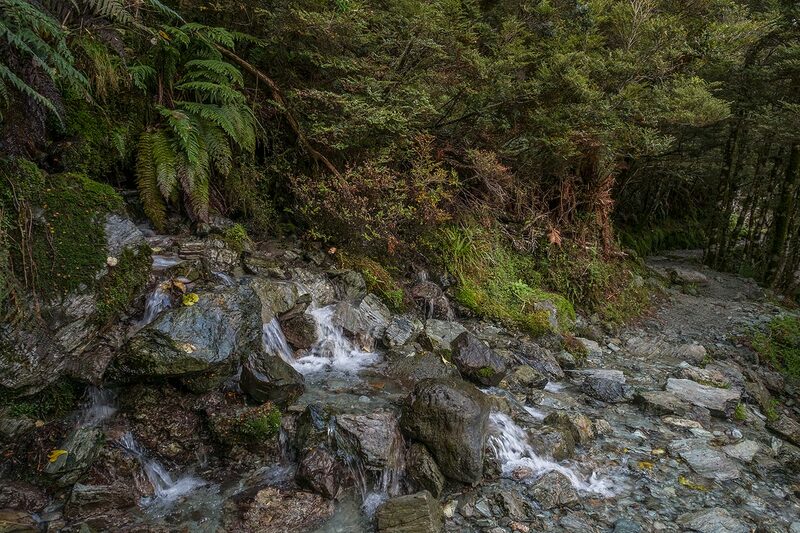 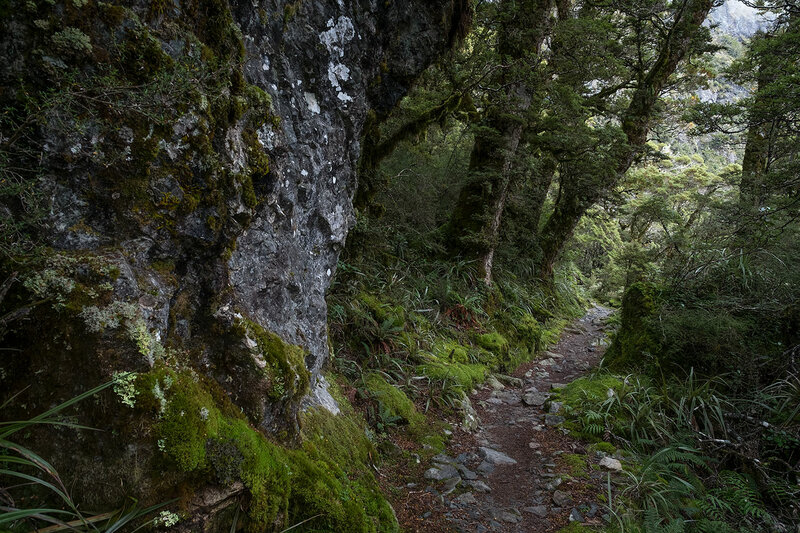 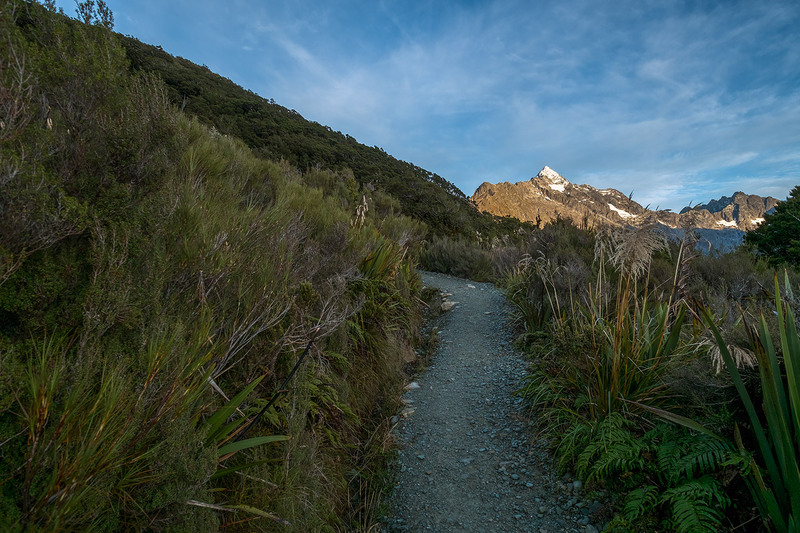 Most people walk the 32 km Routeburn Track in 3 days, staying at Routeburn Falls Hut and Lake Mackenzie Hut. 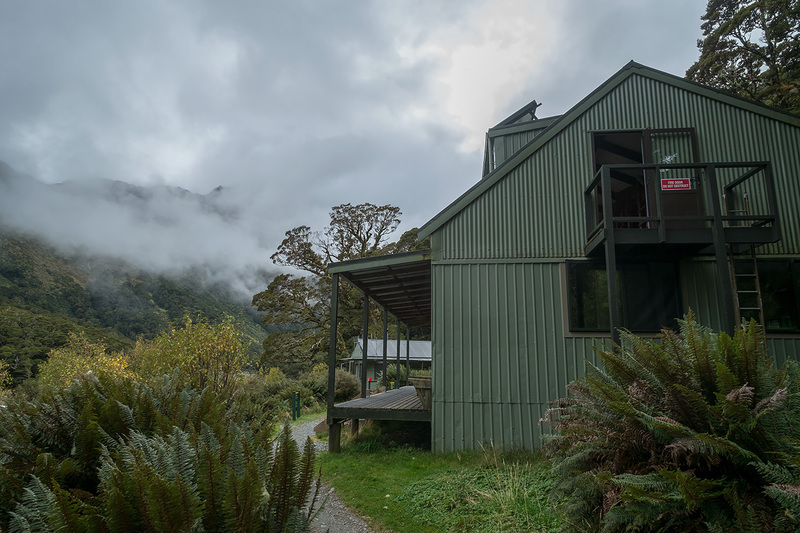 It is well worth staying another two nights at the quieter Routeburn Flats Hut and Lake Howden Hut. 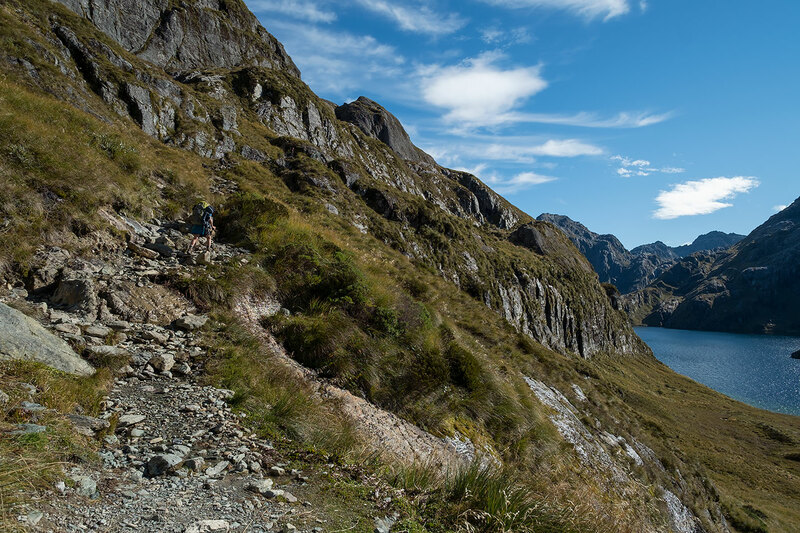 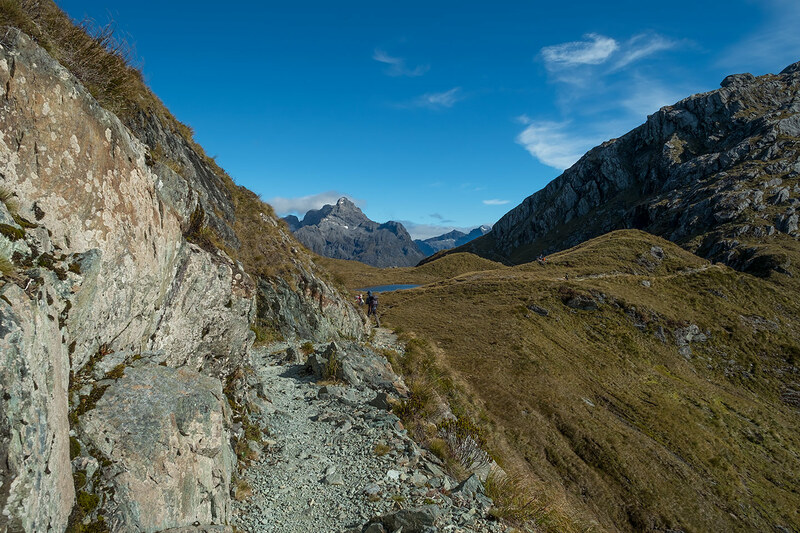 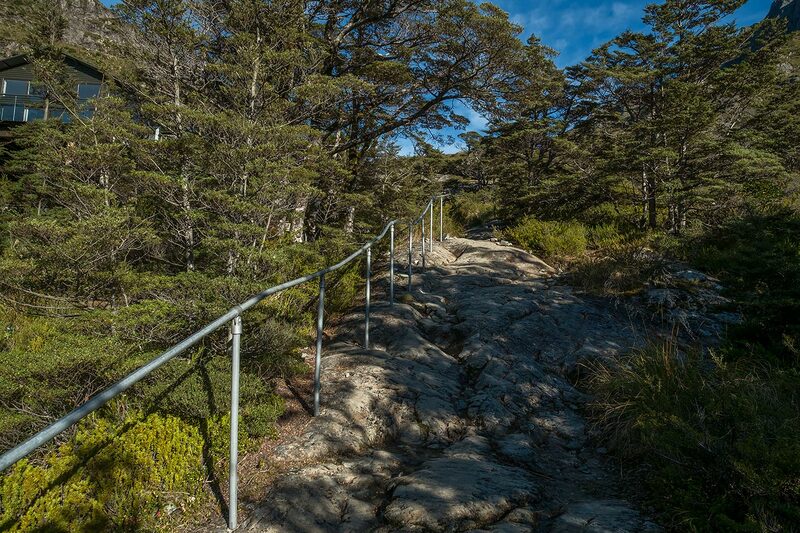 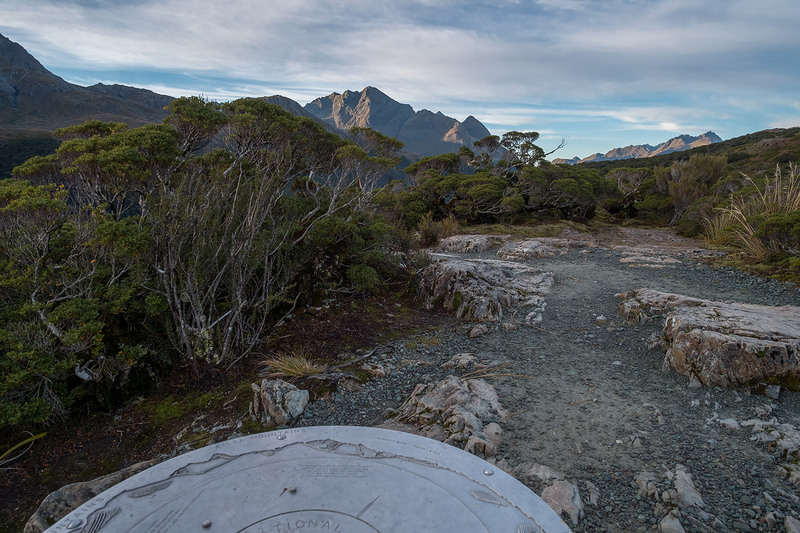 From the carpark at Routeburn Shelter to Routeburn Flats Hut is an easy 2 hr 30 min, 6.5 km. 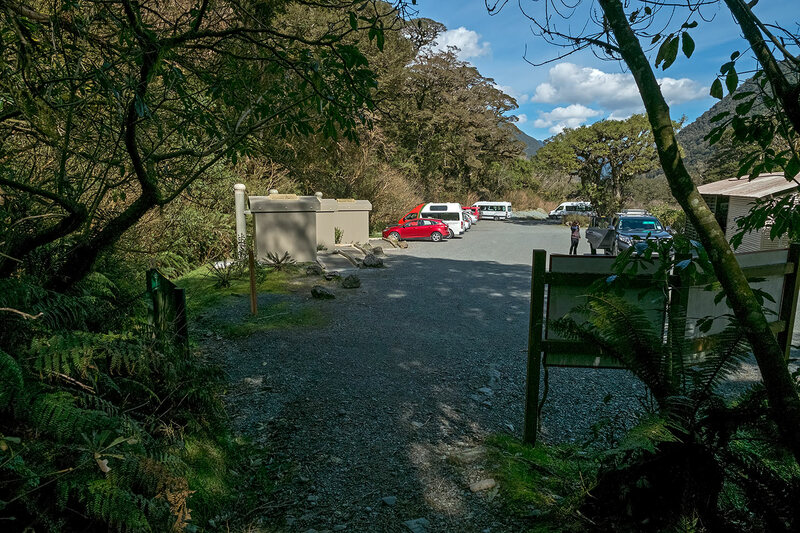 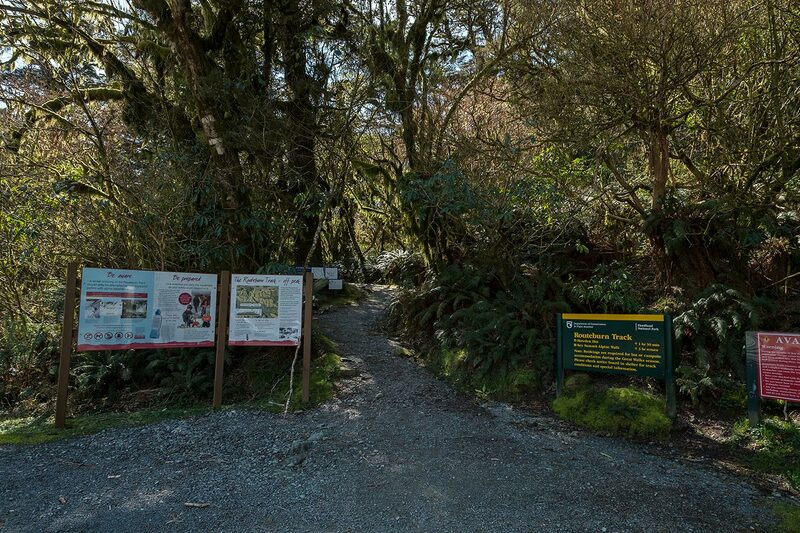 Routeburn Shelter is located next to the carpark at the end of the road. 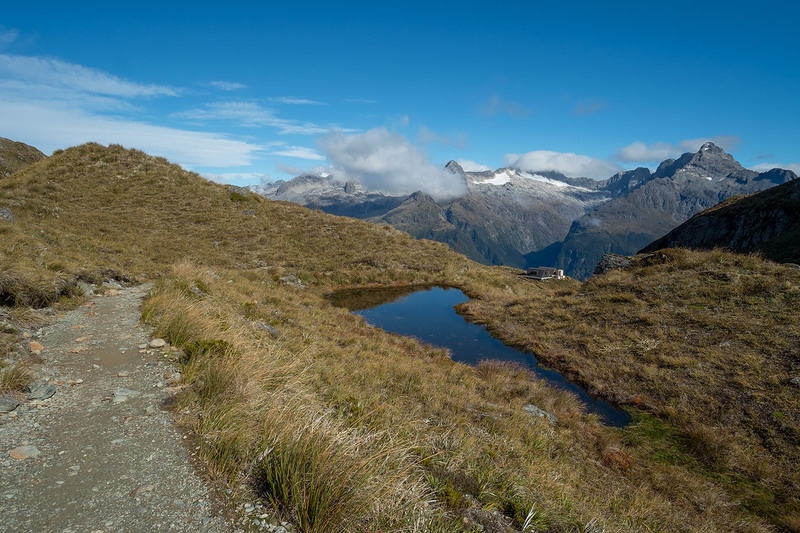 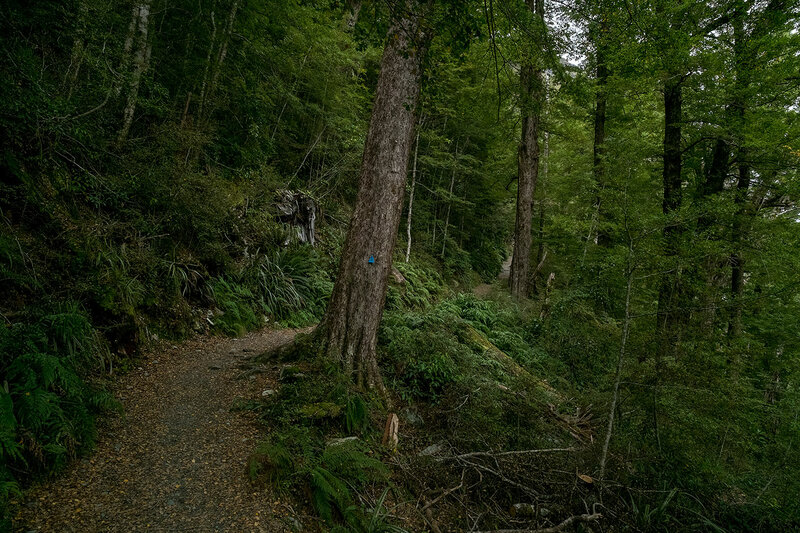 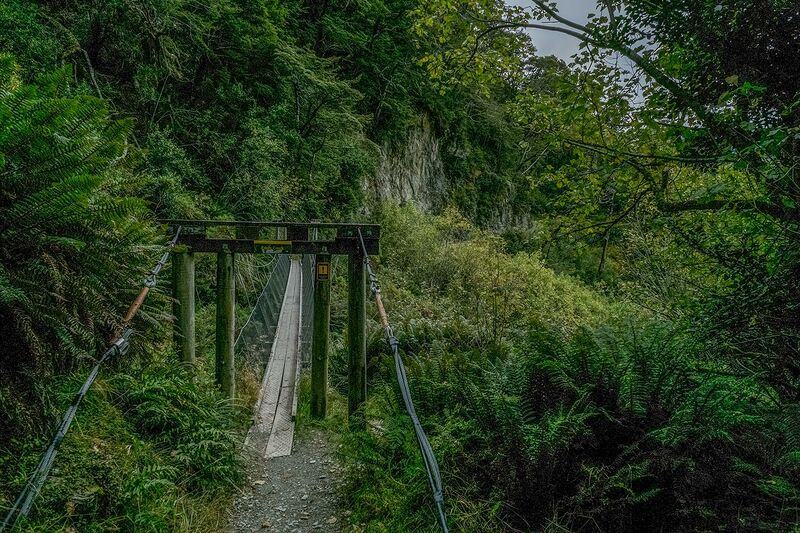 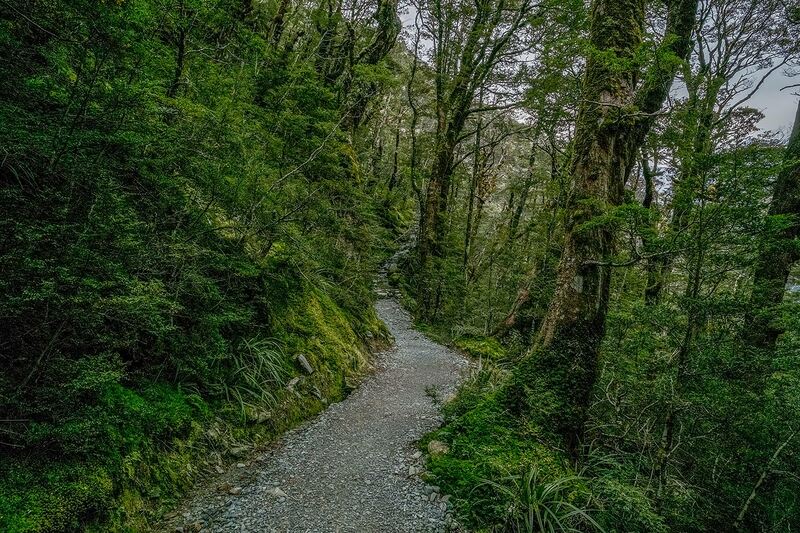 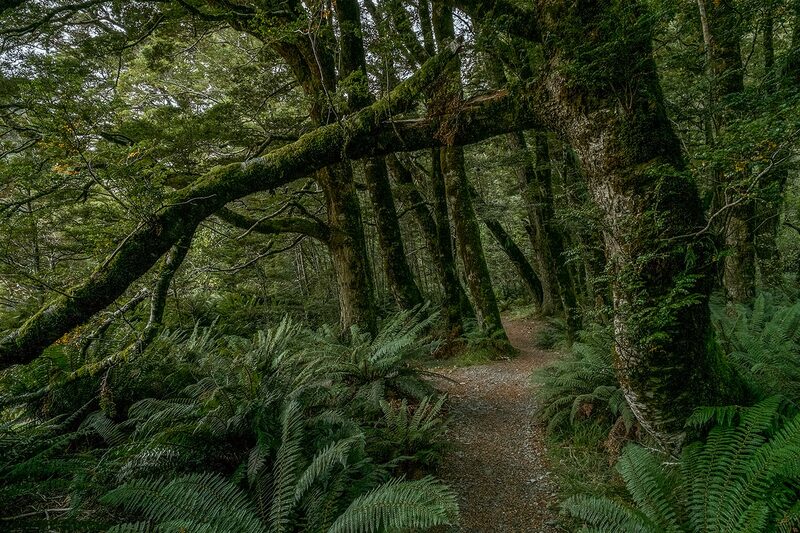 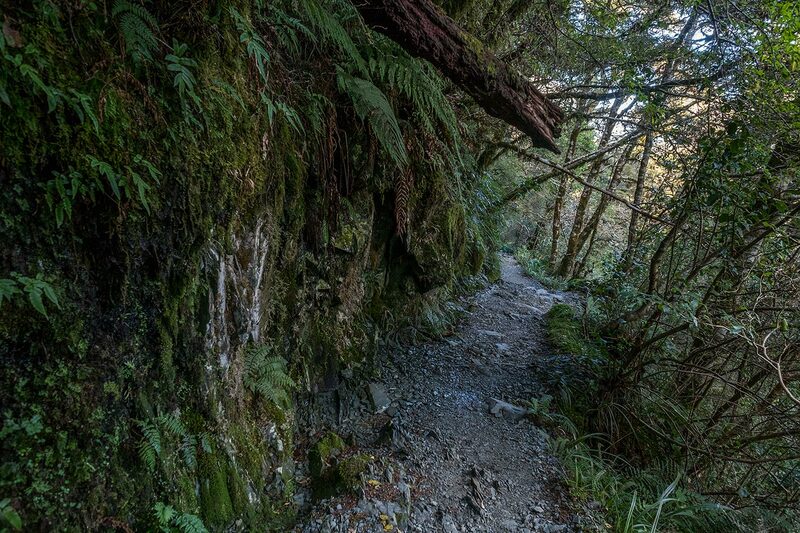 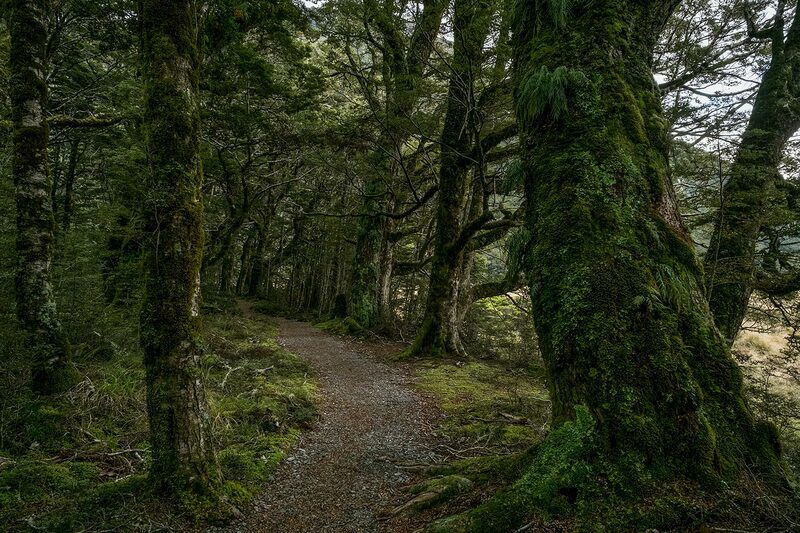 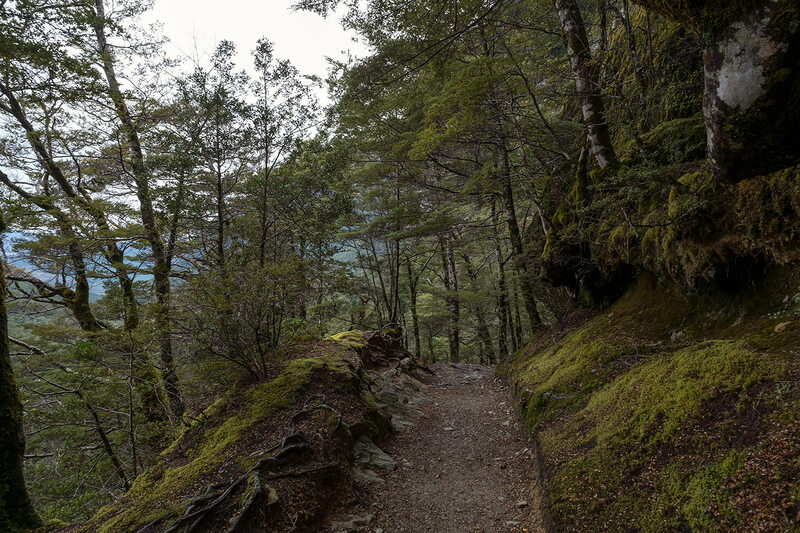 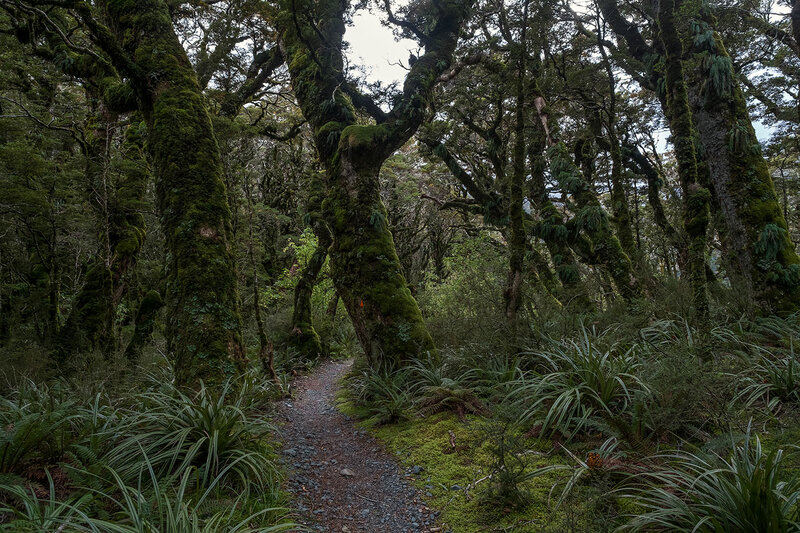 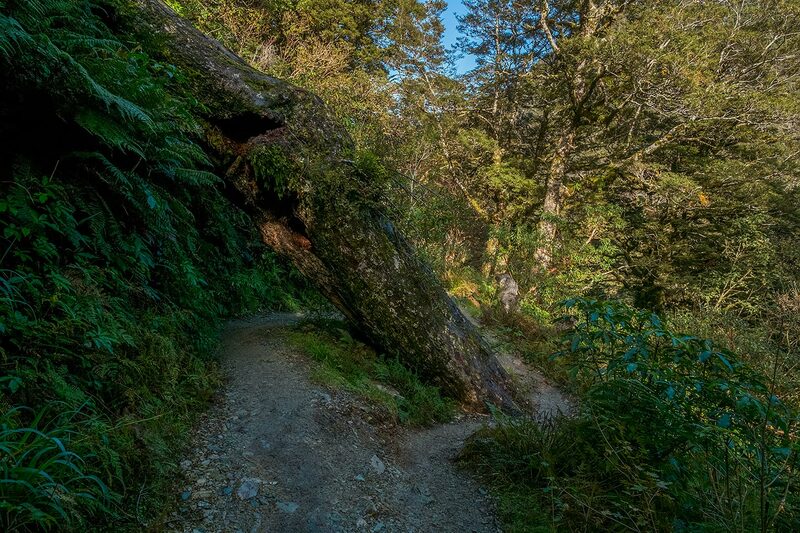 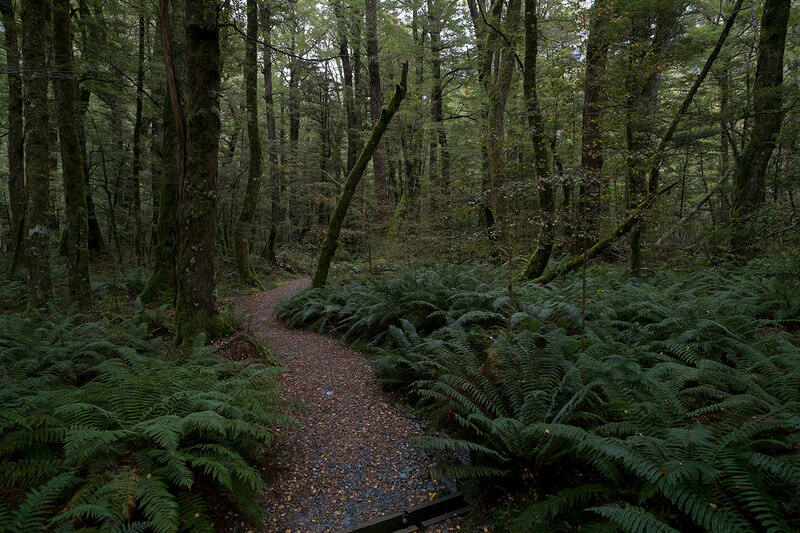 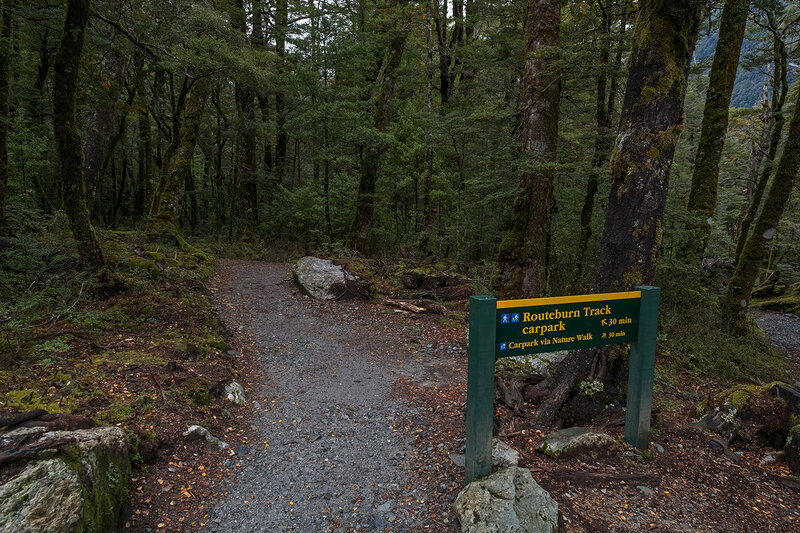 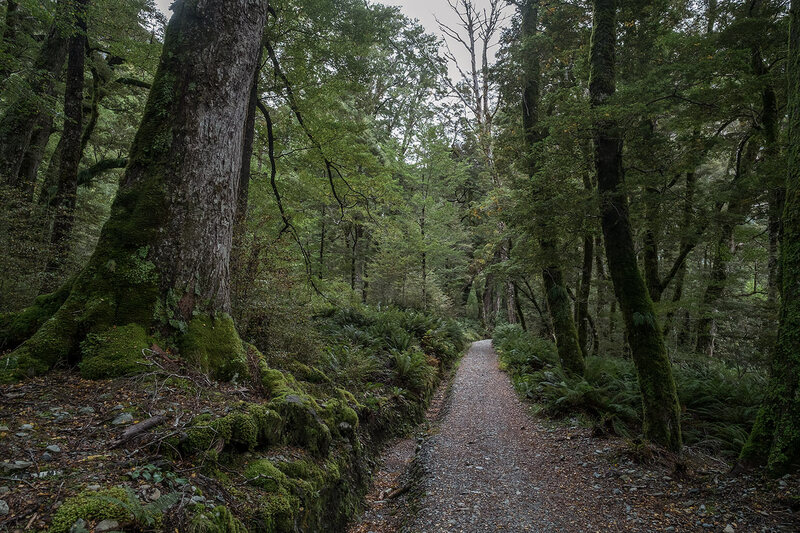 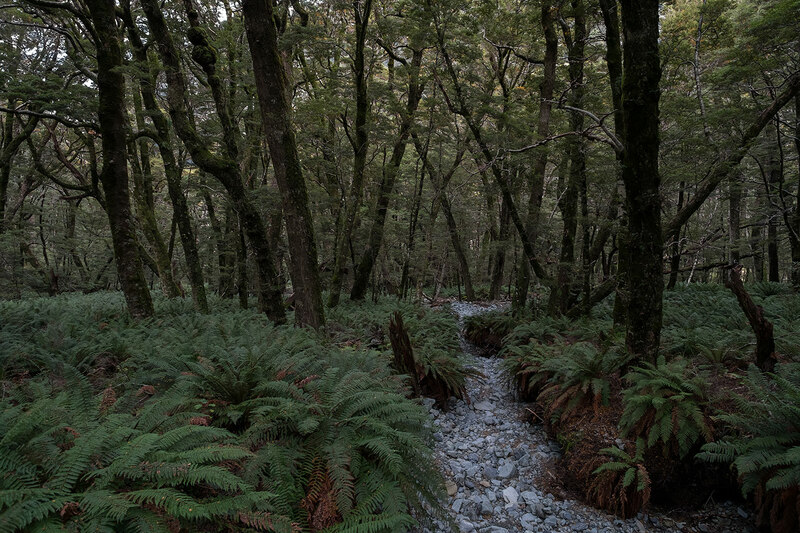 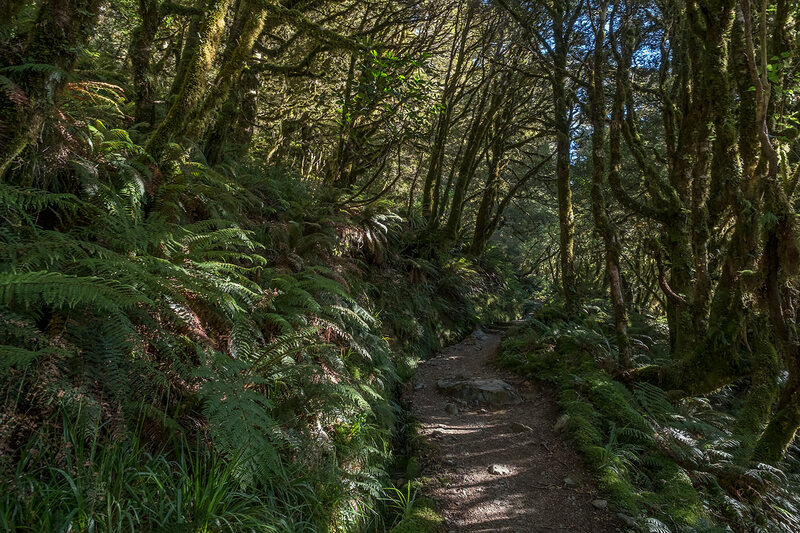 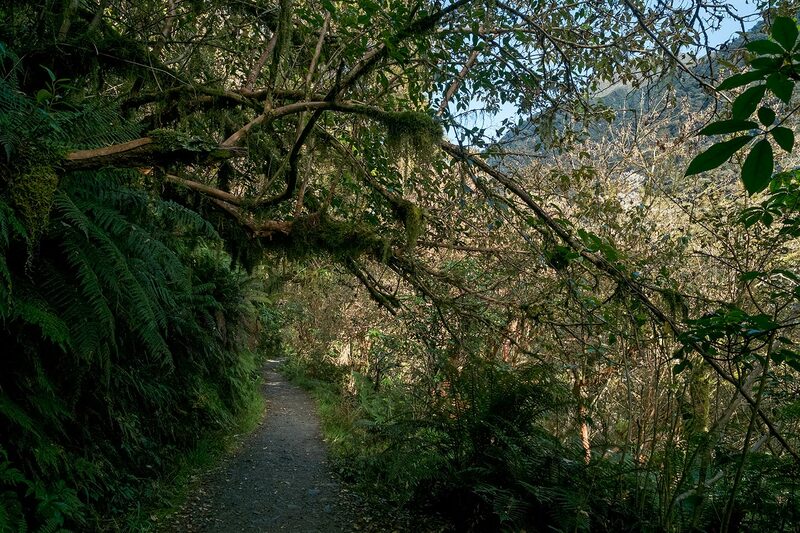 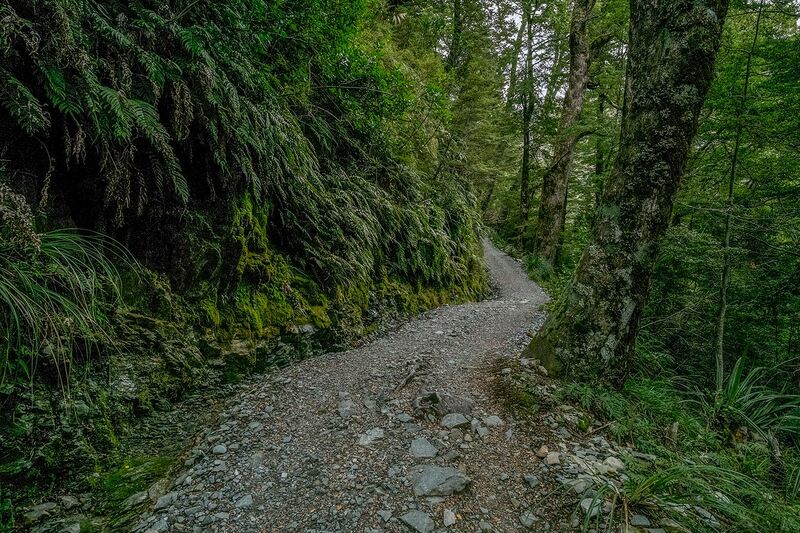 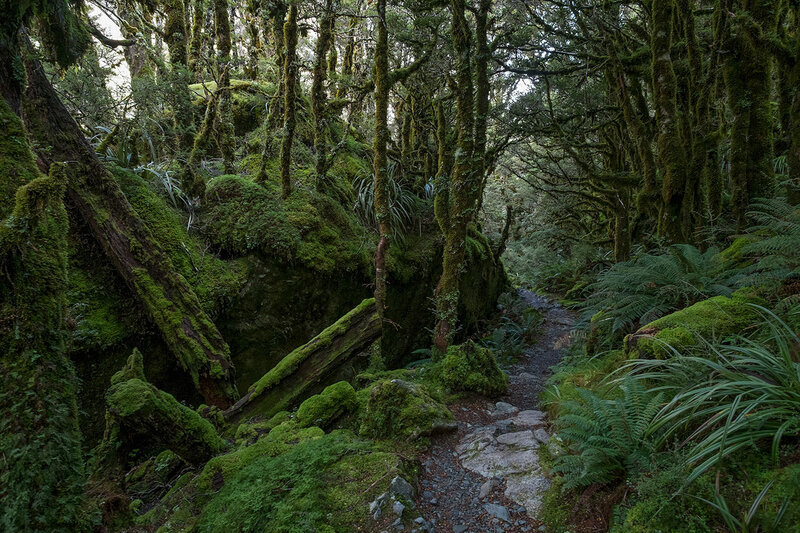 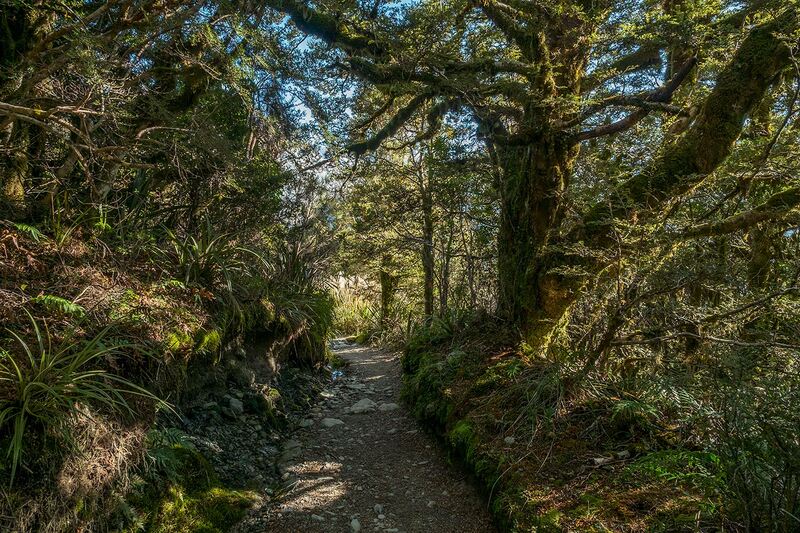 This end of the track is in Mount Aspiring National Park. 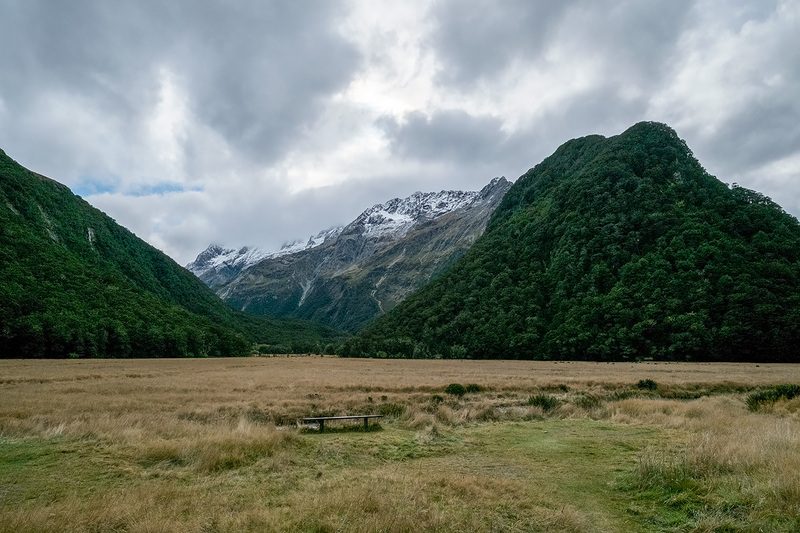 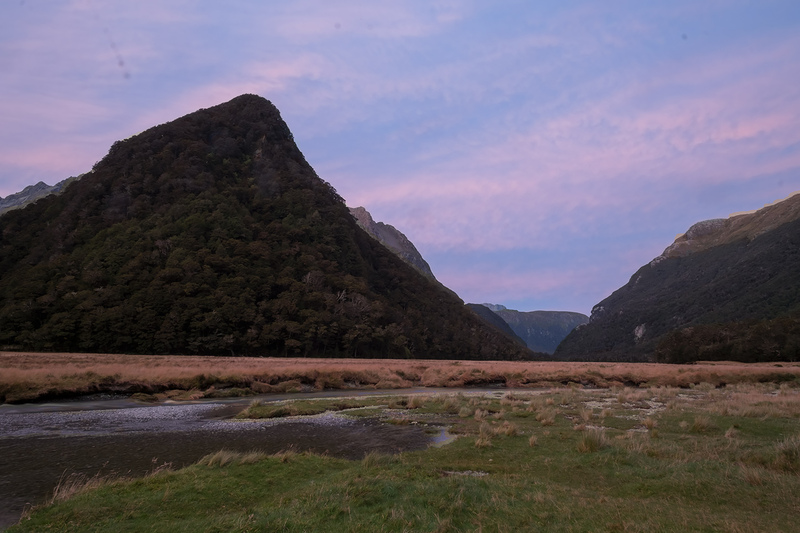 The other end is in Fiordland National Park. 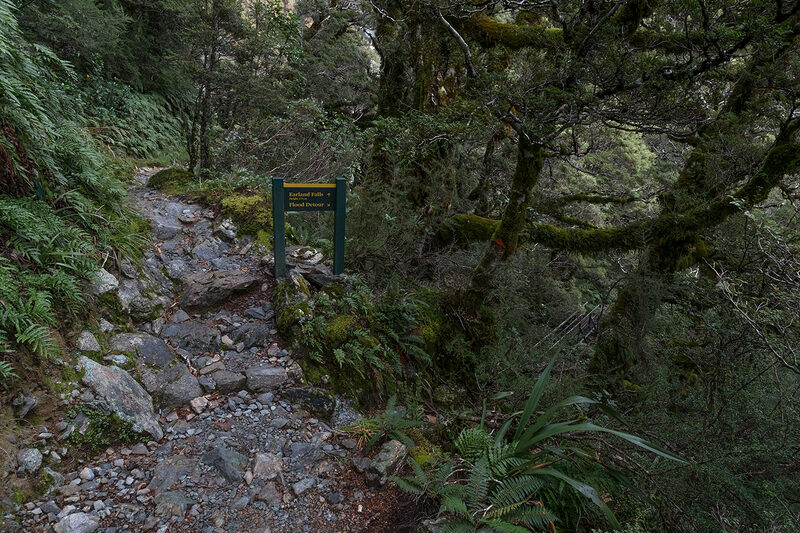 The start of the Routeburn Track. 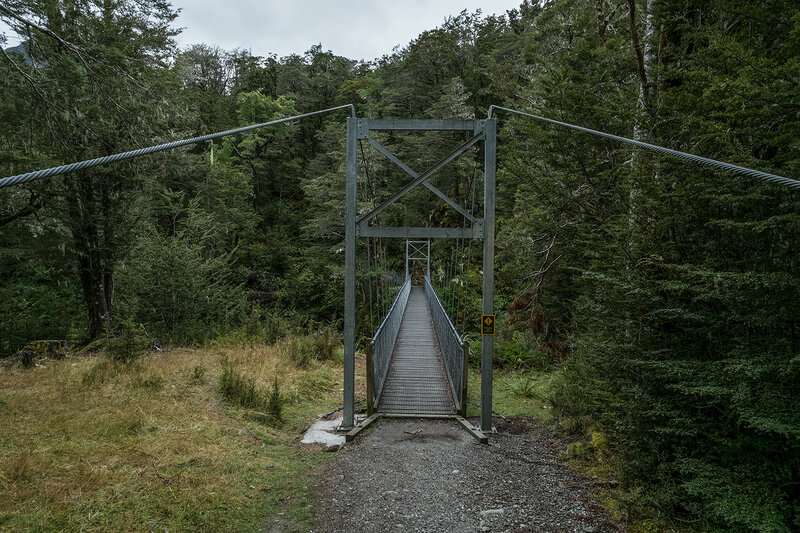 Swingbridge over the Route Burn (river). 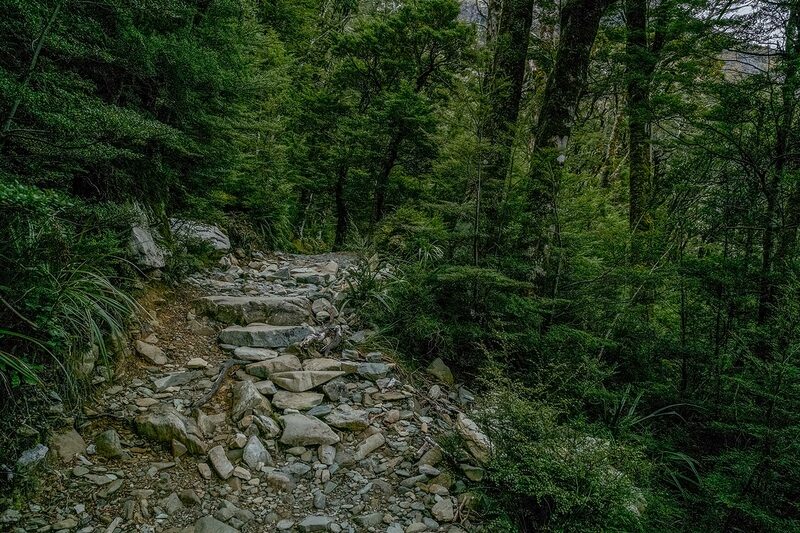 Immediately, it becomes obvious... 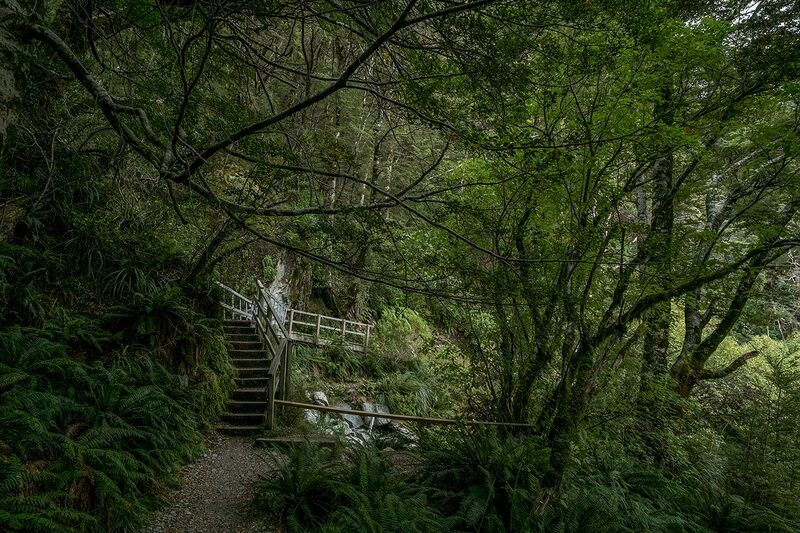 This walk is going to be gob-smackingly beautiful. 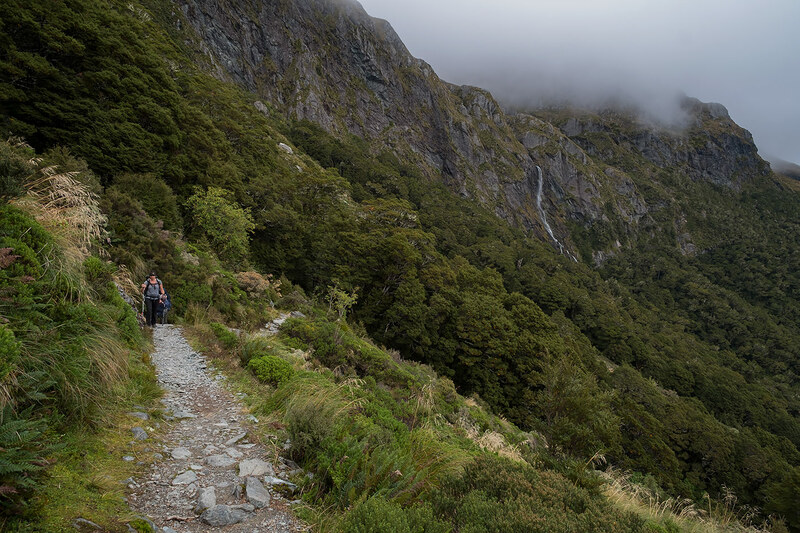 After only a few minutes, it is clearly in another league to all the other Great Walks we have done so far. 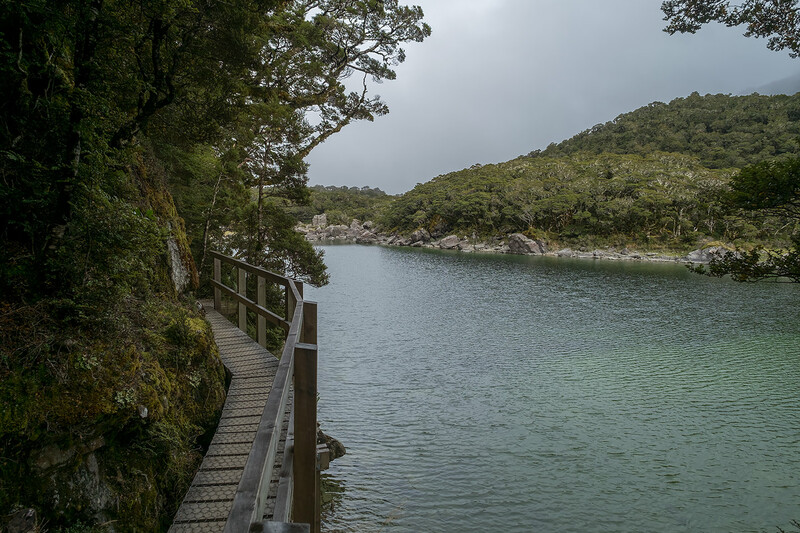 (At this point, we had yet to do the Kepler, Milford, Rakiura and the Whanganui River Journey). 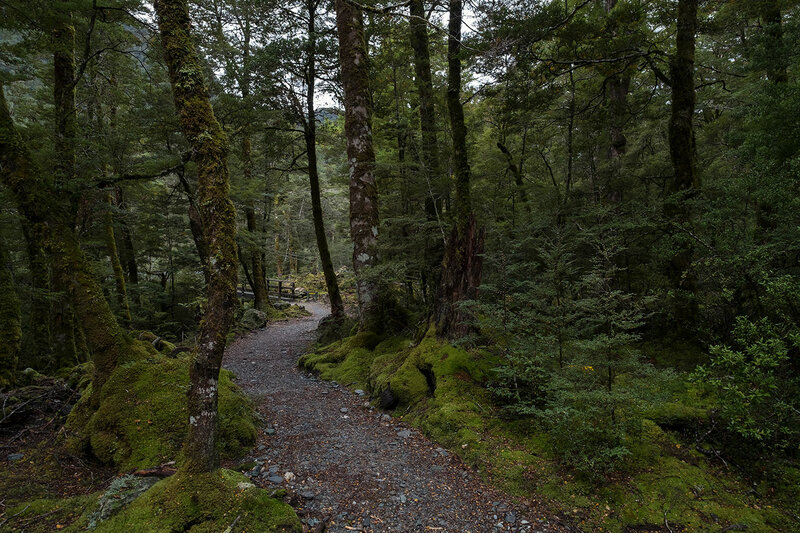 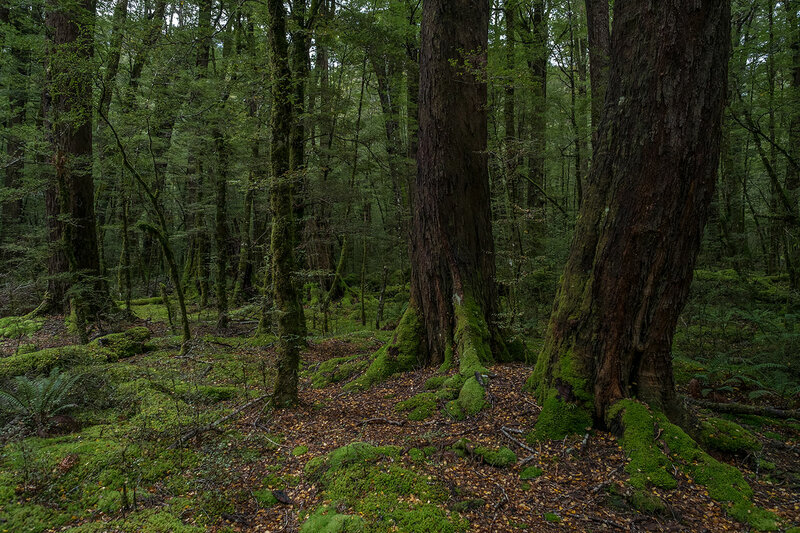 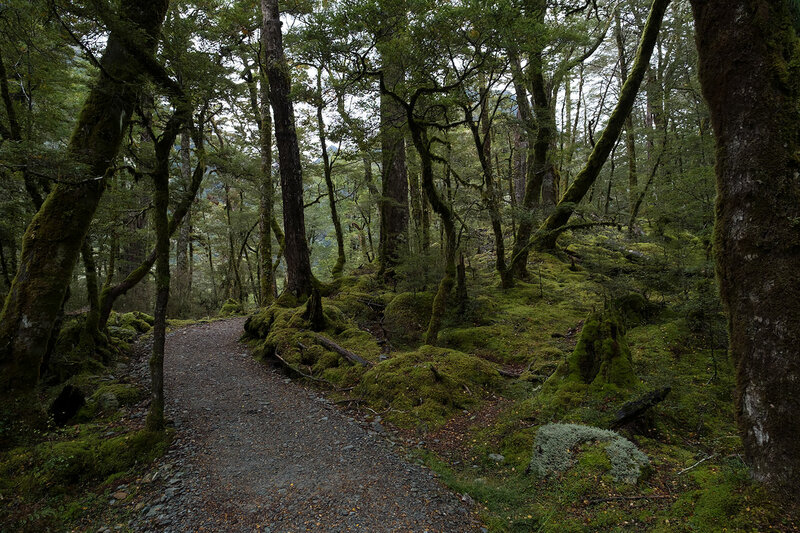 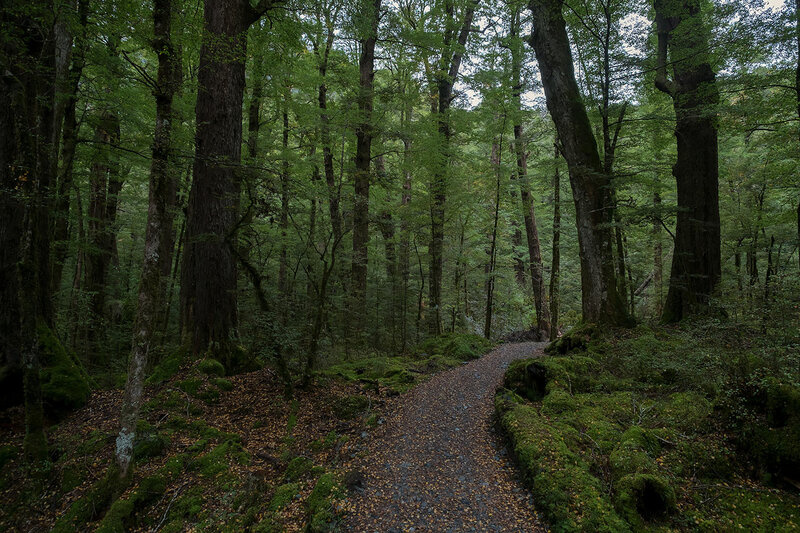 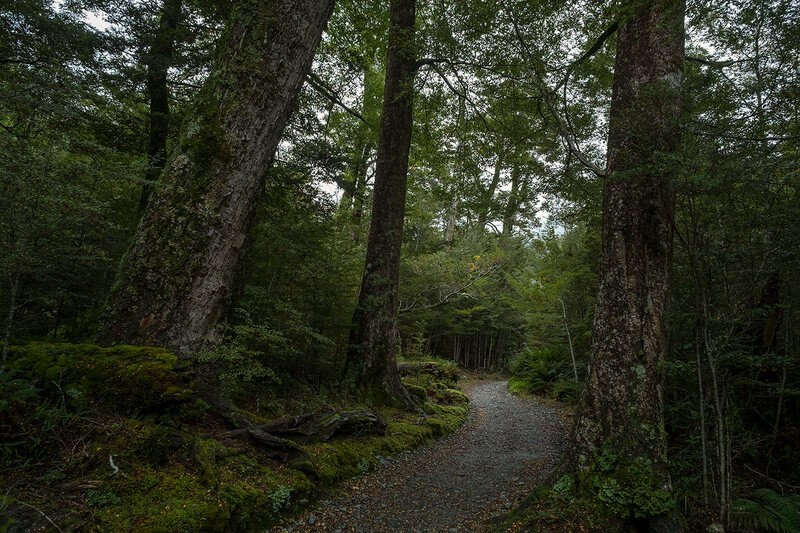 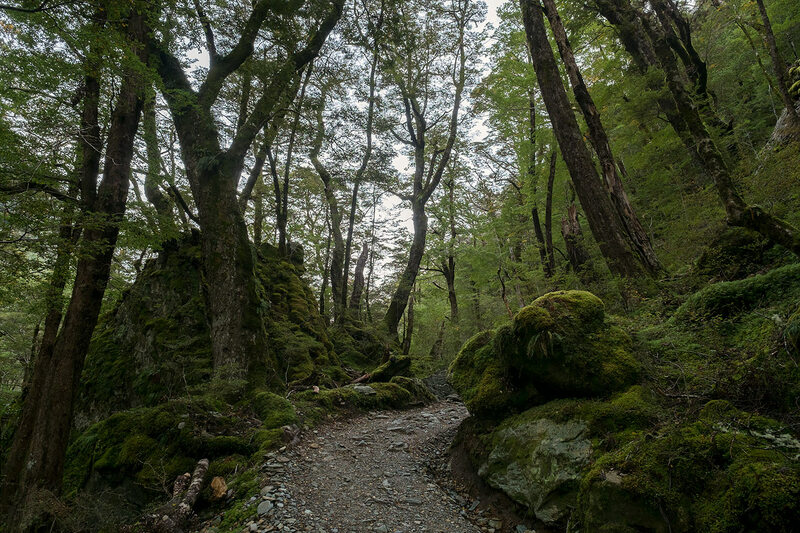 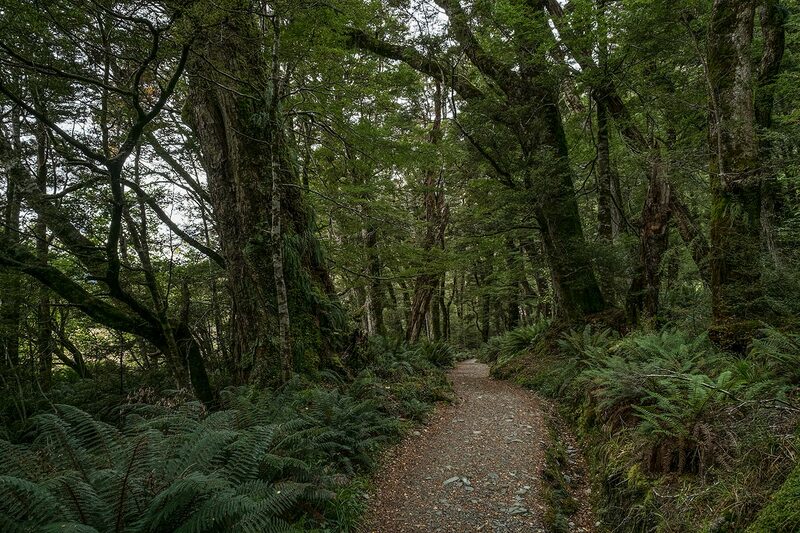 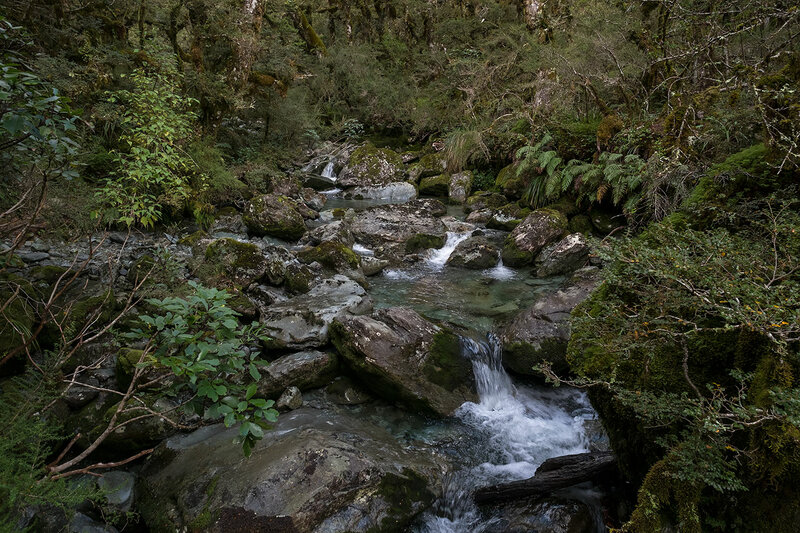 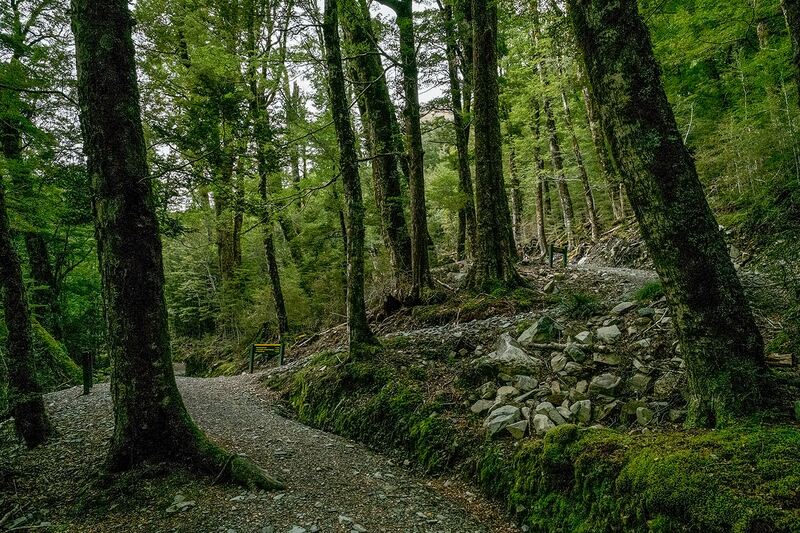 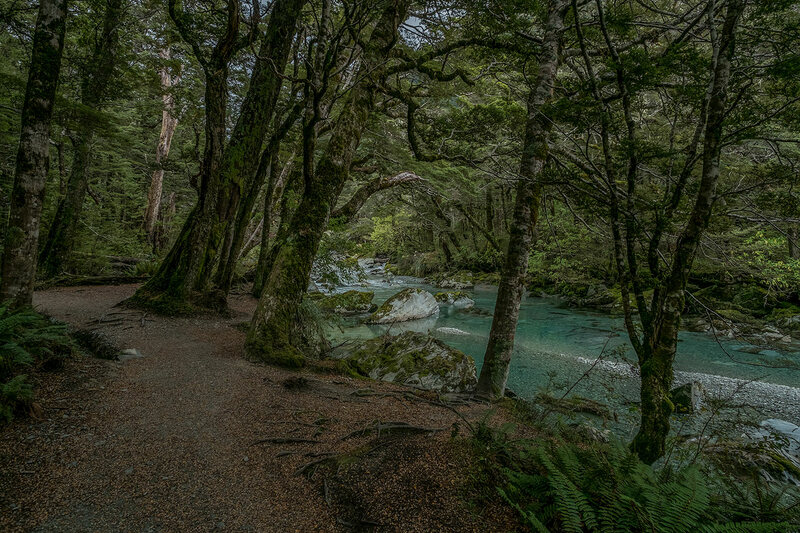 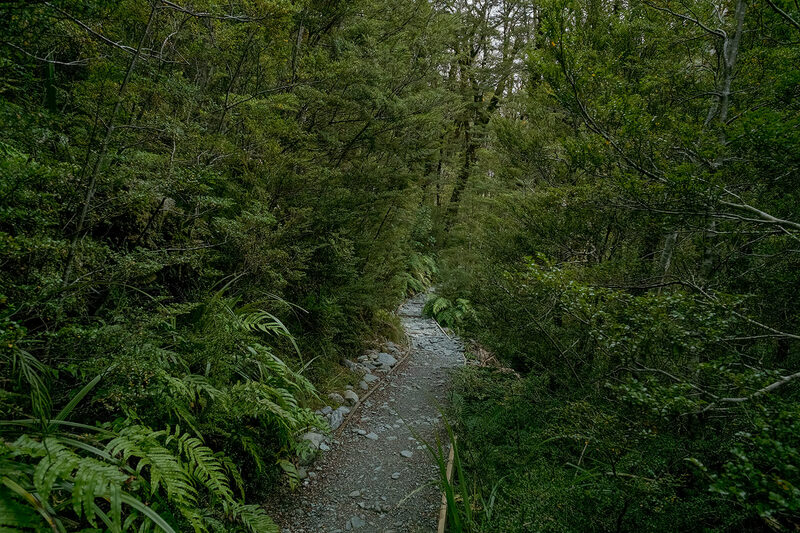 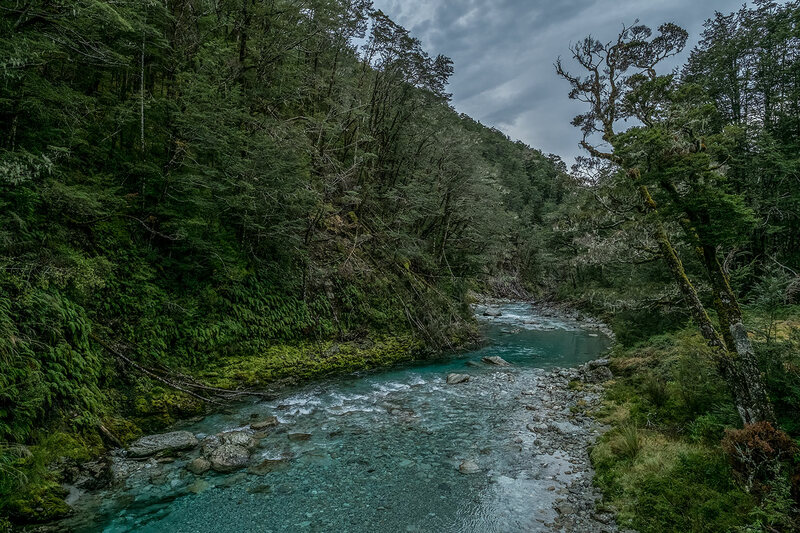 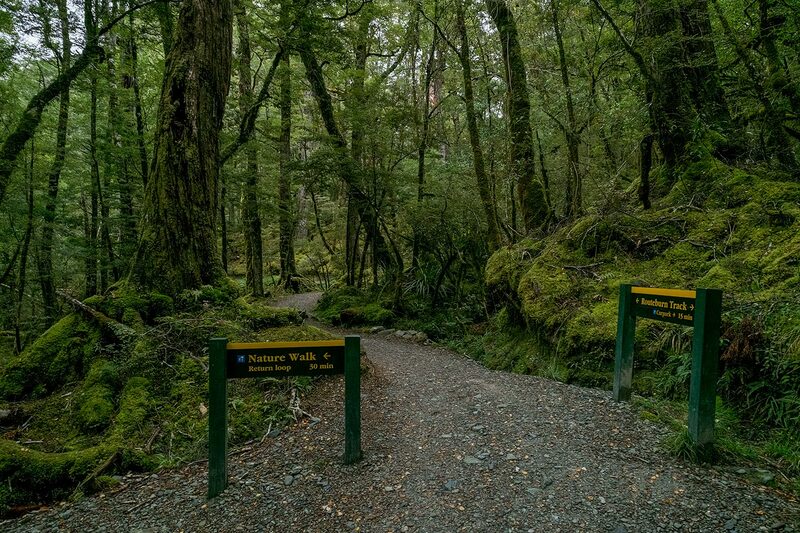 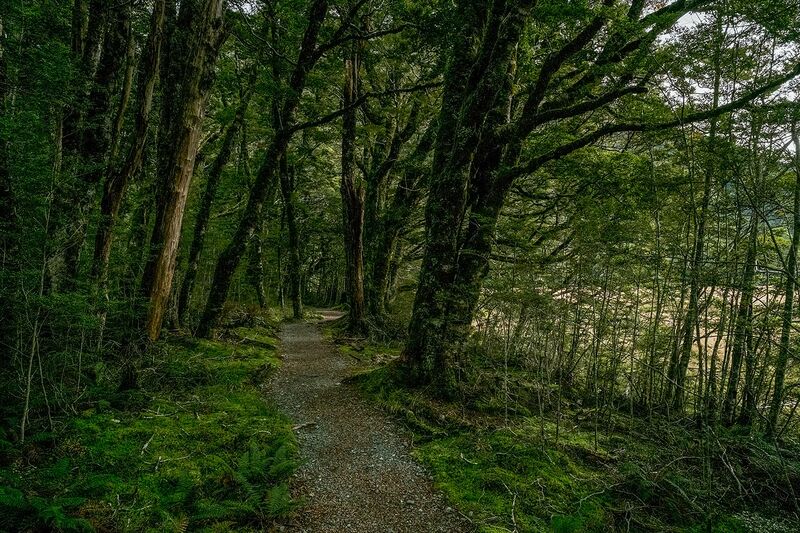 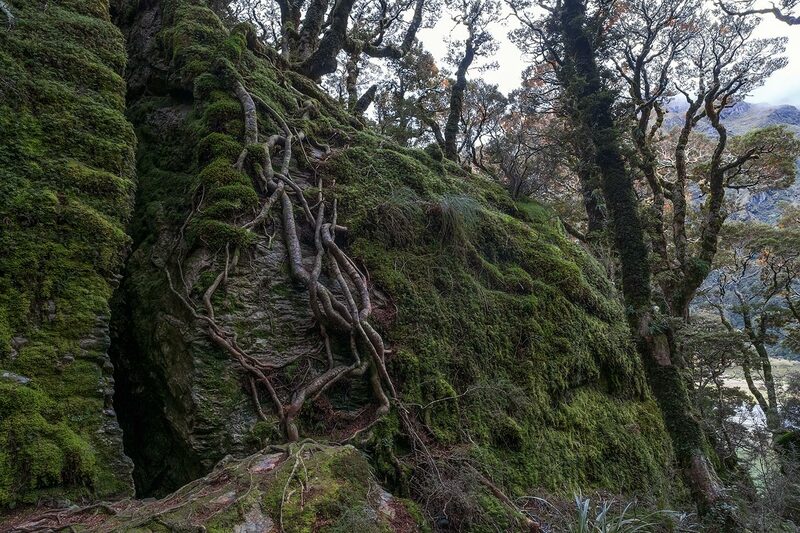 Routeburn Nature Walk. 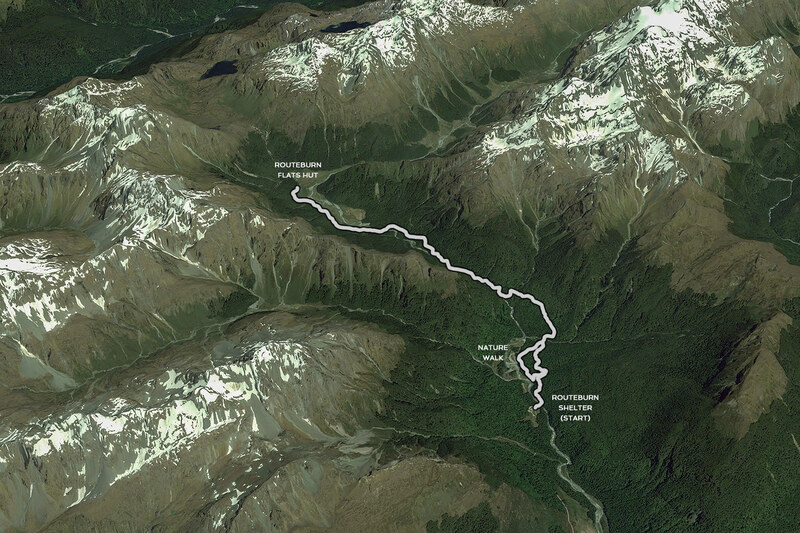 Here we are - back at the main track. 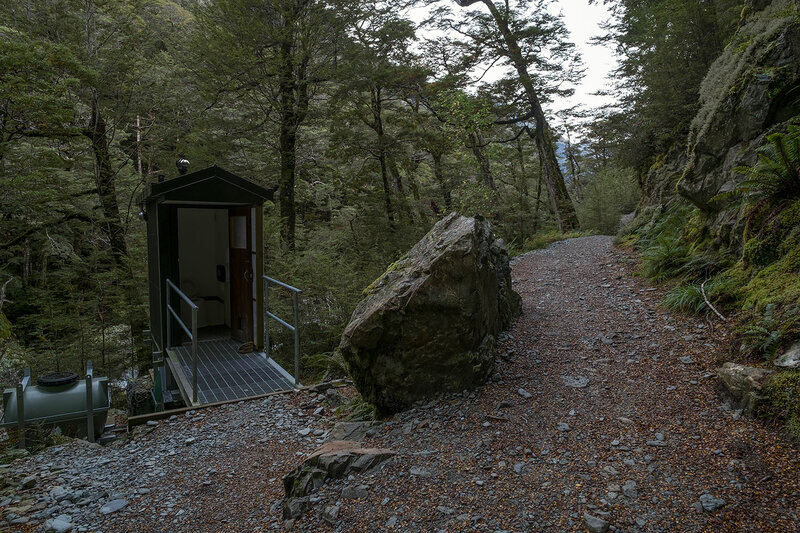 A toilet in the middle of nowhere. 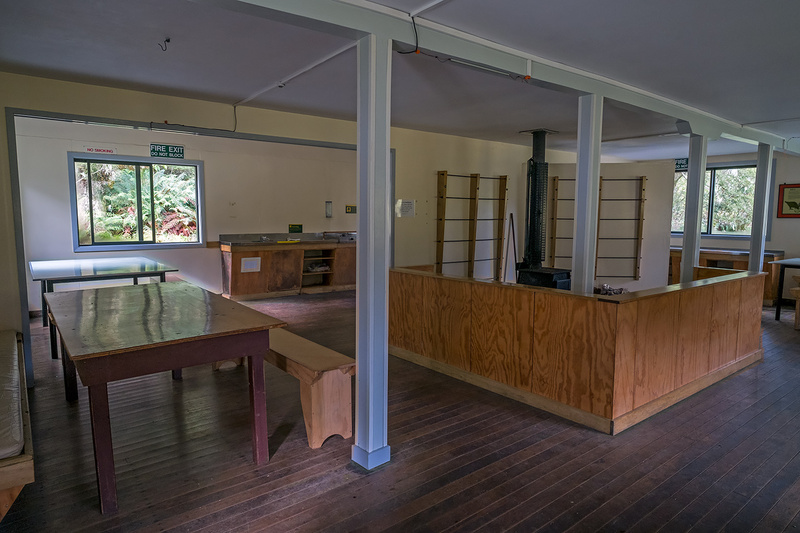 This is the turnoff to Forge Flat. 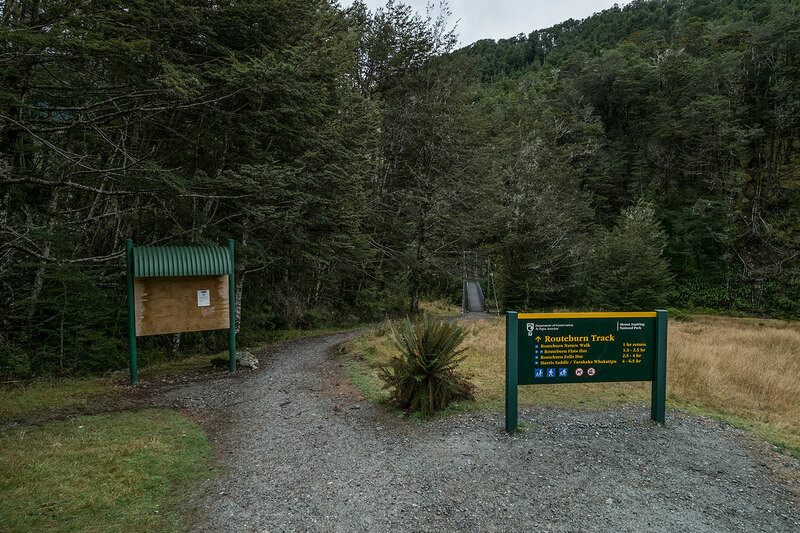 It's only 2 minutes. 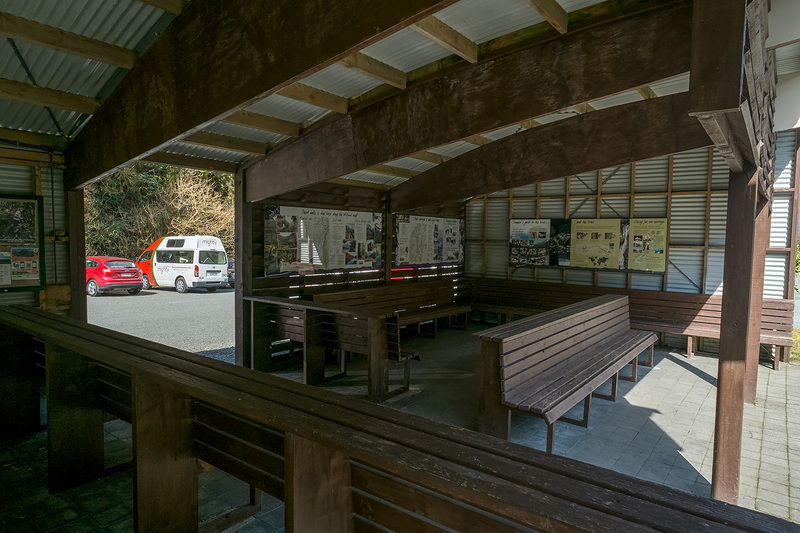 Let's check it out. 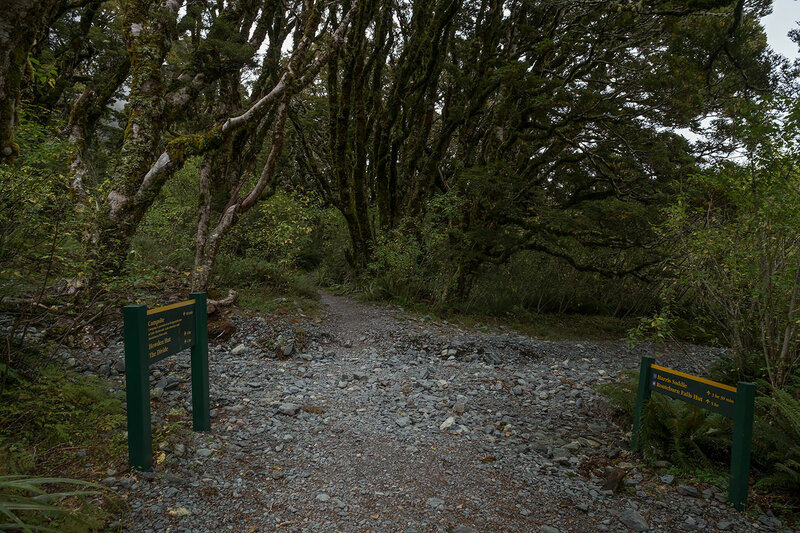 Forge Flat was the site of an old blacksmith camp while the Route Burn bridle path was being made. 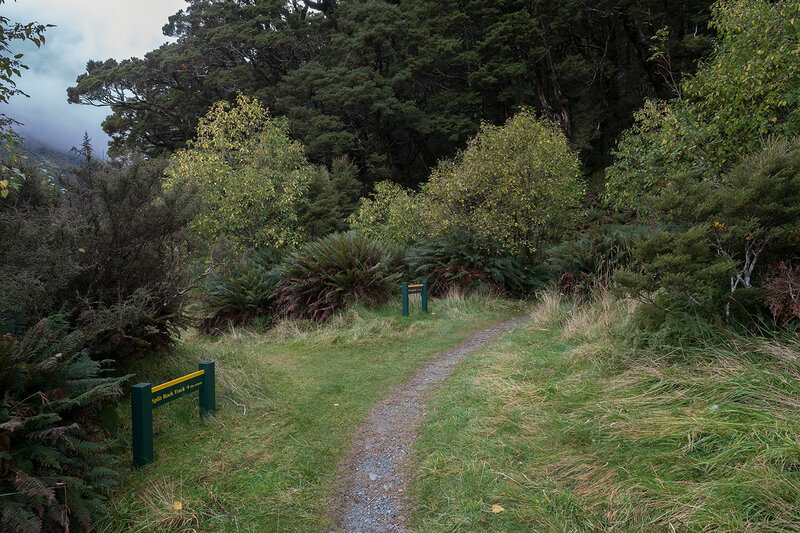 A short path leads down to the Route Burn (river). 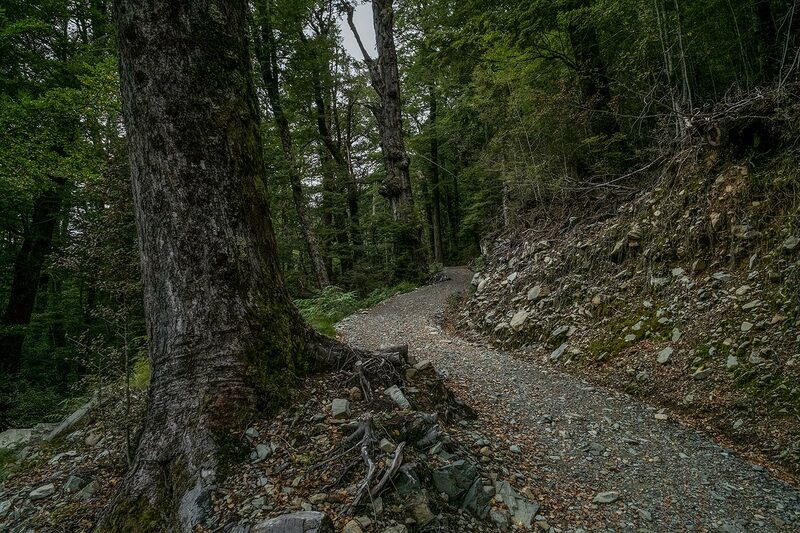 Back on the main track, it really is remarkable how much effort DOC has gone to, to make this track an easy and civilised walk. 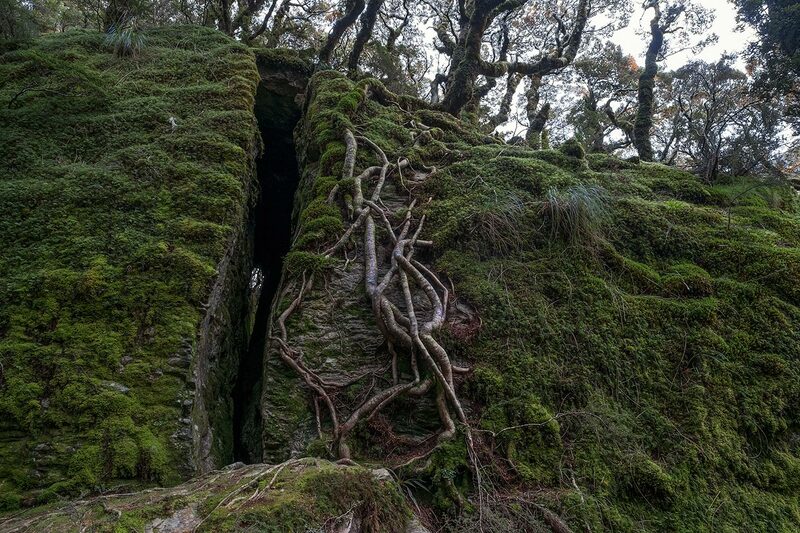 Wow... 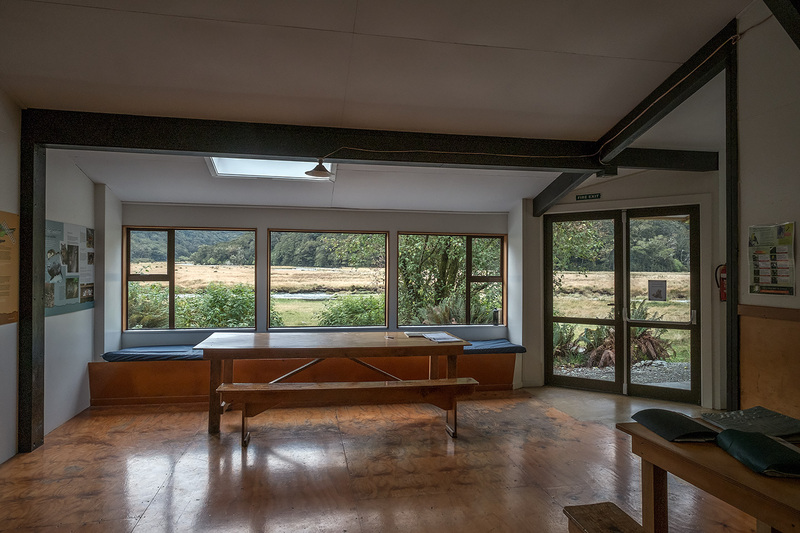 This is a nice bit. 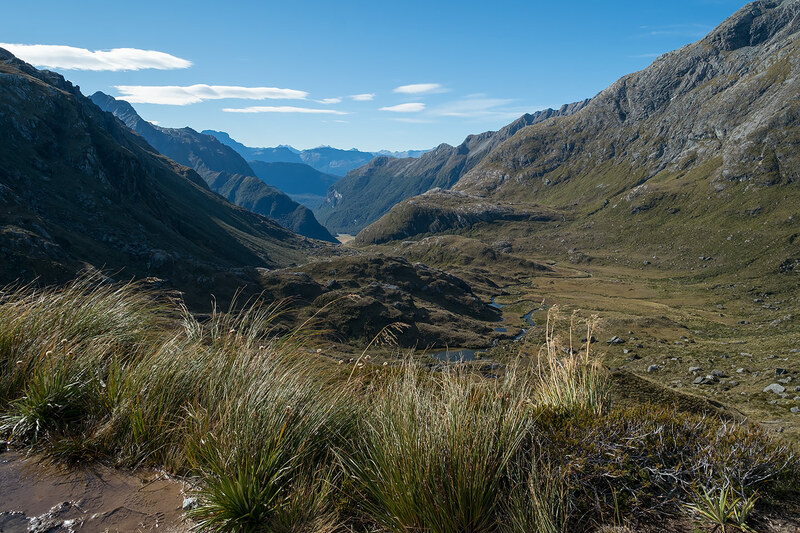 The Routeburn is just so gorgeous.. 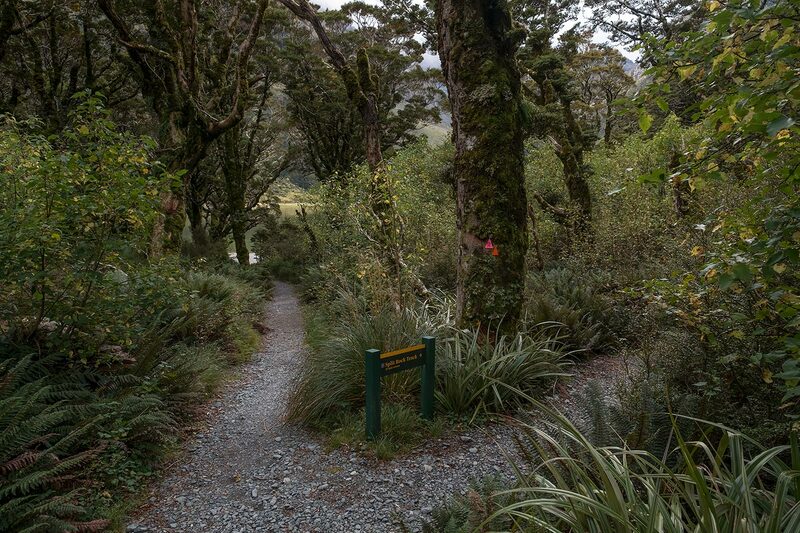 Here we are at the start of the Routeburn Flats. 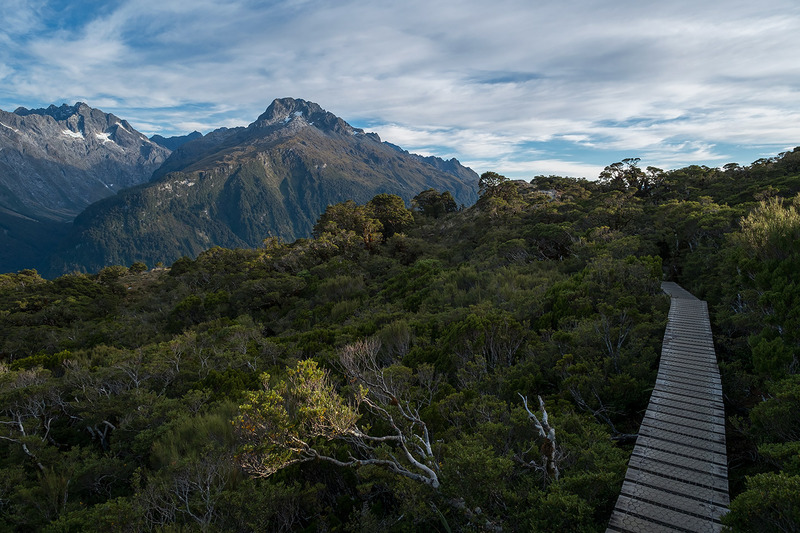 At this point, we take the right hand track and head to Routeburn Flats Hut - our home for the night. 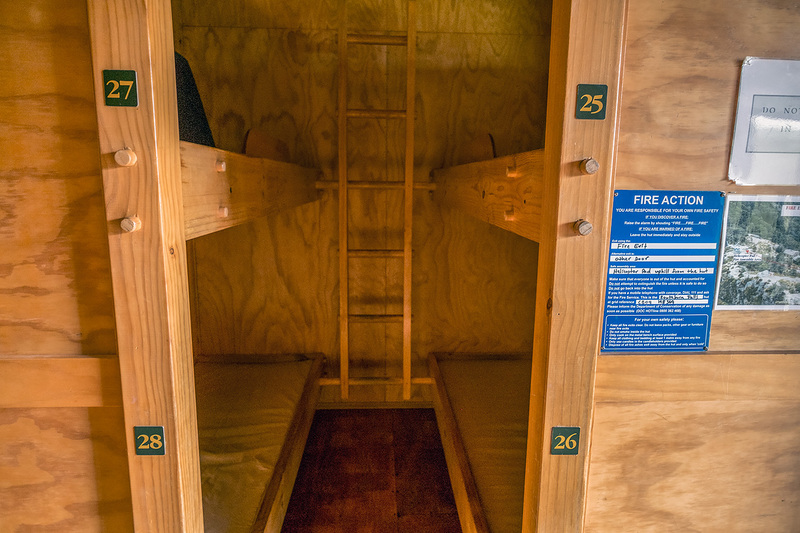 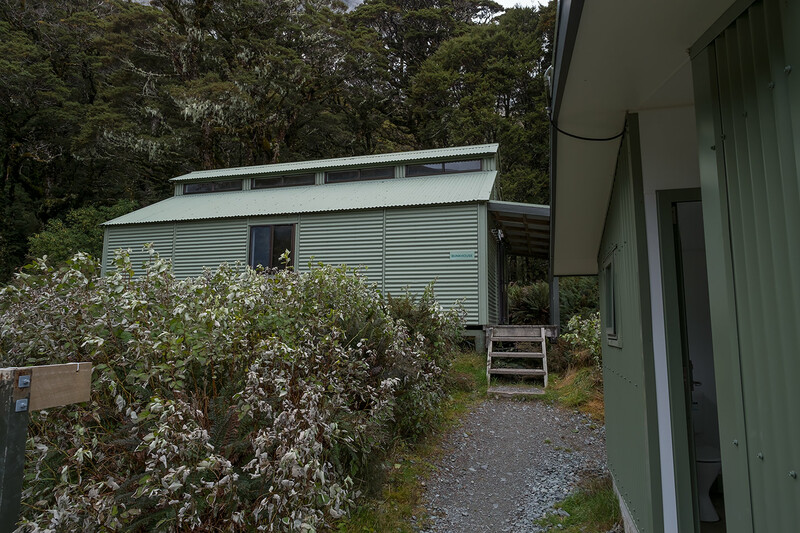 ROUTEBURN FLATS HUT - 20 bunk beds, gas cooking (during Great Walks season), heating, lighting, mattresses. 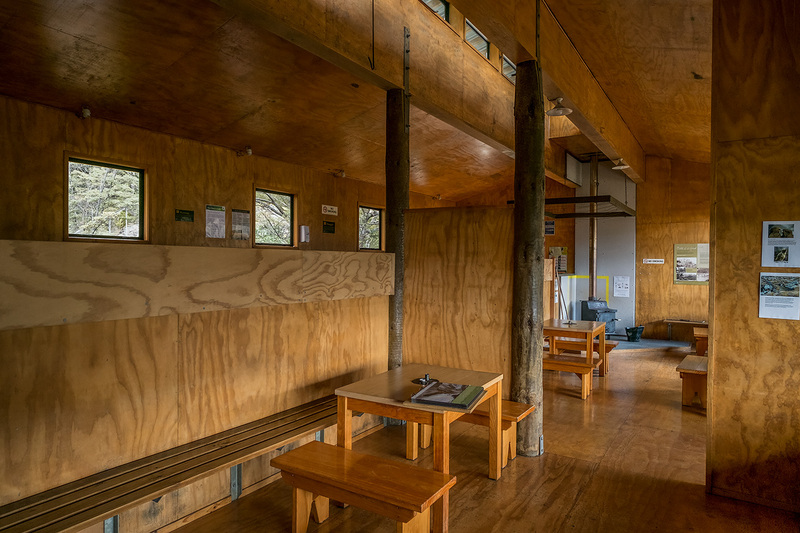 ROUTEBURN FLATS HUT - Outside Covered Area. 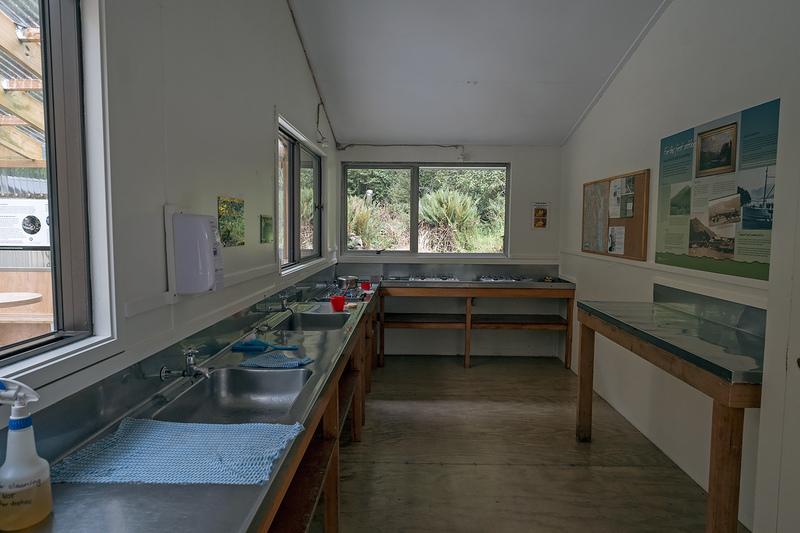 ROUTEBURN FLATS HUT - Kitchen. 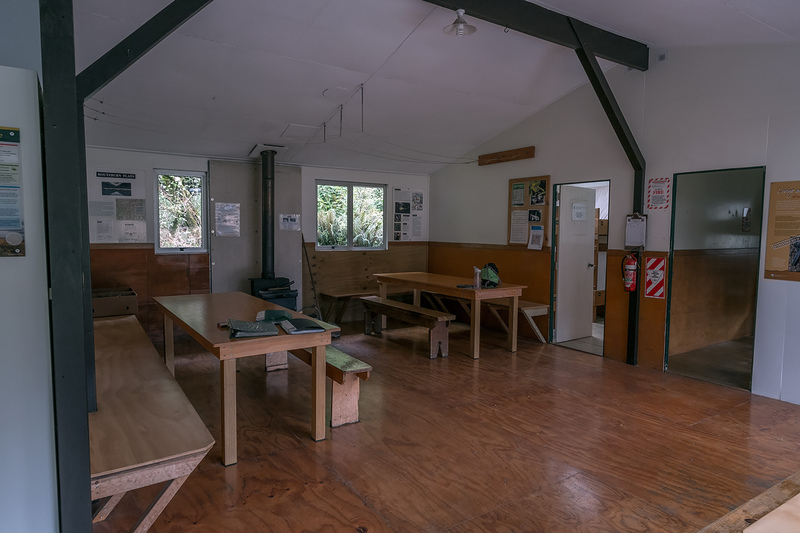 ROUTEBURN FLATS HUT - Dining Area. 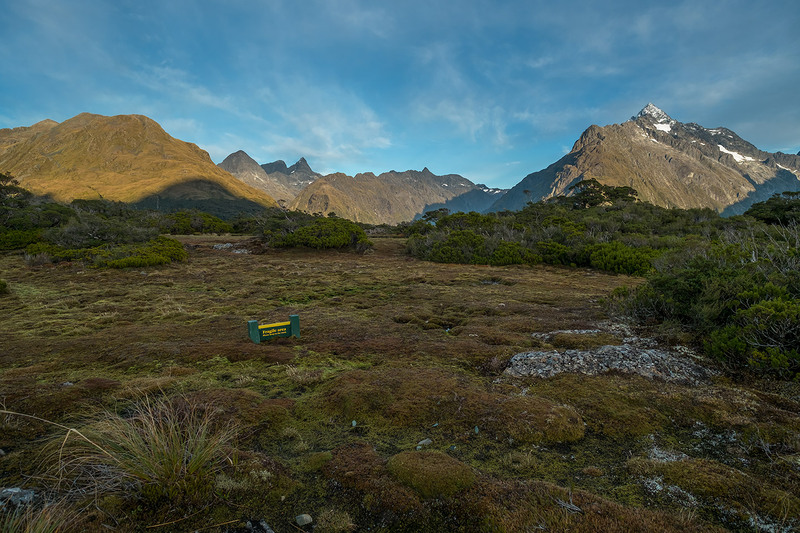 ROUTEBURN FLATS HUT - View from Dining Area towards Routeburn Flats. 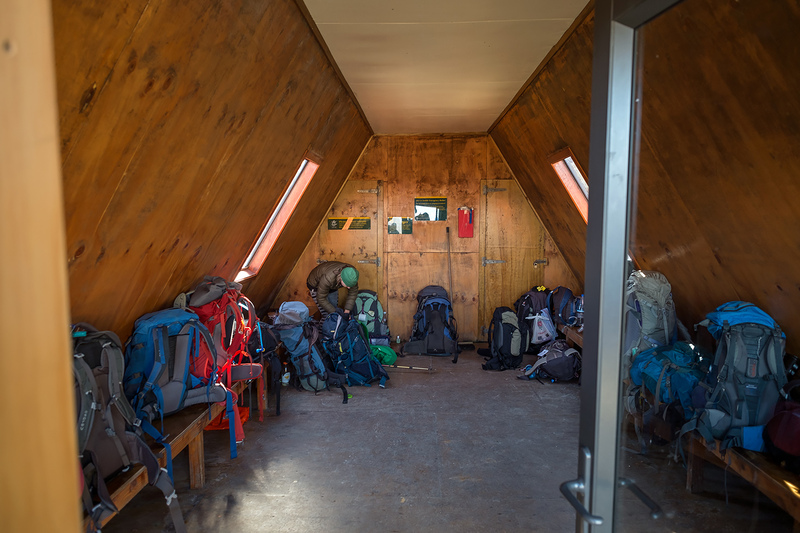 ROUTEBURN FLATS HUT - Back Bunkroom. 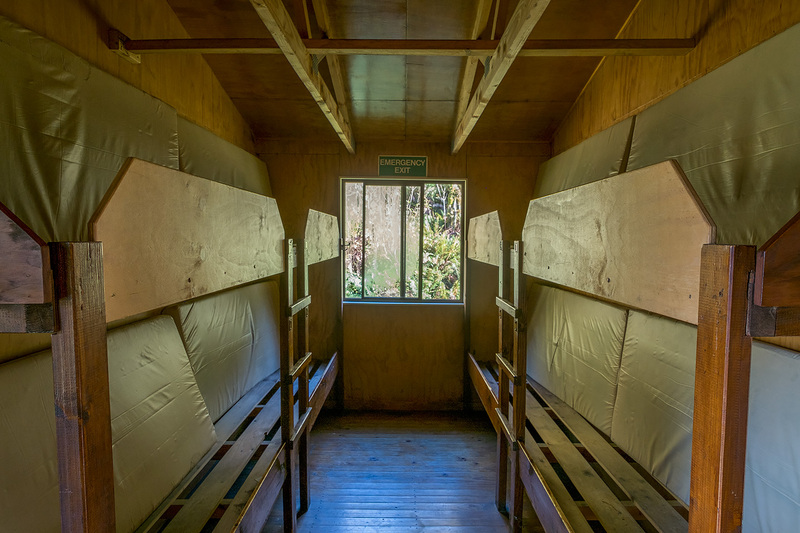 ROUTEBURN FLATS HUT - Front Bunkroom. 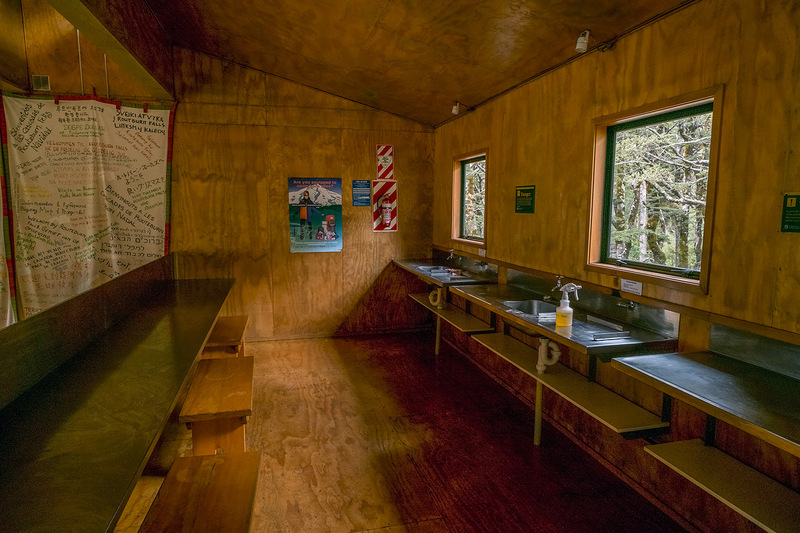 ROUTEBURN FLATS HUT - Toilets. 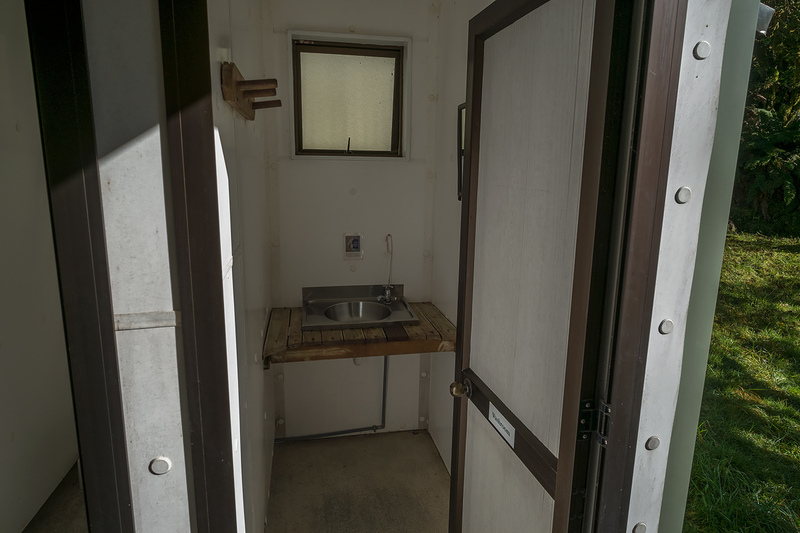 The end door (the closed one) leads to a small room with just a handbasin. 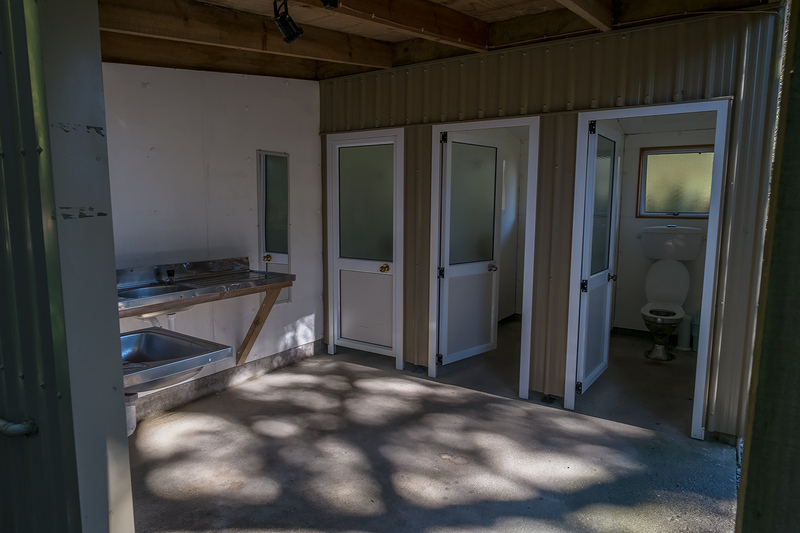 This means we can have a wash in private - a rare luxury on a Great Walk. 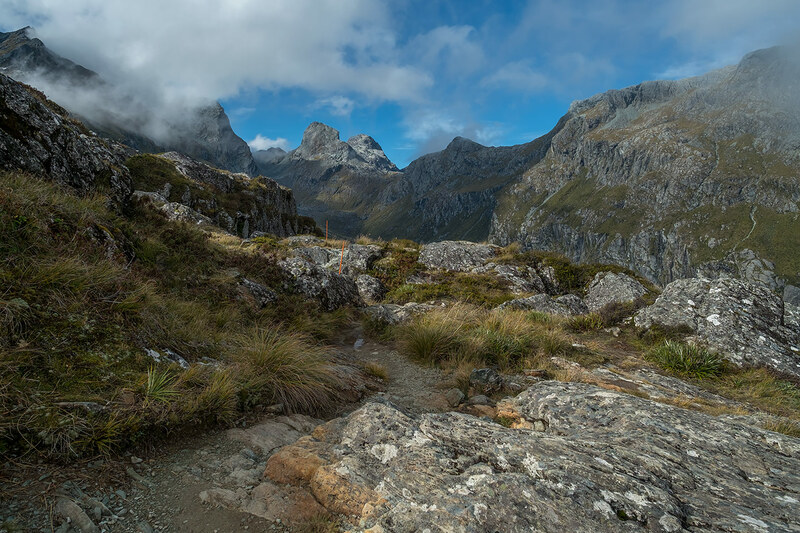 ROUTEBURN FLATS HUT - Looking back from Routeburn Flats towards the hut. 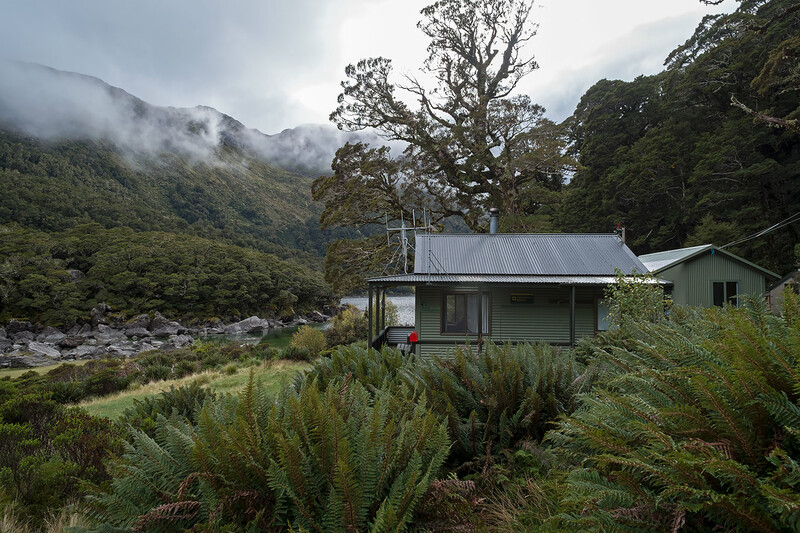 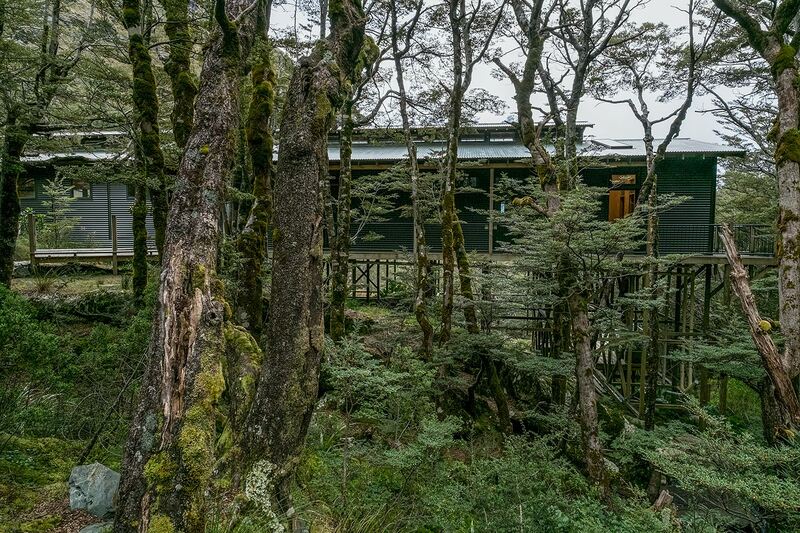 That big tree in front of the hut was full of Mohua (a rare NZ native bird) the next morning. 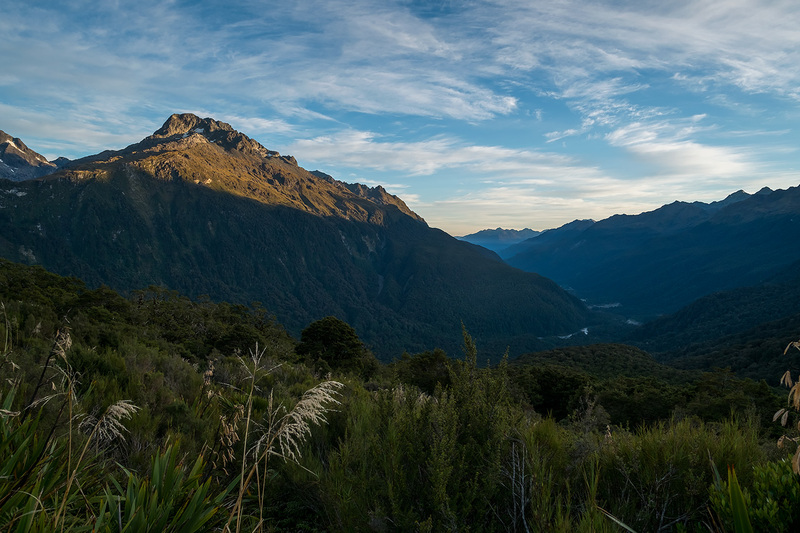 Well worth getting up for. 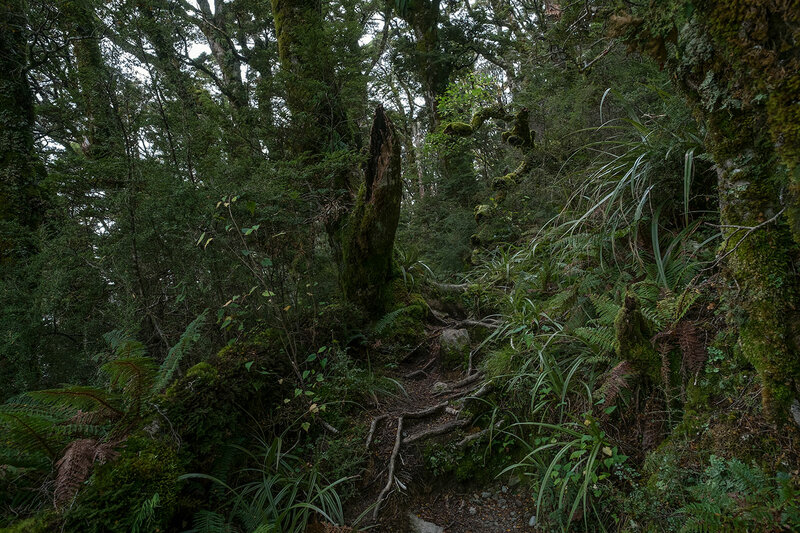 Looking up the Left Branch of the Route Burn (river). 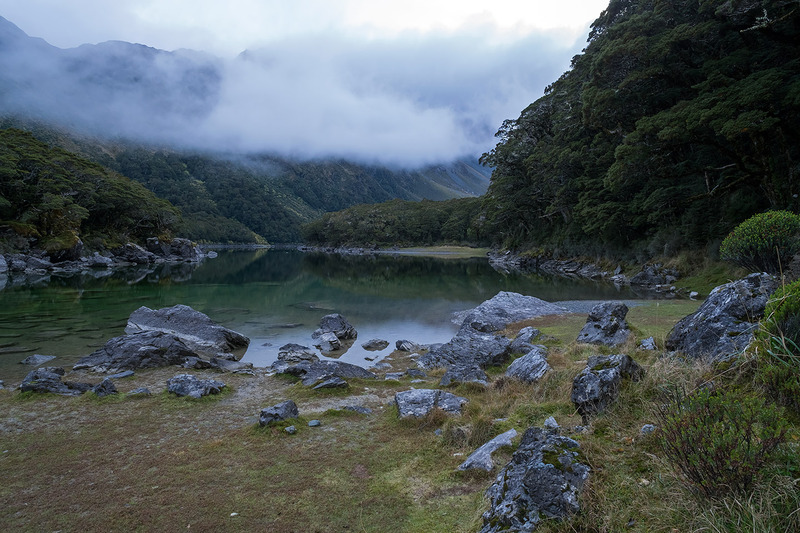 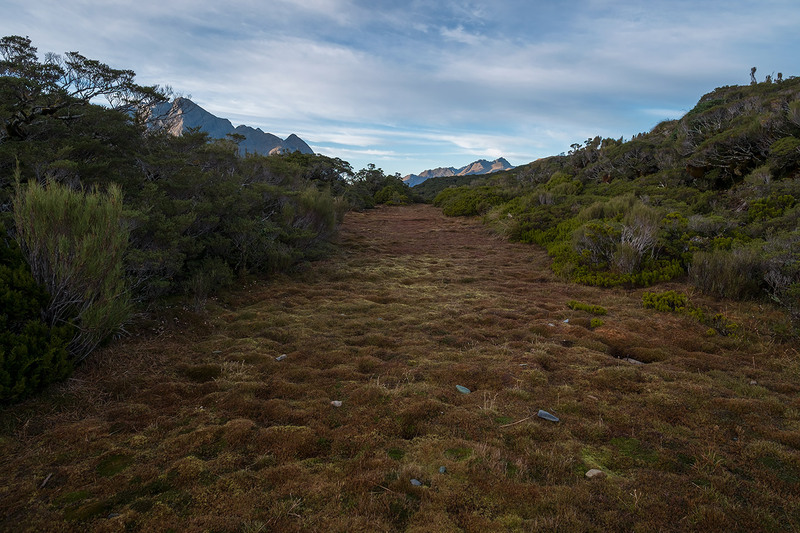 In the morning we set off upstream a short distance to the Routeburn Flats Campsite. 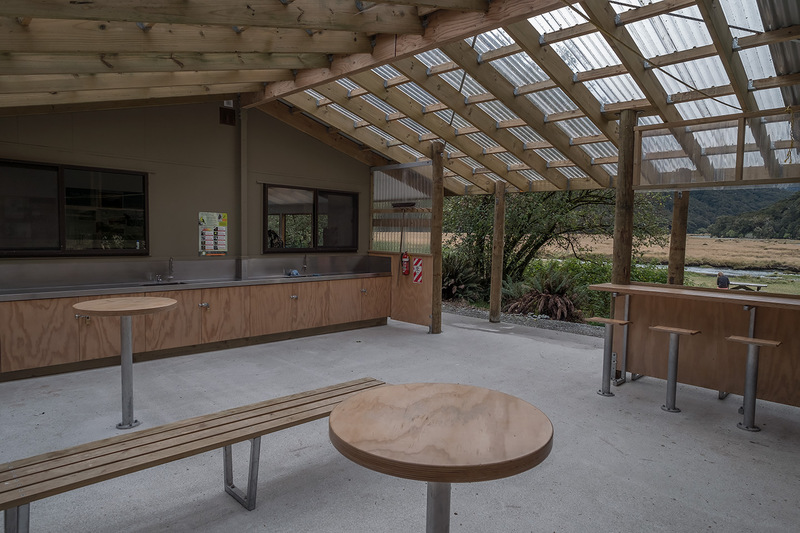 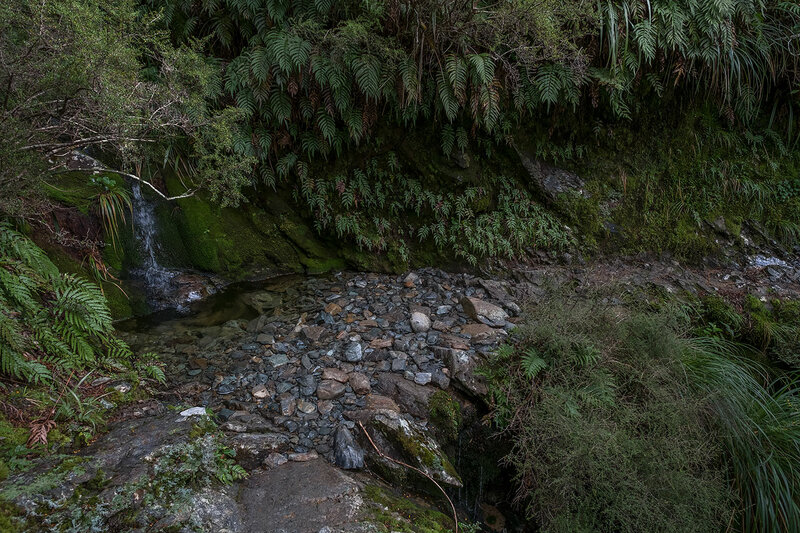 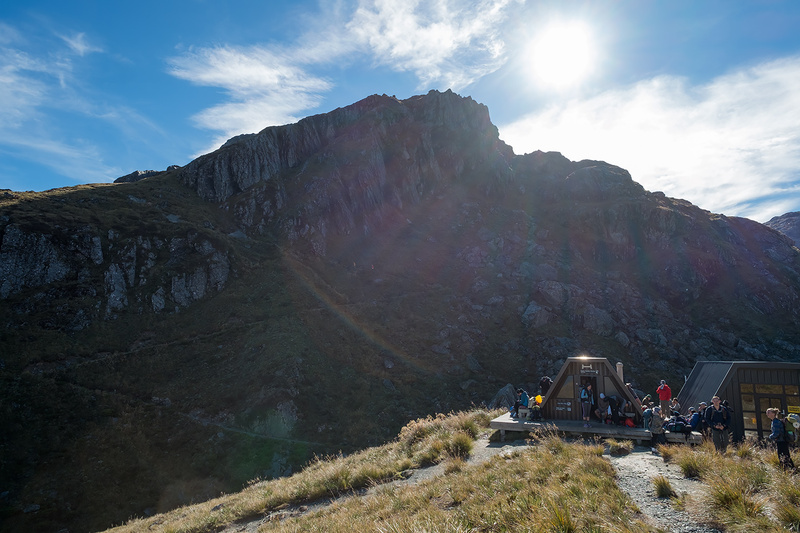 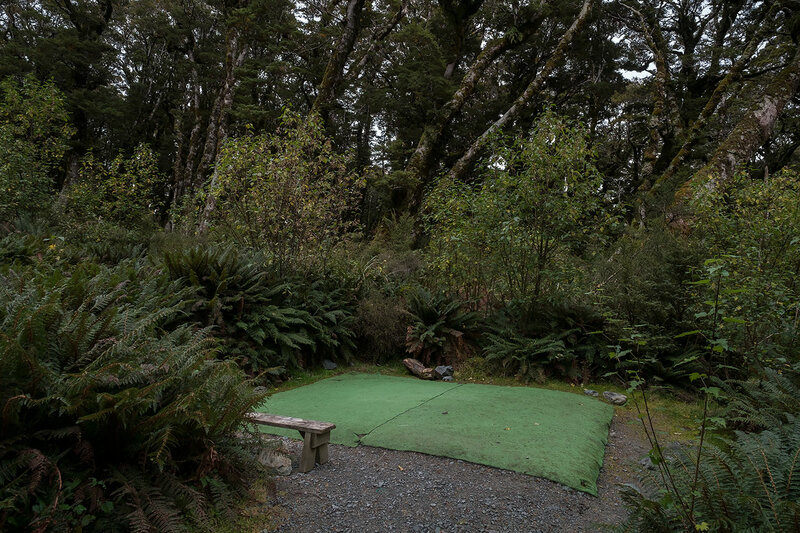 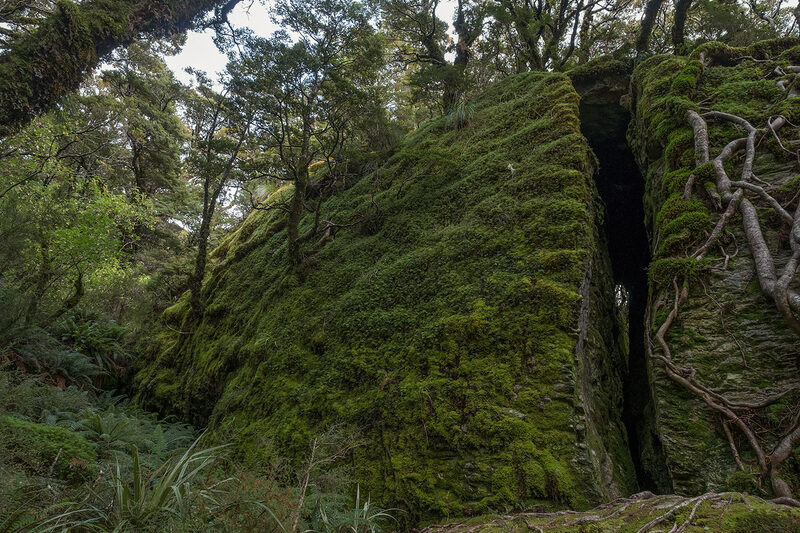 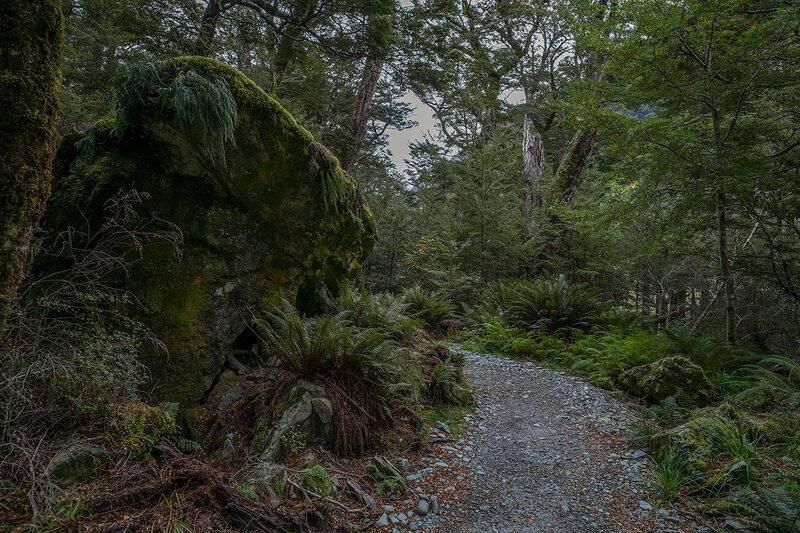 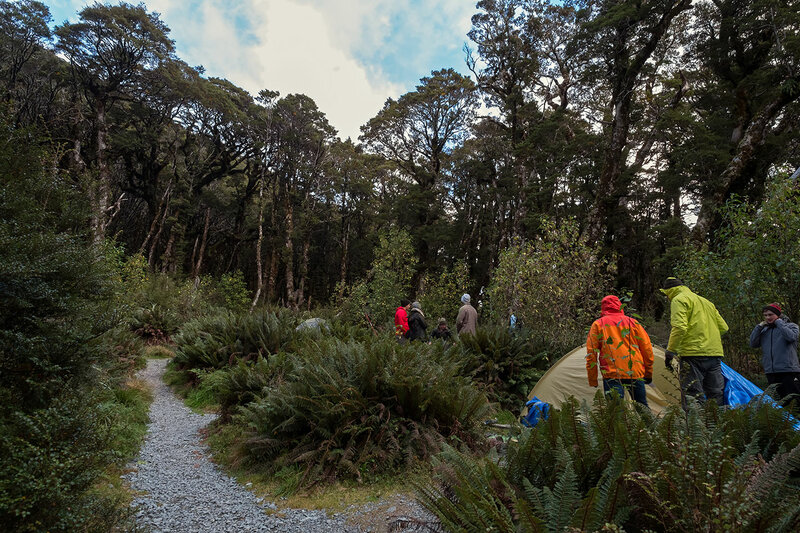 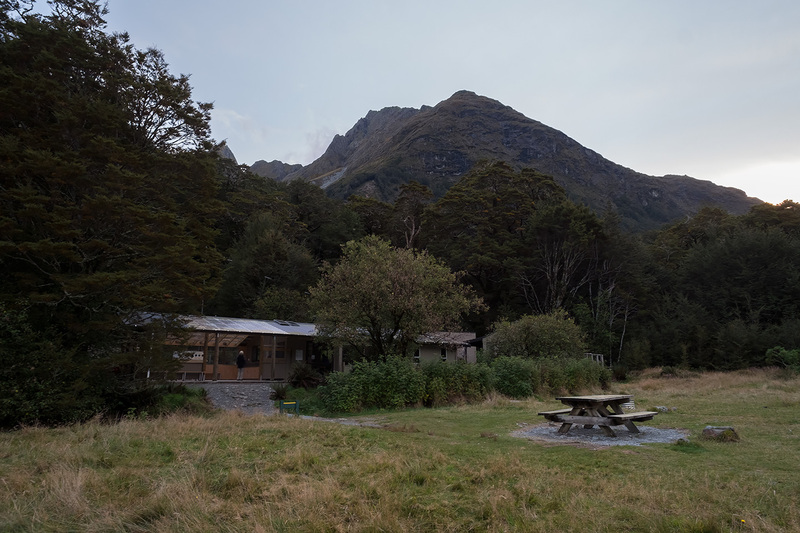 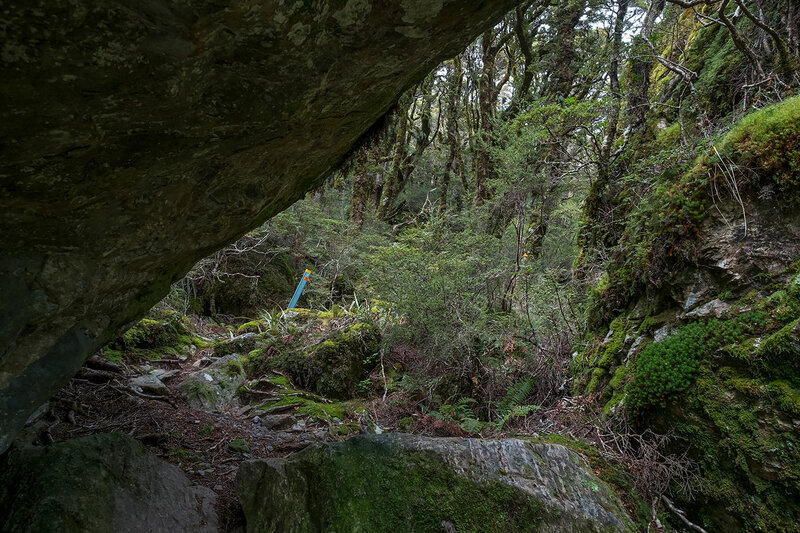 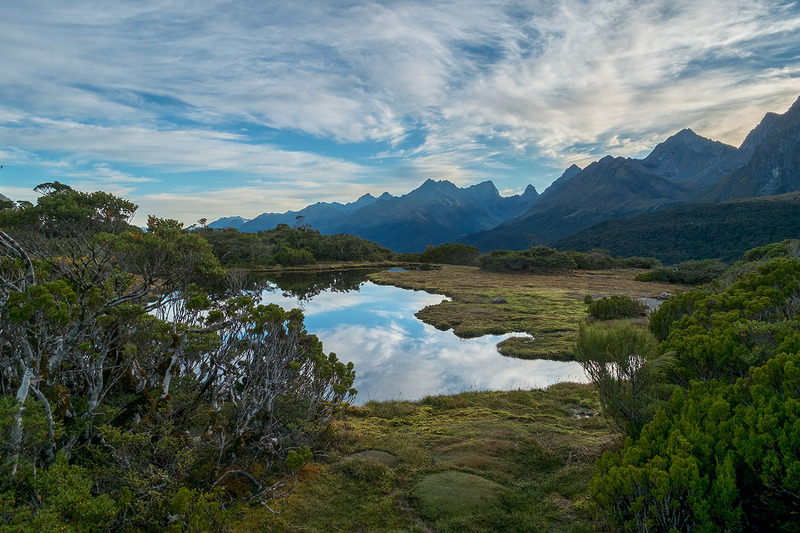 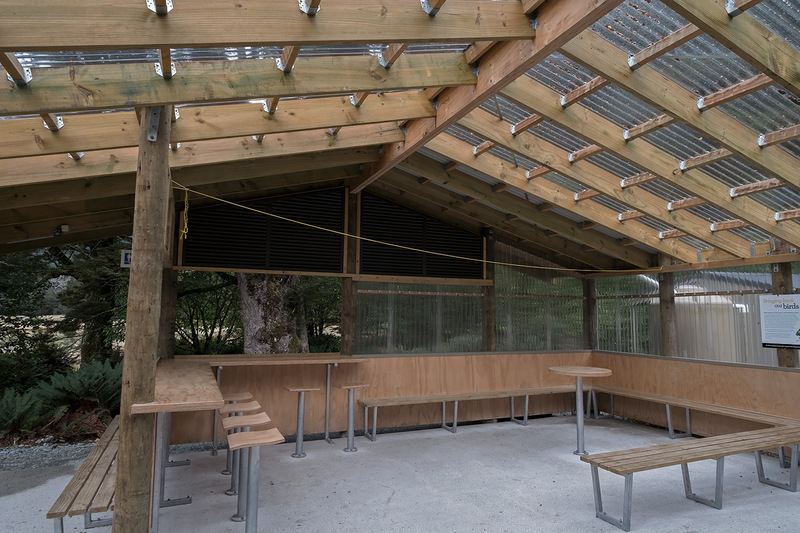 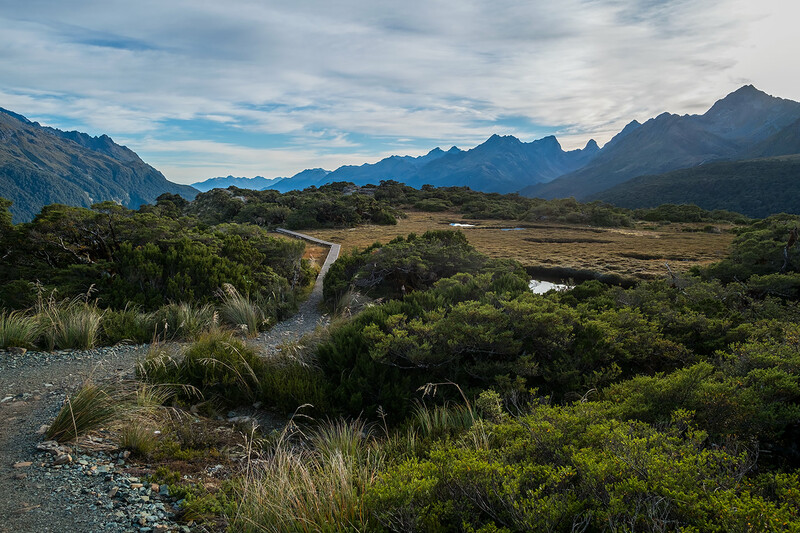 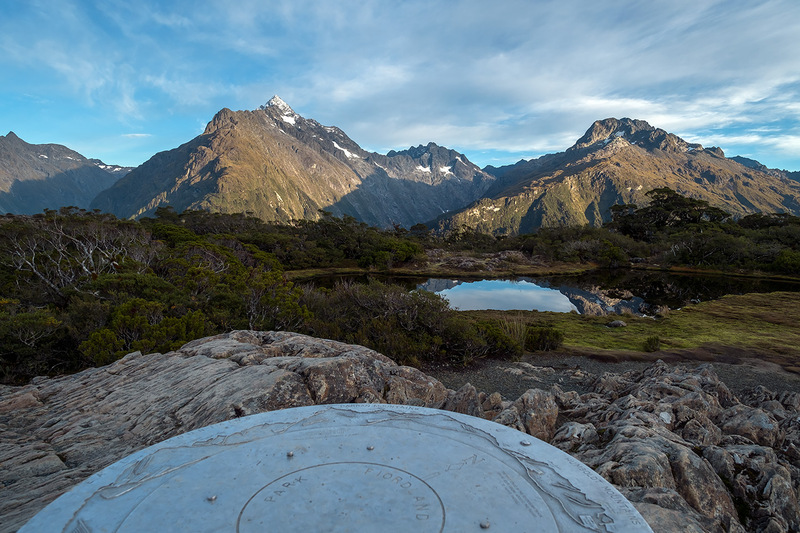 Routeburn Flats Campsite features two cooking shelters and 15 non-powered/tent sites. 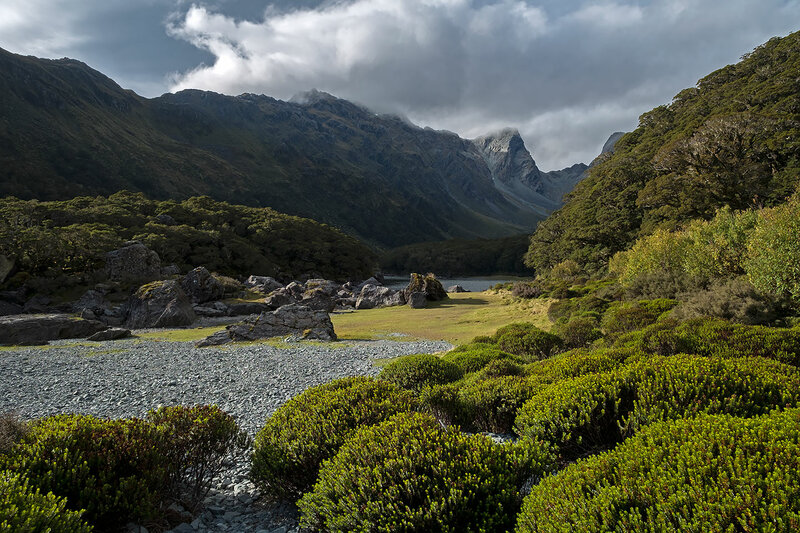 View from Routeburn Flats Campsite. 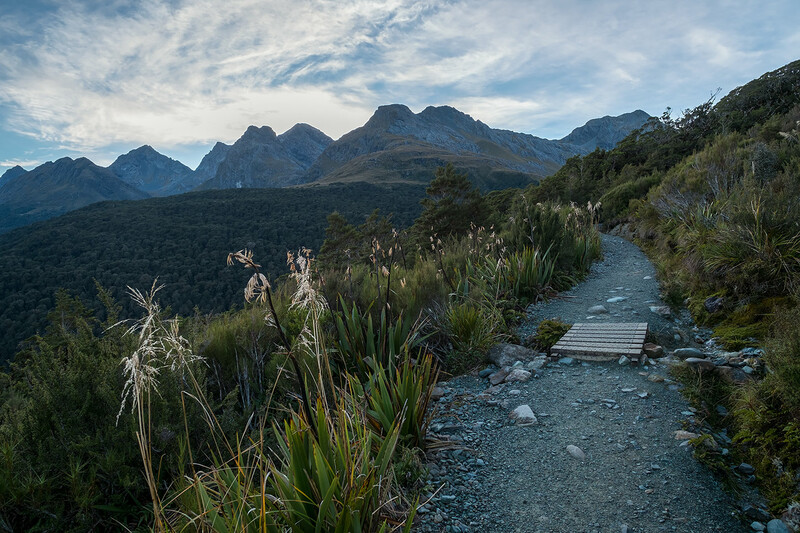 Heading back towards Routeburn Flats Hut. 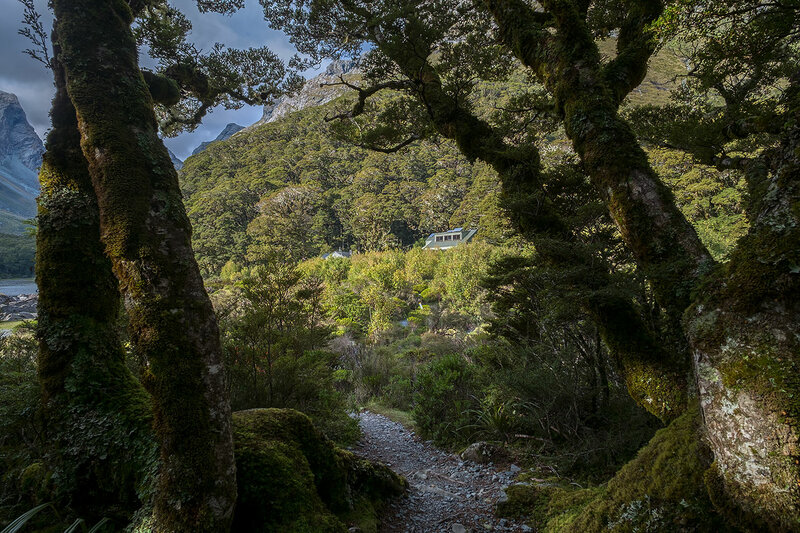 Passing by Routeburn Flats Hut. 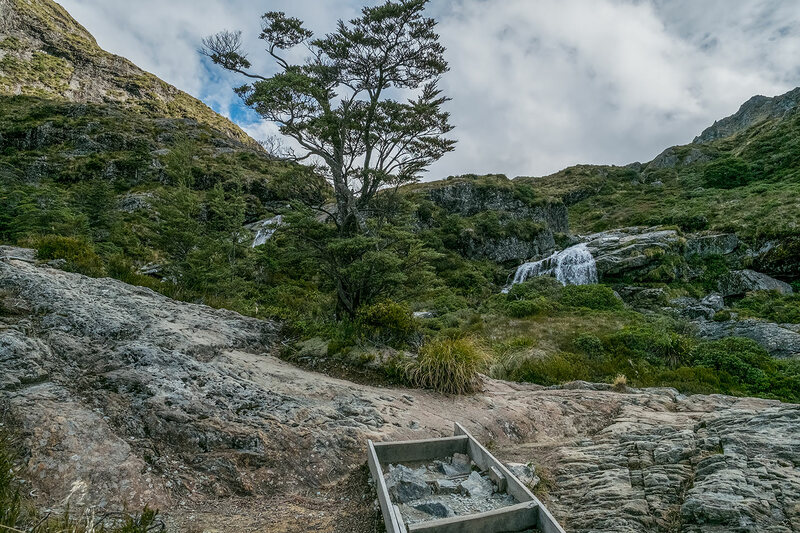 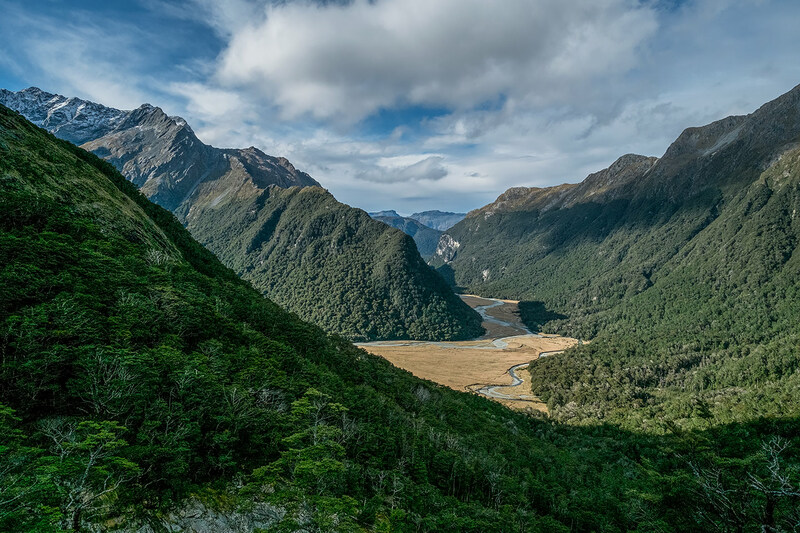 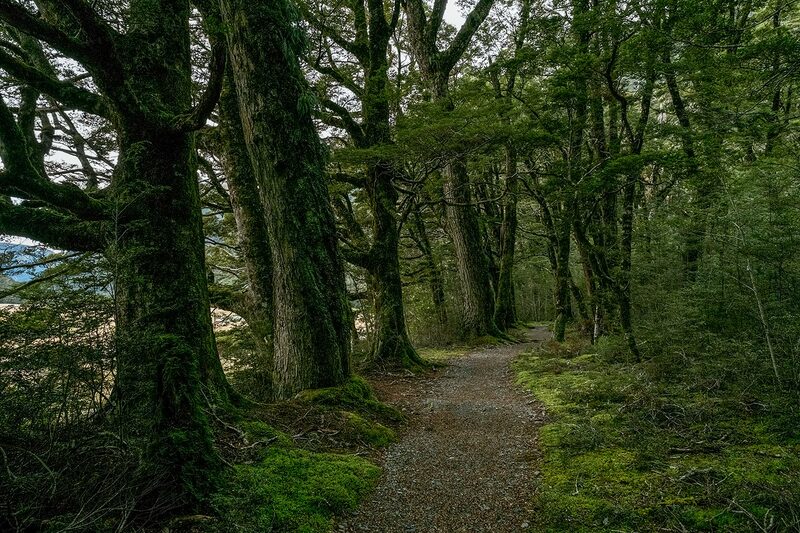 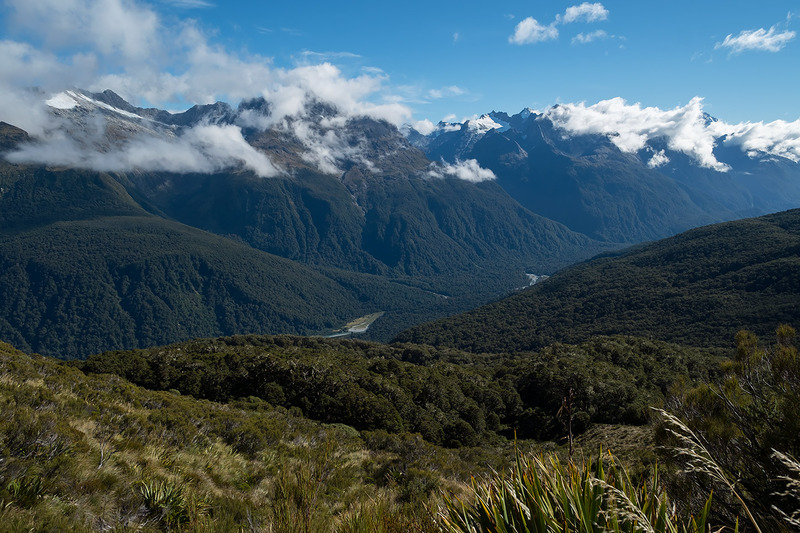 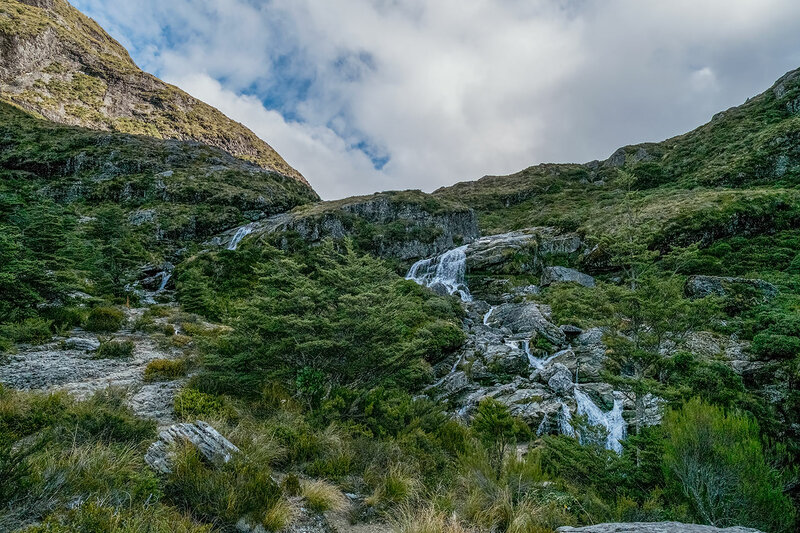 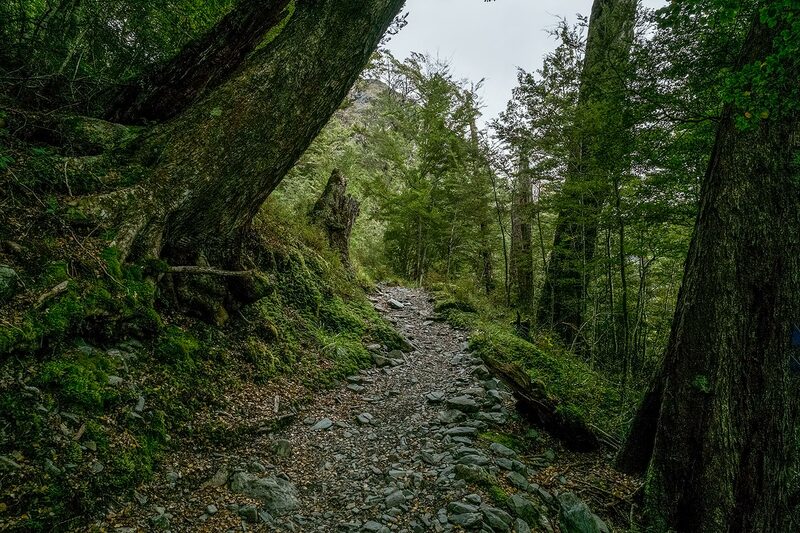 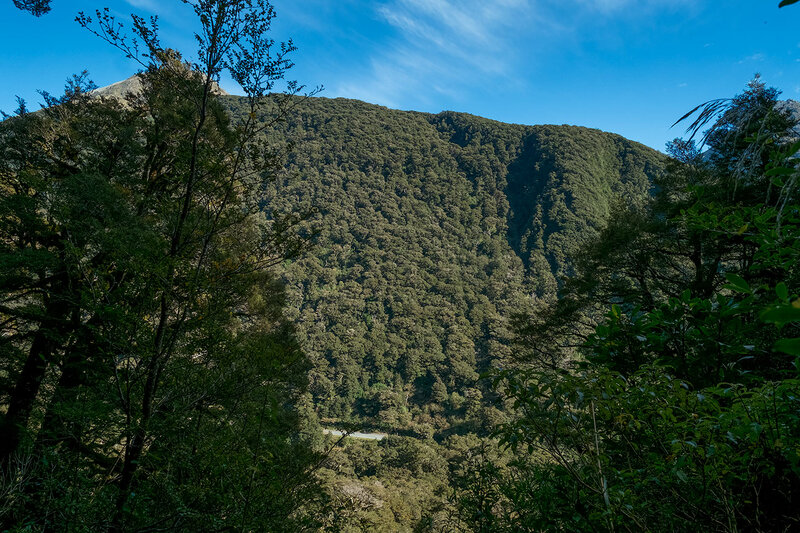 The walk from Routeburn Flats Hut to Routeburn Falls Hut is an easy steady climb for 1 hour 30 minutes through stunning beech forest with some excellent views. 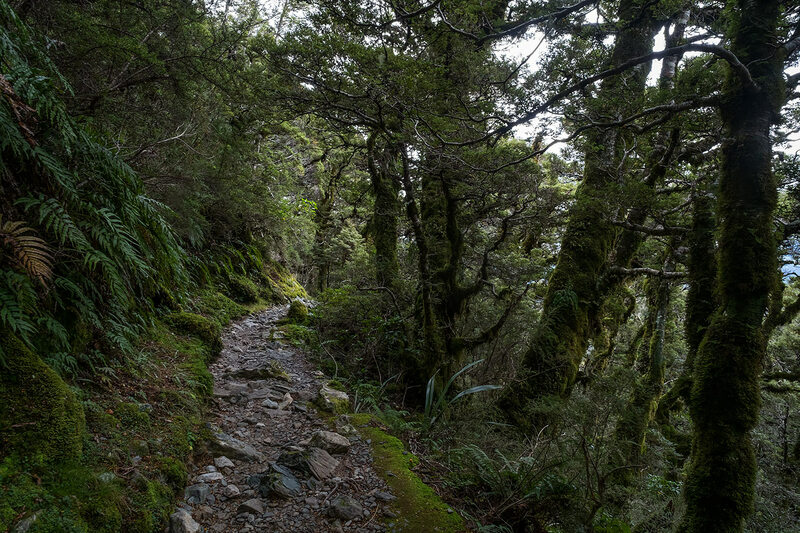 Continuing along the track below Routeburn Flats Hut. 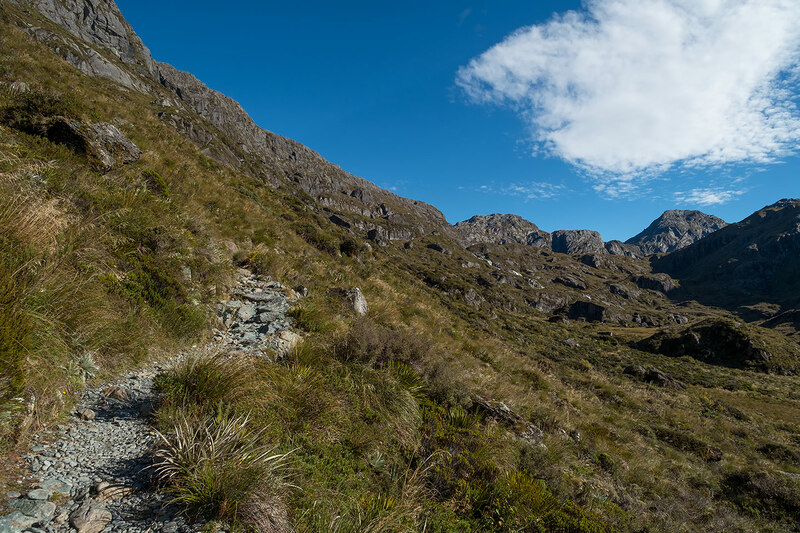 Back at the intersection we saw yesterday, we now head uphill to Routeburn Falls Hut. 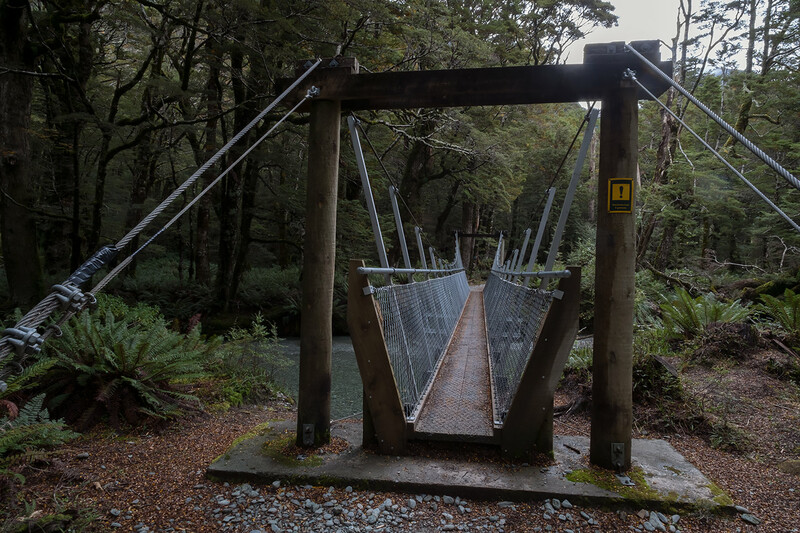 Emily Creek bridge marks the halfway point of today's walk. 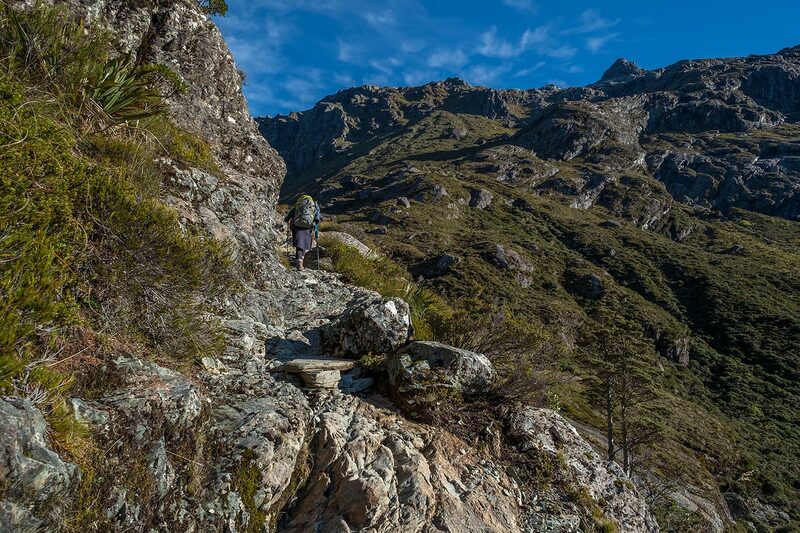 Sidling along below Phoenix Bluff. 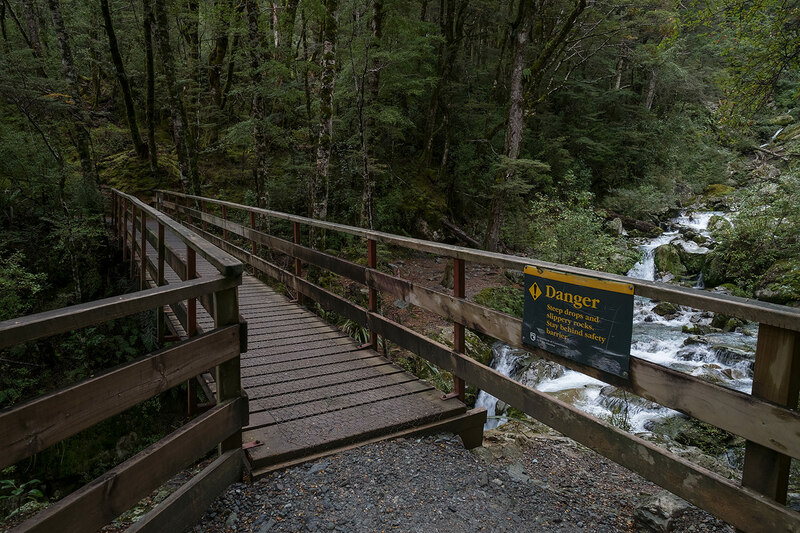 There is a risk of falling rocks here and trampers are asked to hurry through this section. 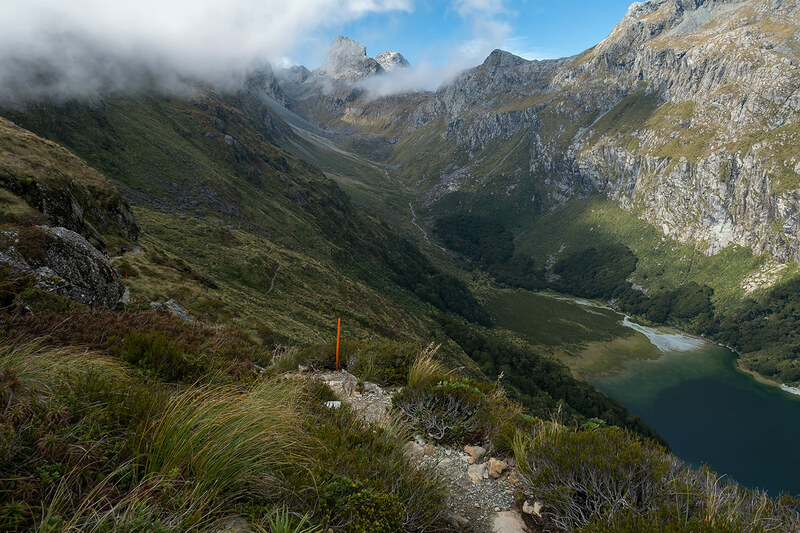 Next we come to a huge slip and this magnificent view over Routeburn Flats. 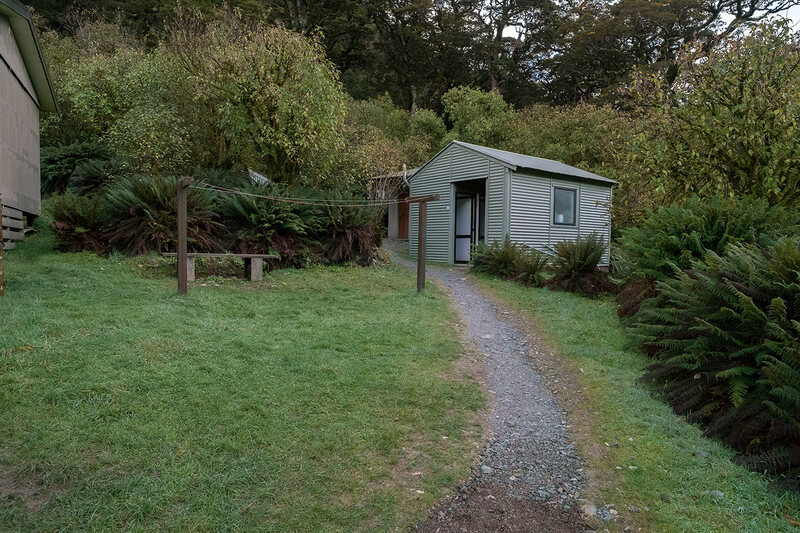 Wow... That's a different sort of hut. 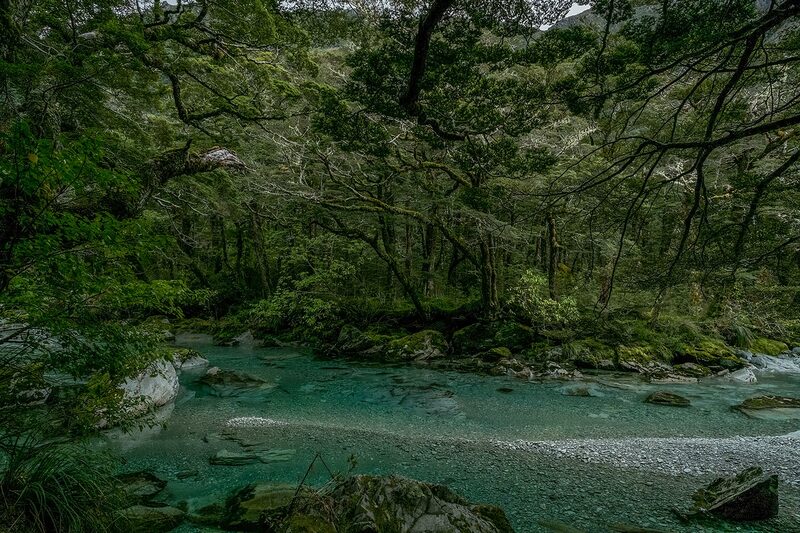 Quite zen. 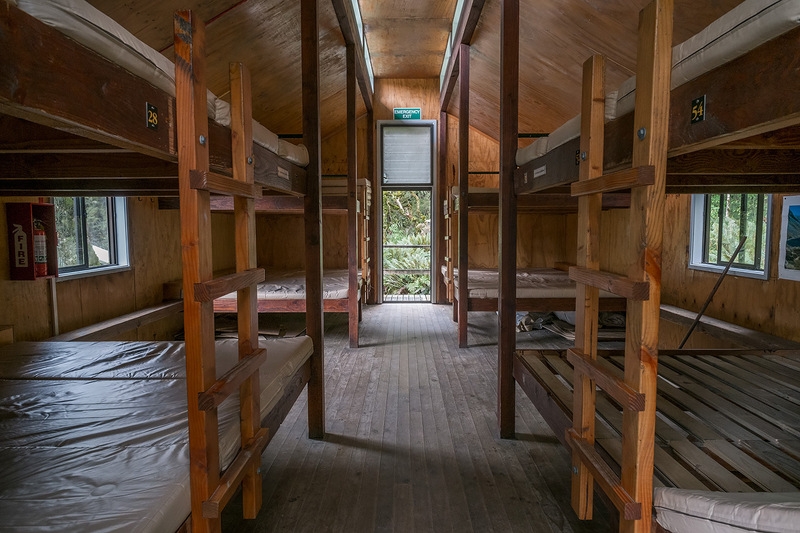 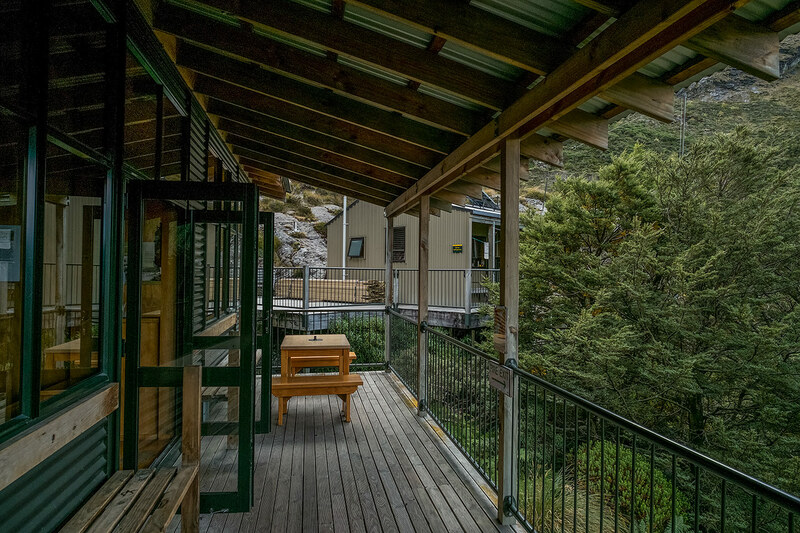 ROUTEBURN FALLS HUT - 48 bunk beds, gas cooking (during Great Walks season), heating, lighting, mattresses. 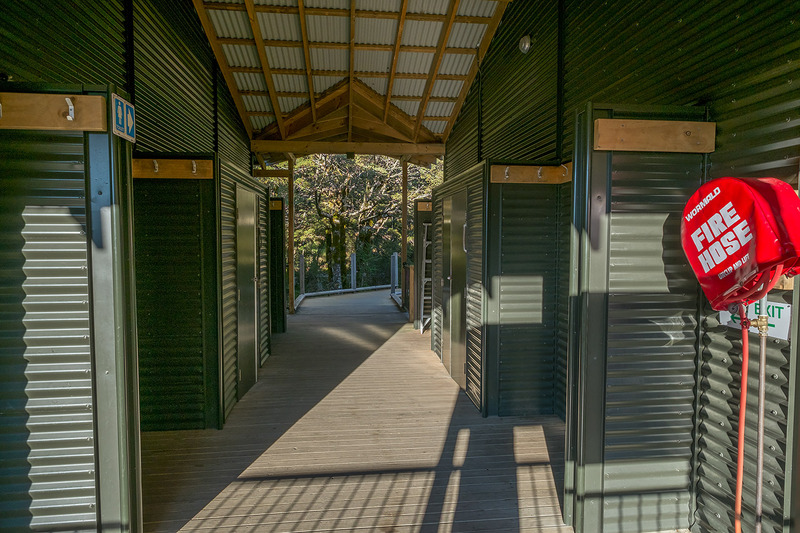 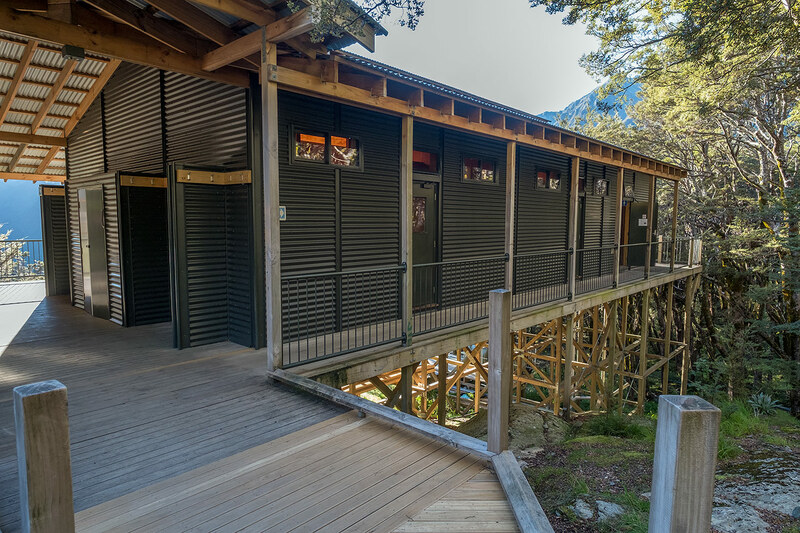 ROUTEBURN FALLS HUT - Rear Walkway to Bunkrooms and Women's Toilets. 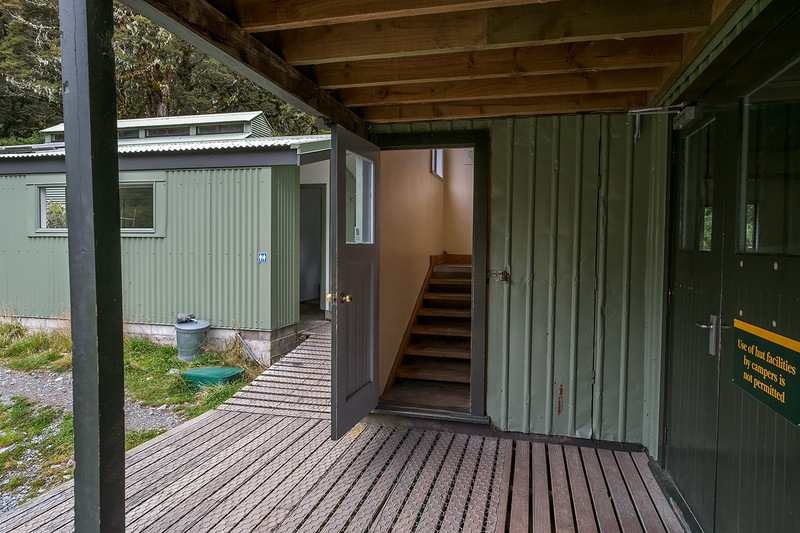 ROUTEBURN FALLS HUT - Corridor between Bunkrooms (left) and Kitchen / Dining Room (right). 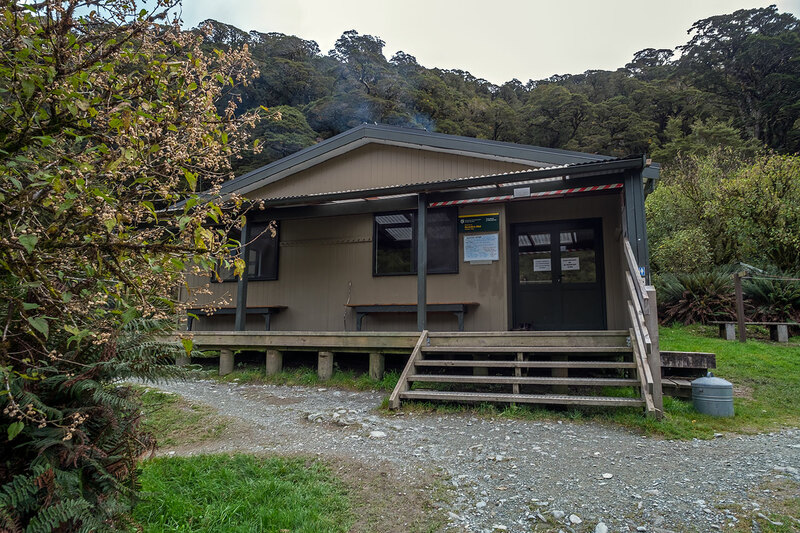 ROUTEBURN FALLS HUT - Looking right towards the bunkrooms. 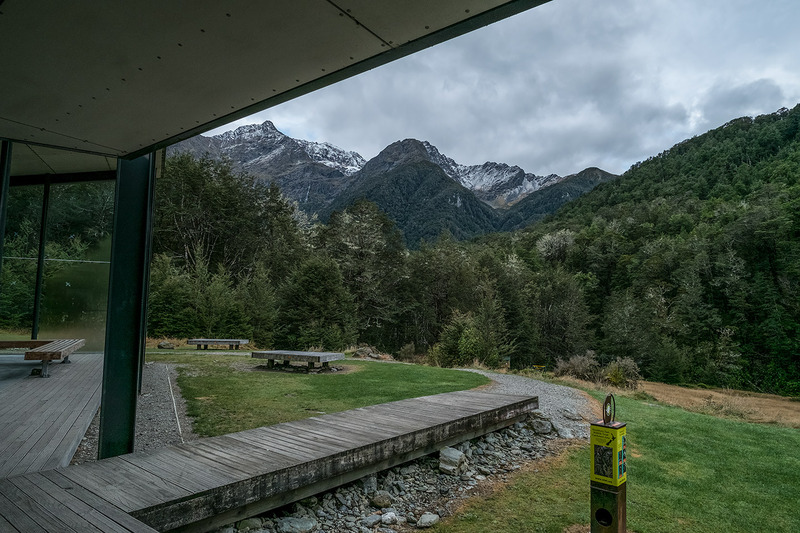 ROUTEBURN FALLS HUT - View from the deck. 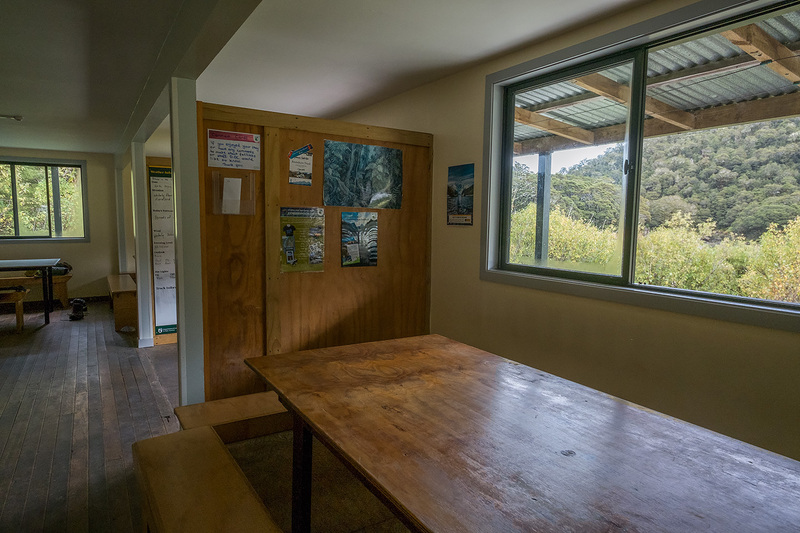 ROUTEBURN FALLS HUT - Bunkroom interior. 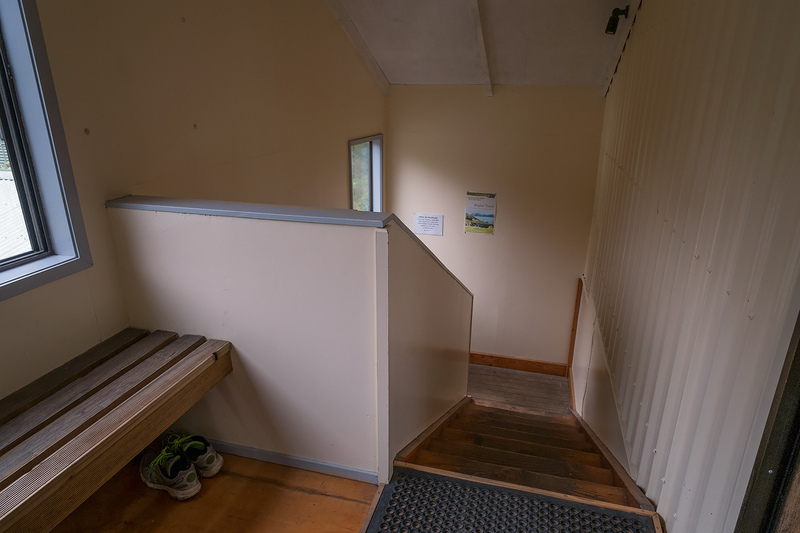 ROUTEBURN FALLS HUT - Bunkroom. 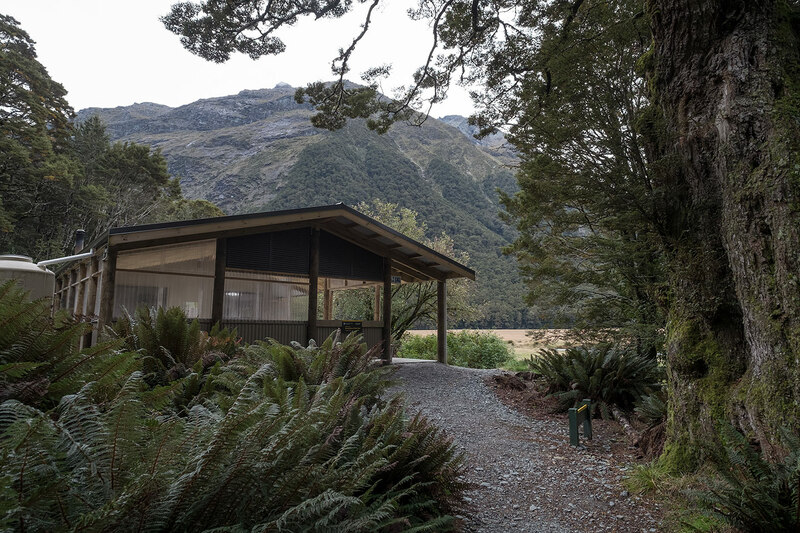 ROUTEBURN FALLS HUT - Back out on the deck and looking towards the kitchen / dining room and the Ranger's Hut. 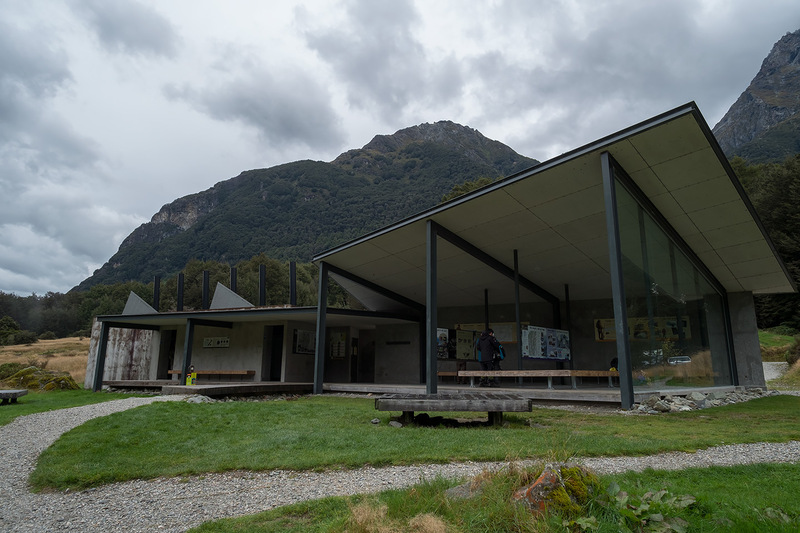 ROUTEBURN FALLS HUT - Dining Room. 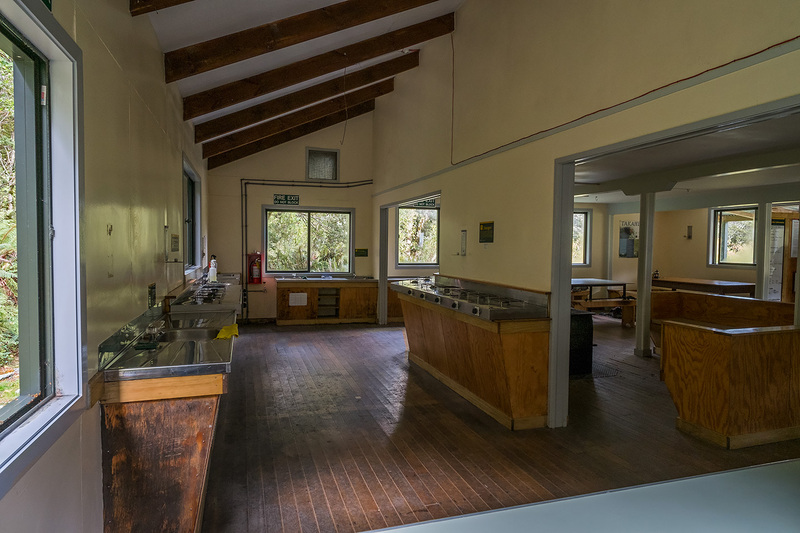 ROUTEBURN FALLS HUT - Kitchen & Upper Dining Area. 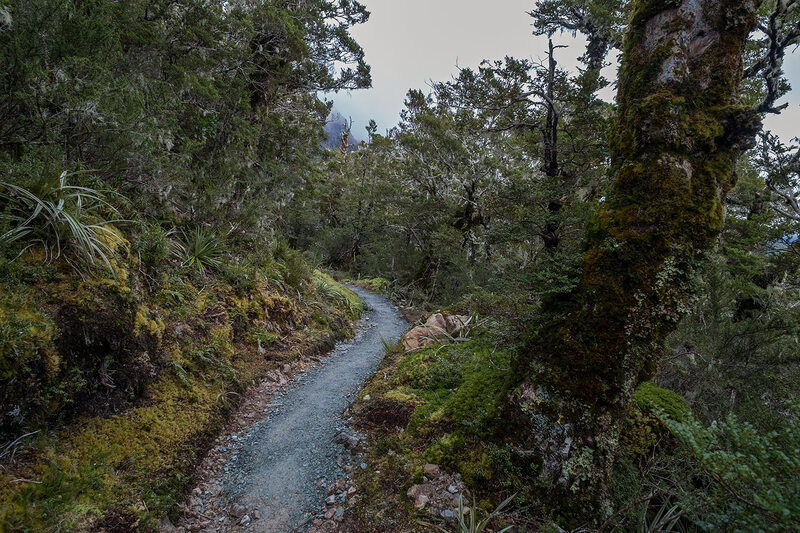 ROUTEBURN FALLS - Just off the entrance deck of Routeburn Falls Hut is this rocky section which leads up to the falls. 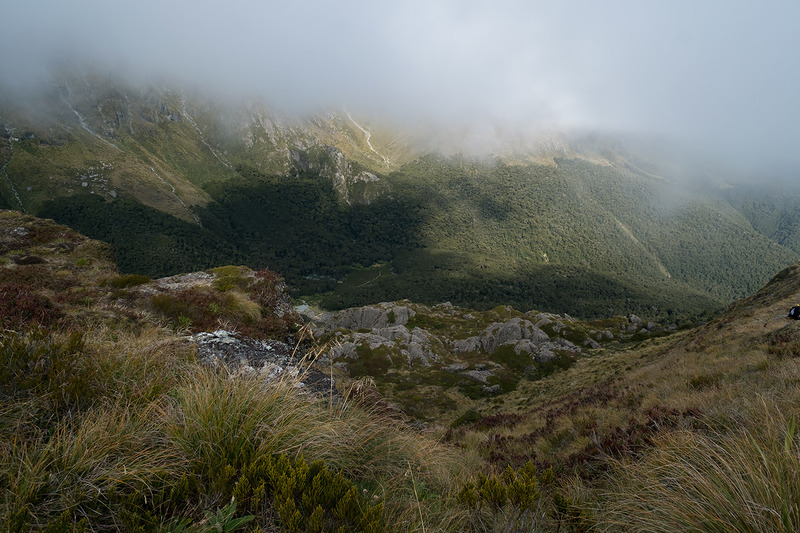 Less than a minute later we're on top of the rocky outcrop behind the hut. 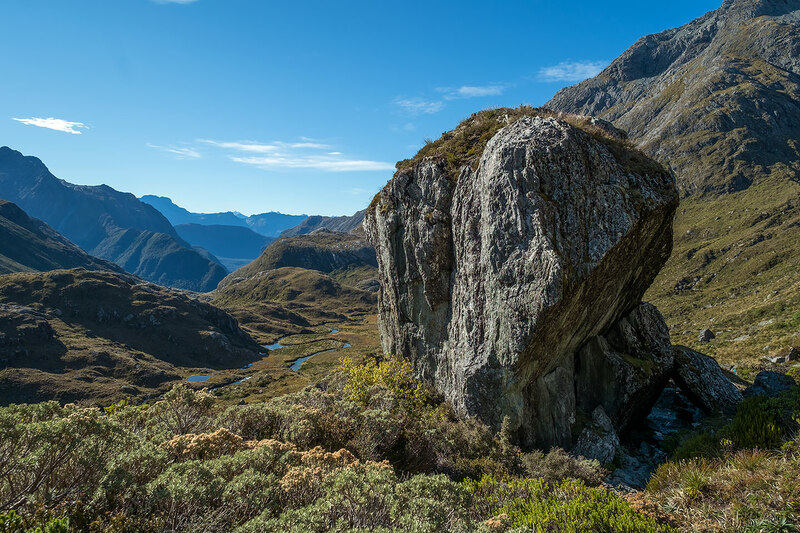 Looking from the rocky outcrop behind Routeburn Falls Hut towards Routeburn Flats. 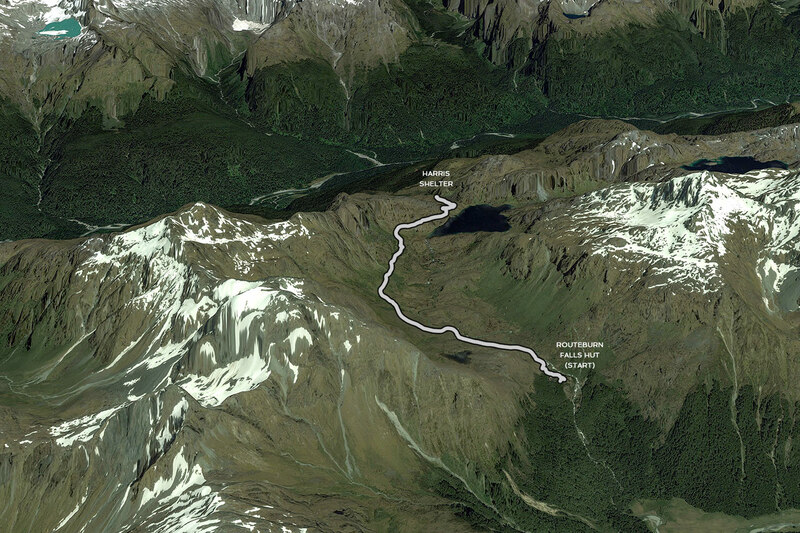 The 4.3 km tramp from Routeburn Falls Hut to Harris Shelter (where we have lunch) takes 2 hours. 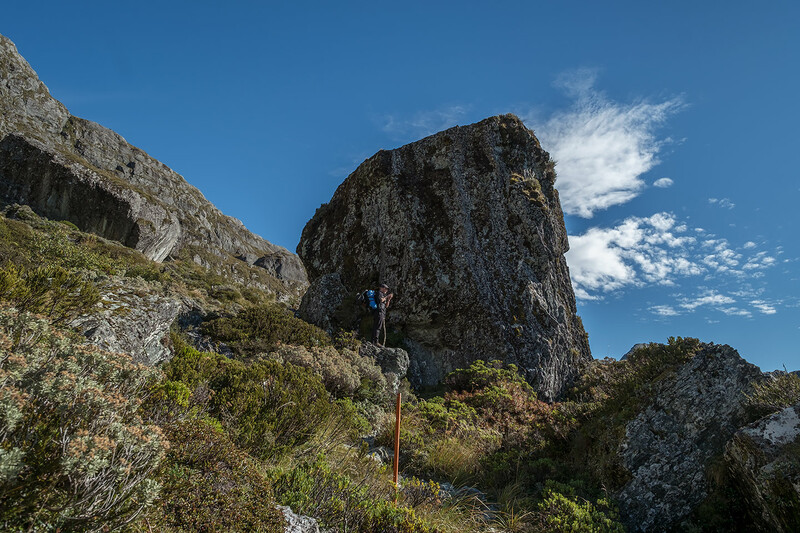 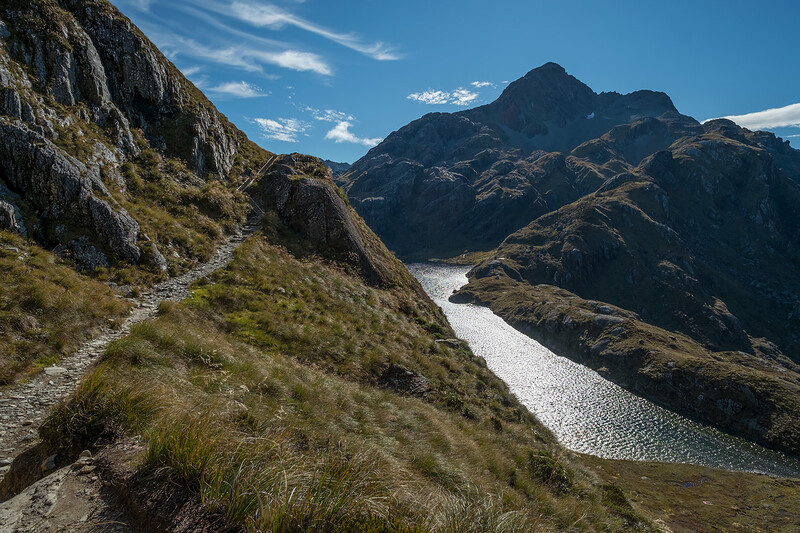 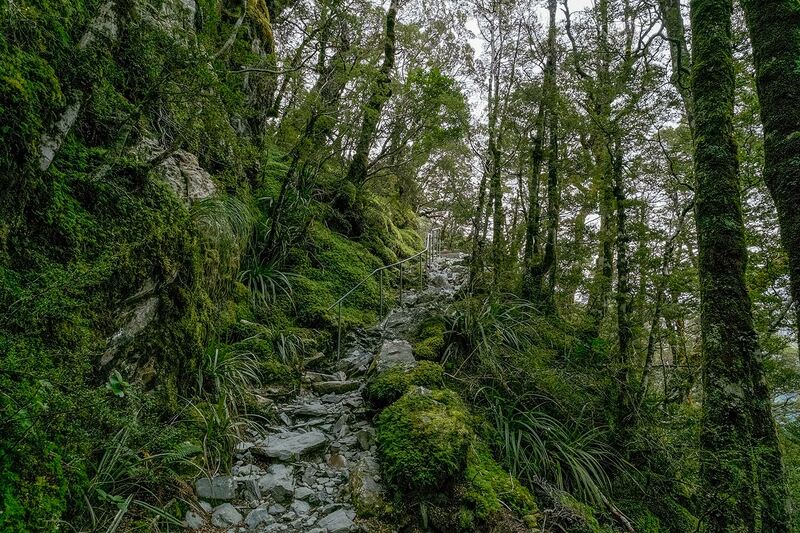 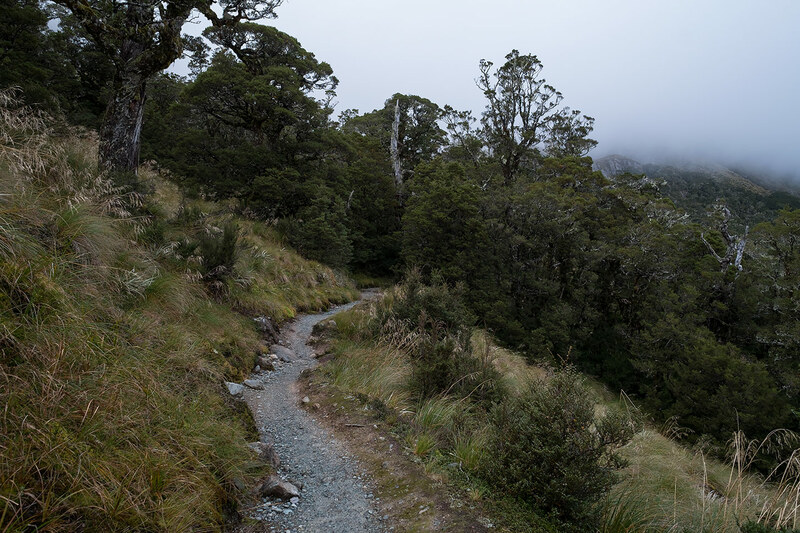 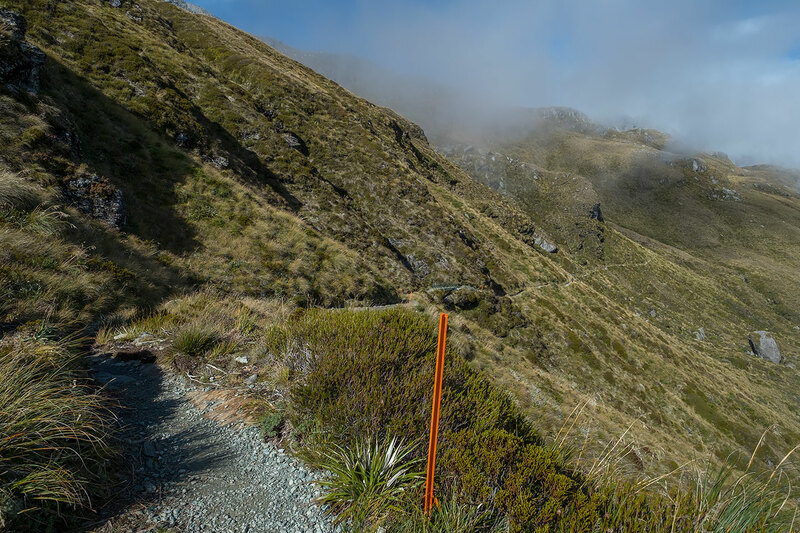 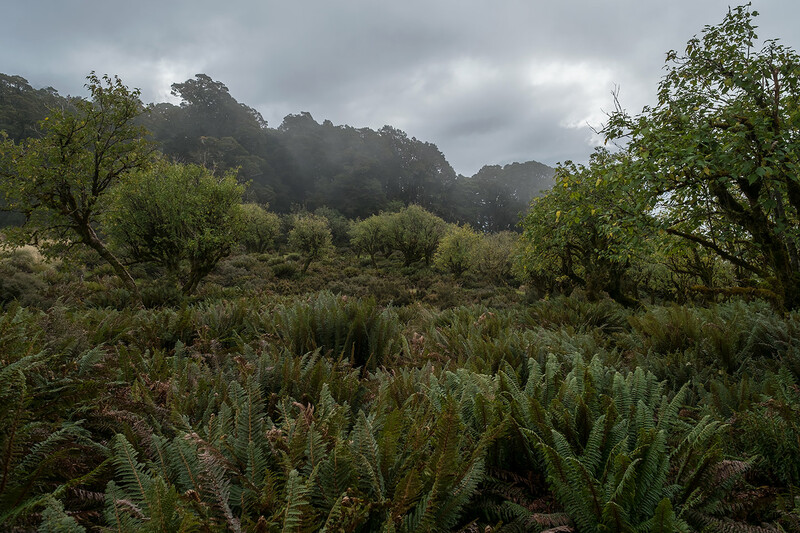 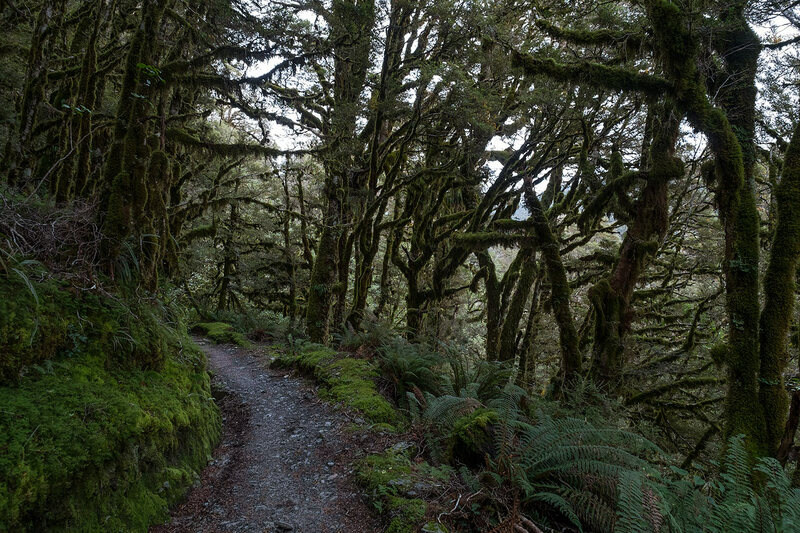 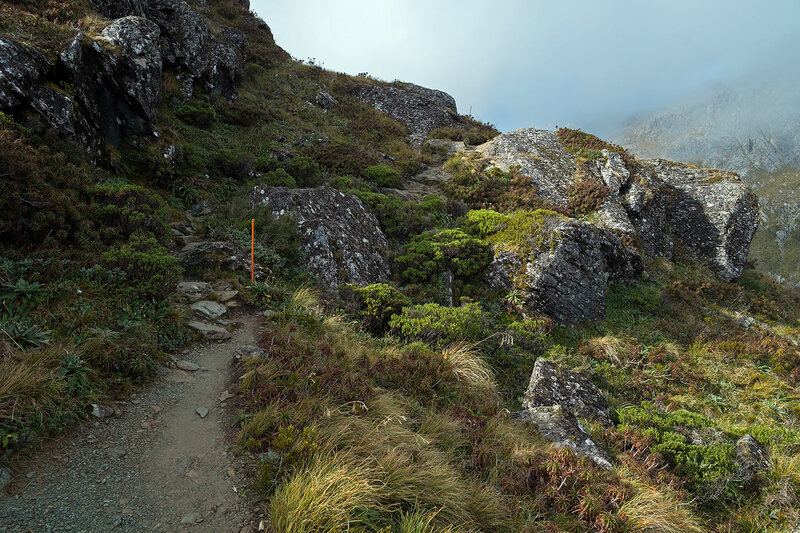 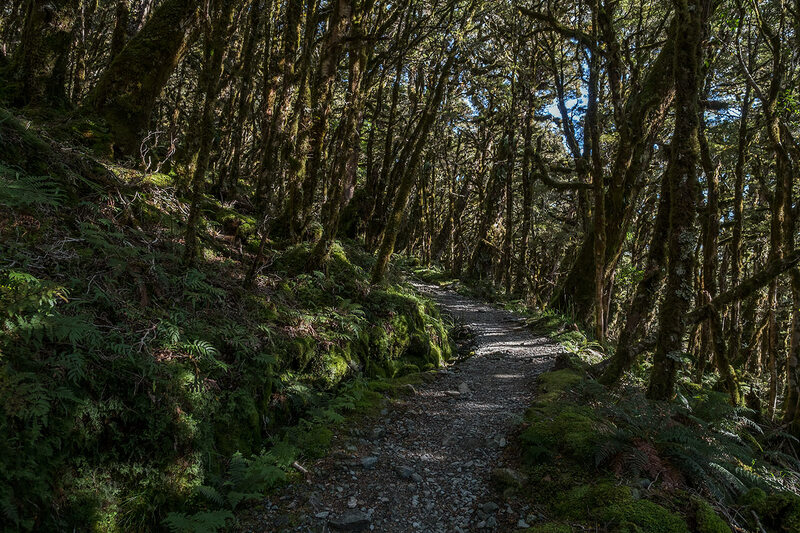 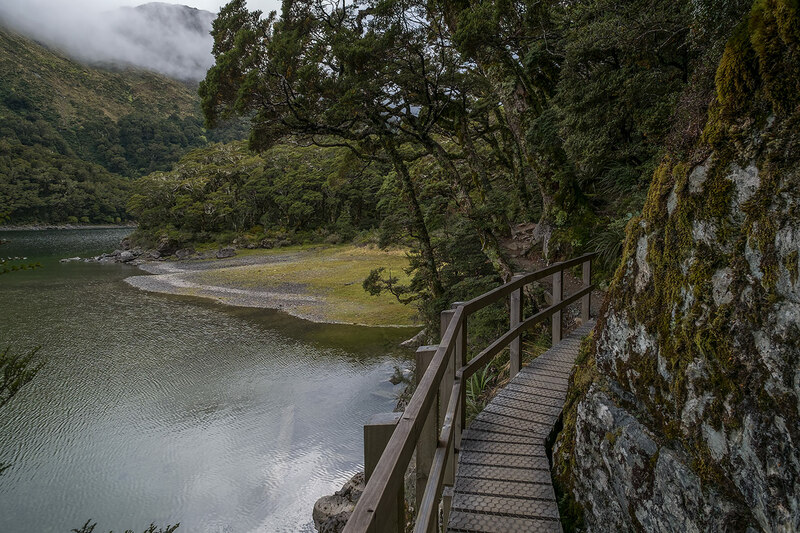 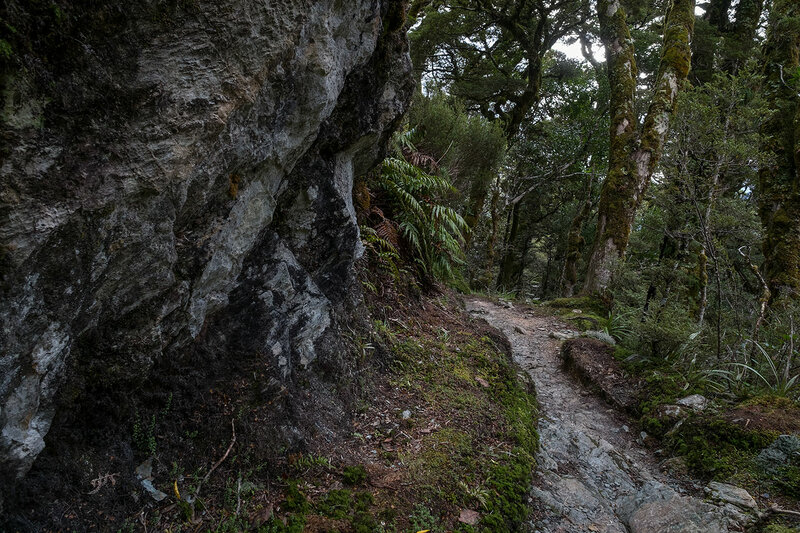 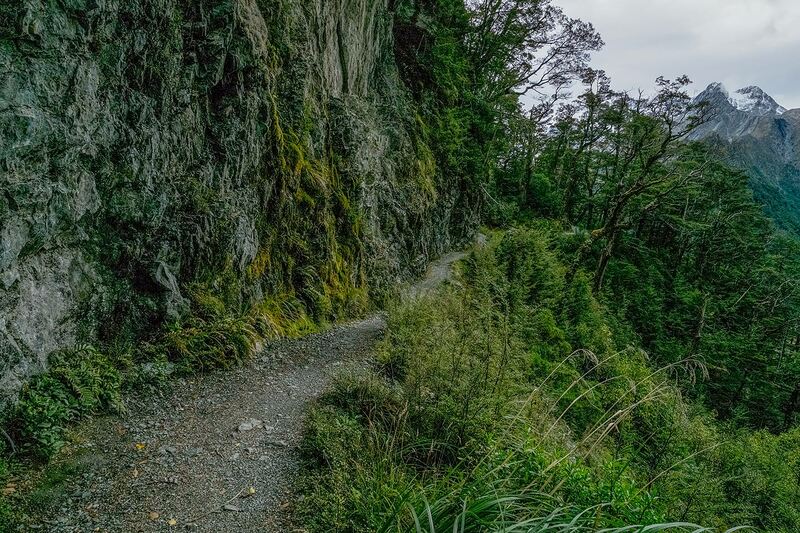 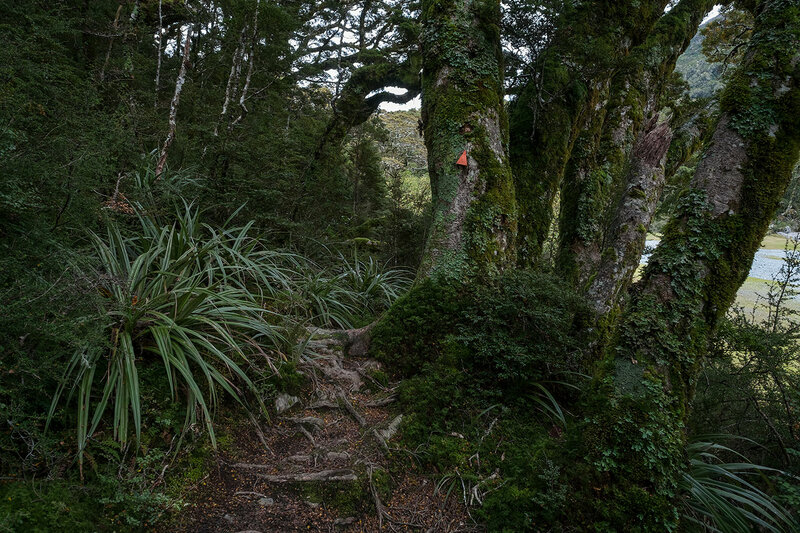 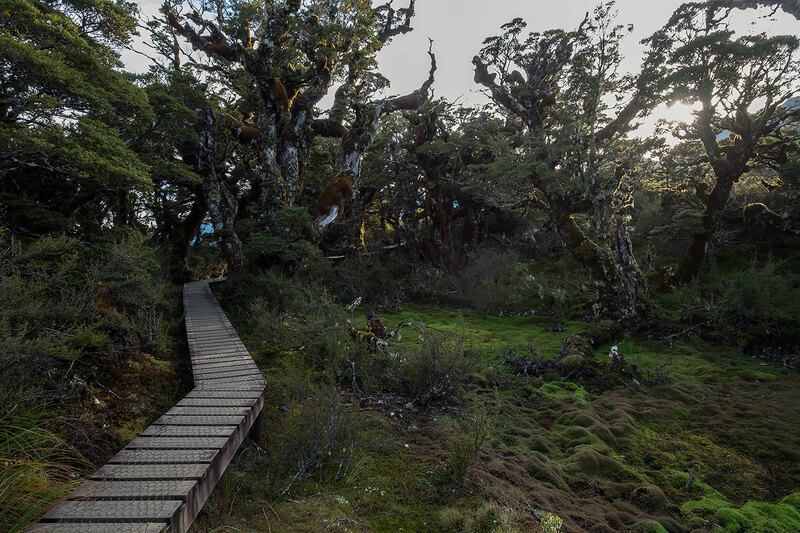 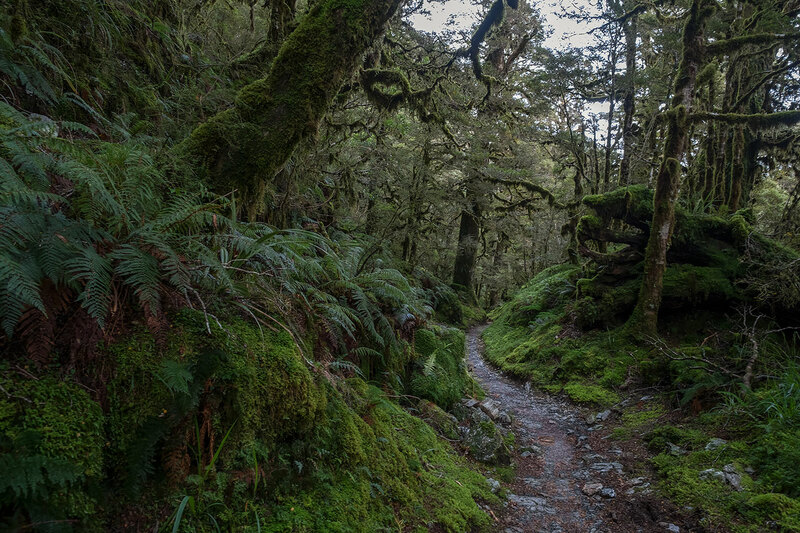 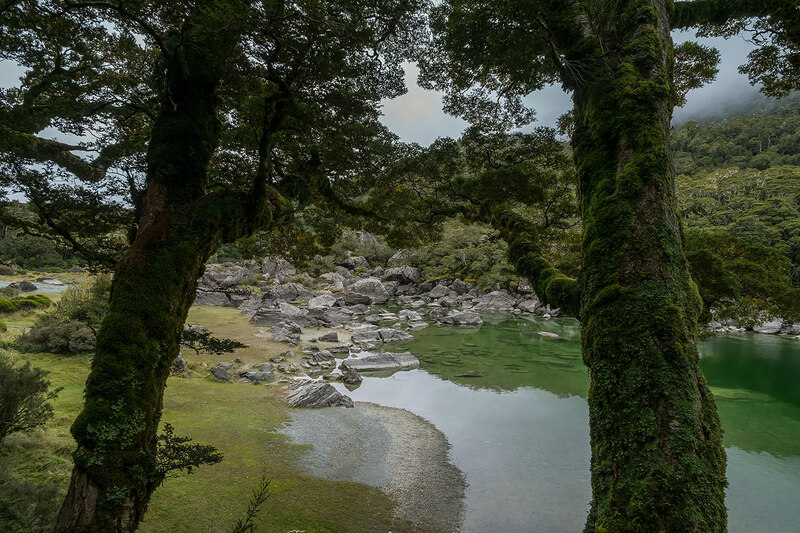 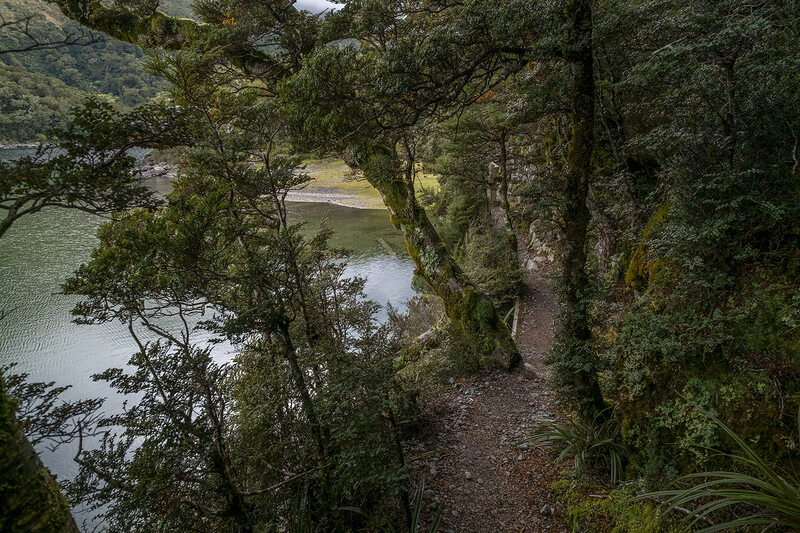 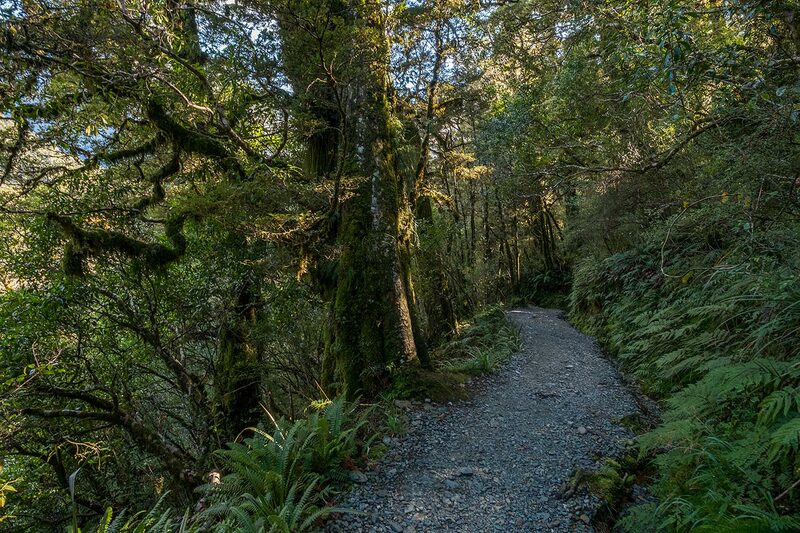 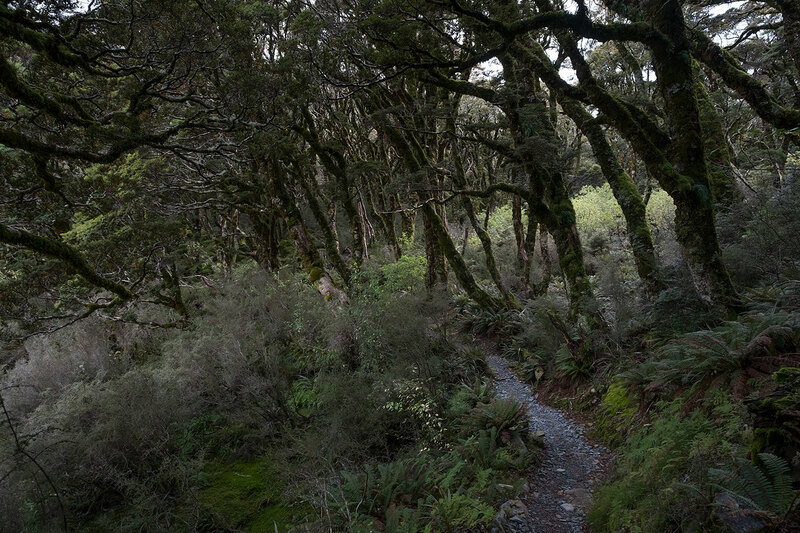 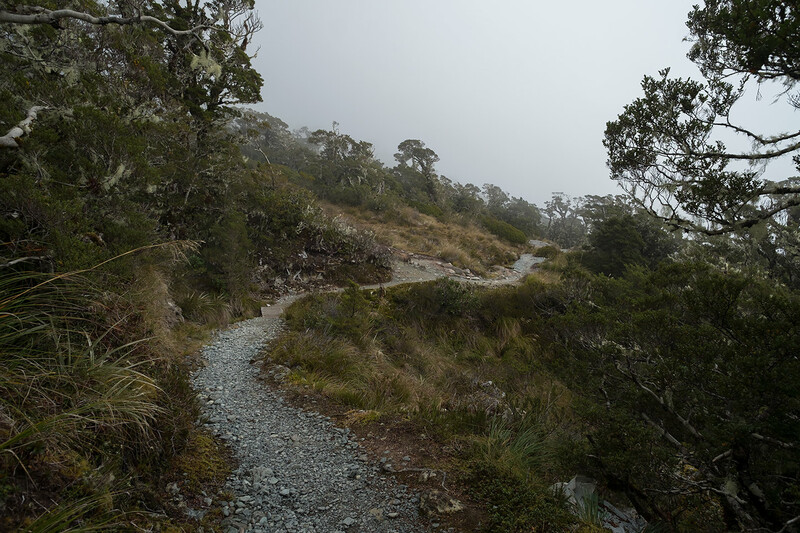 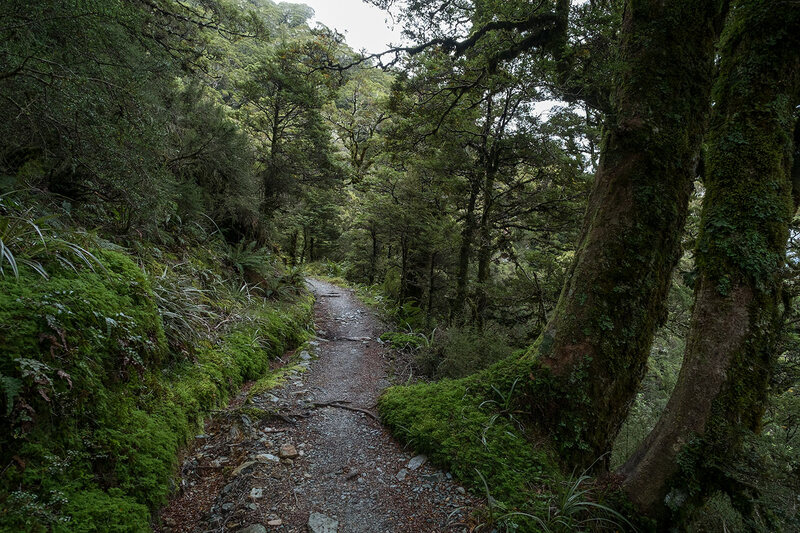 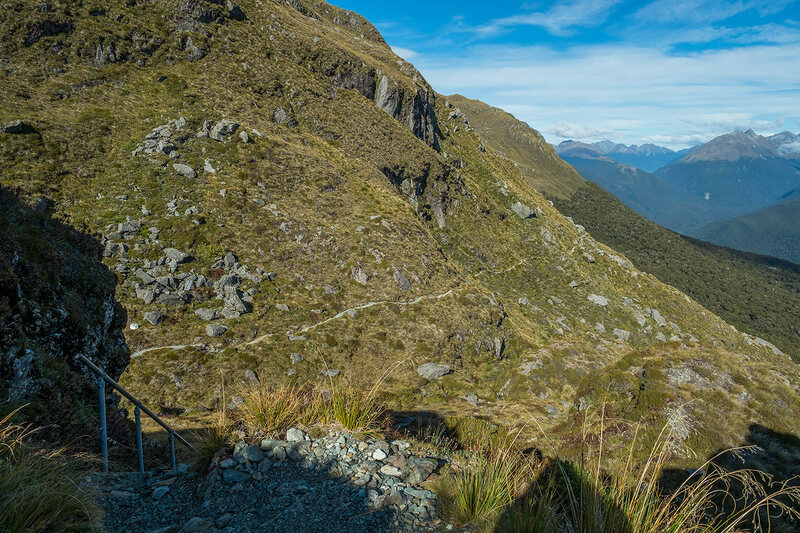 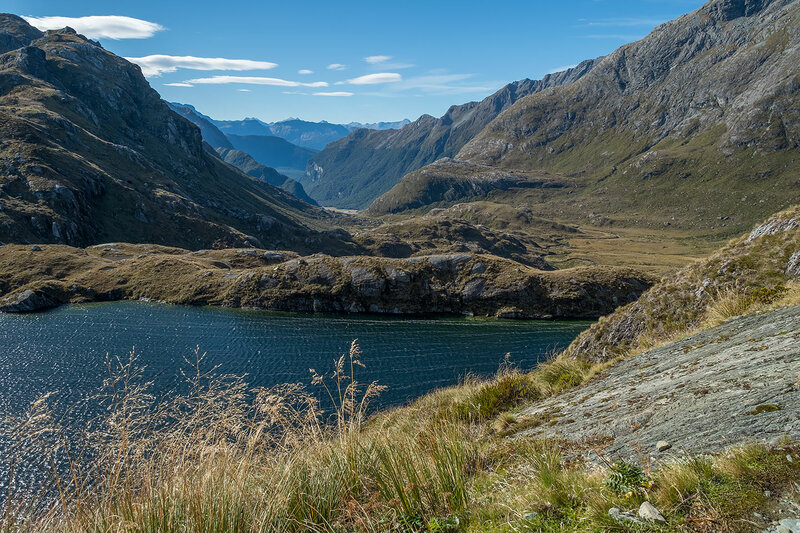 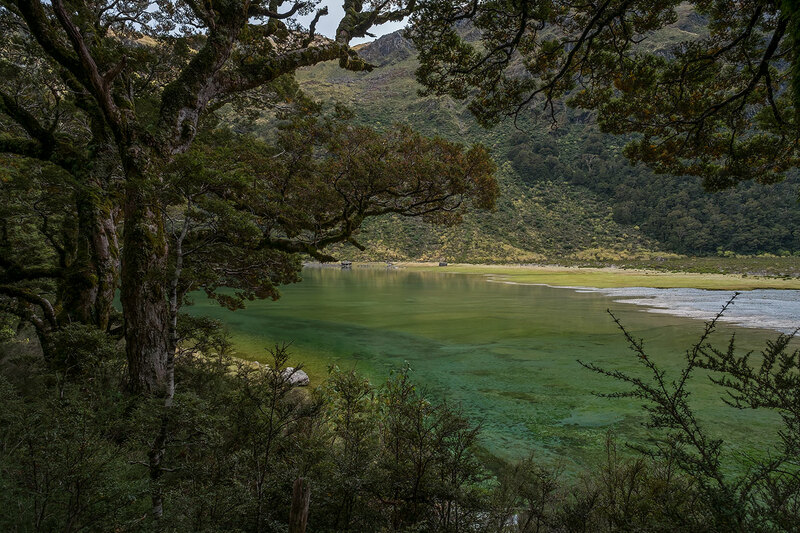 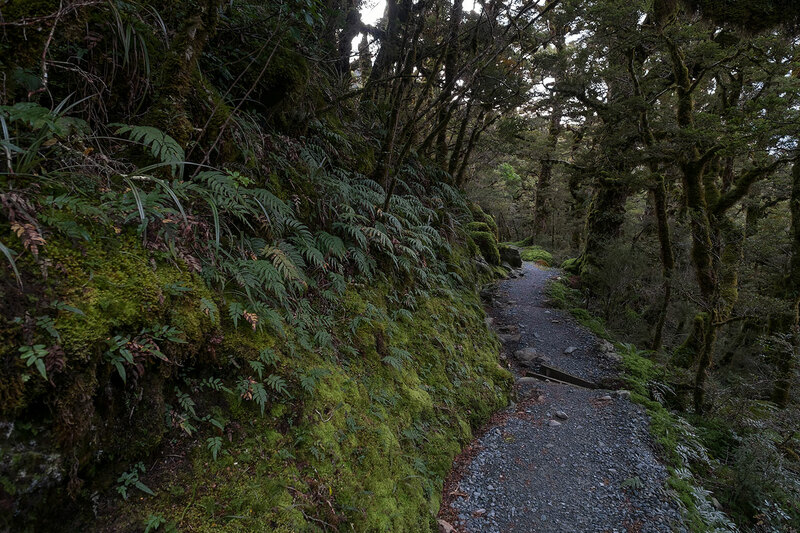 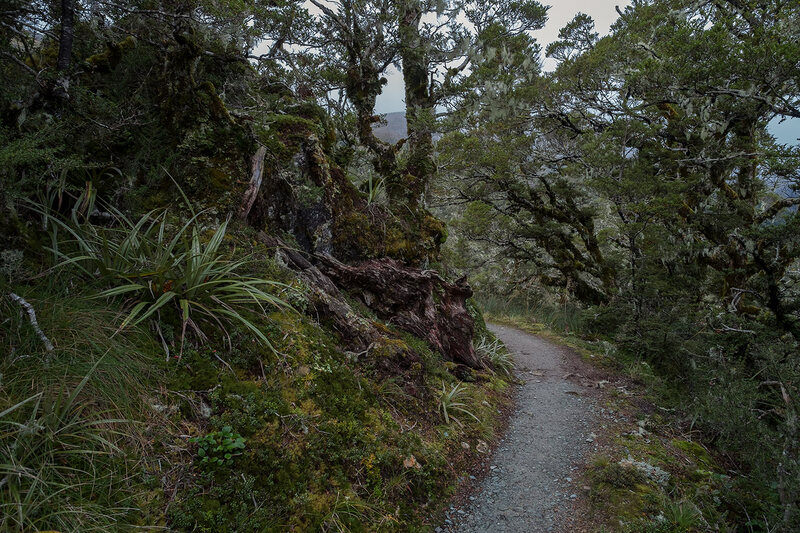 The track climbs steadily up the valley, through wetlands and tussock-covered flats, before sidling along the bluffs above Lake Harris to reach the highest point on the track at Harris Saddle / Tarahaka Whakatipu (1,255 m). 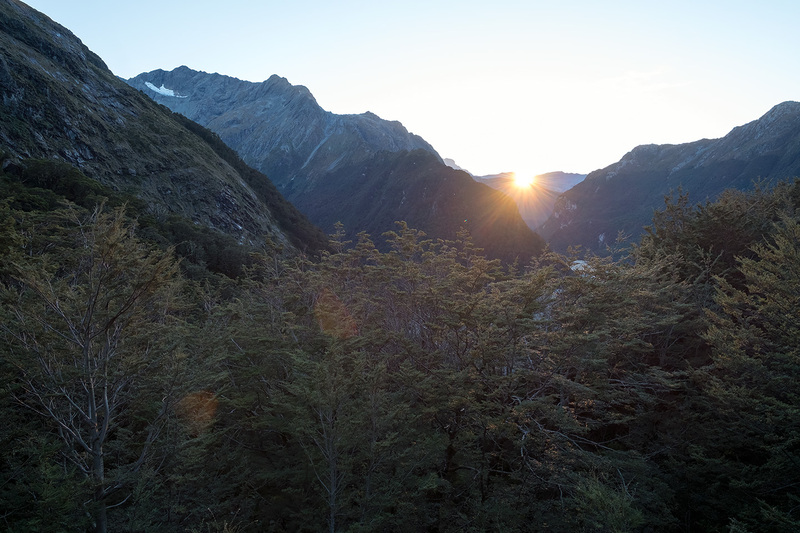 Sunrise on the deck at Routeburn Falls Hut. 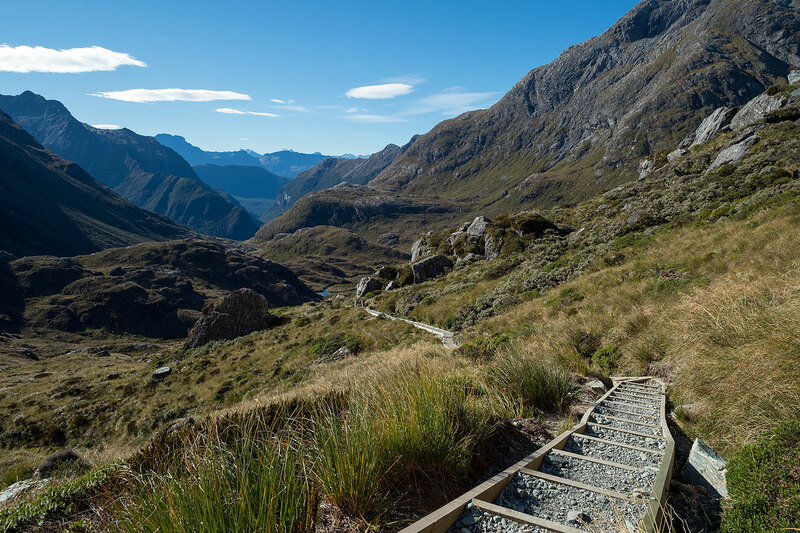 View from the track above Routeburn Falls Hut. 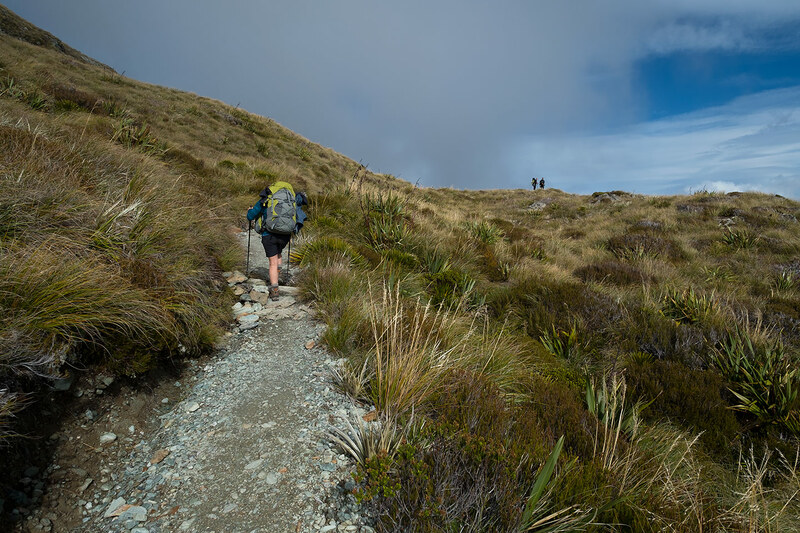 Now we are heading to that dip in the horizon in the far distance. 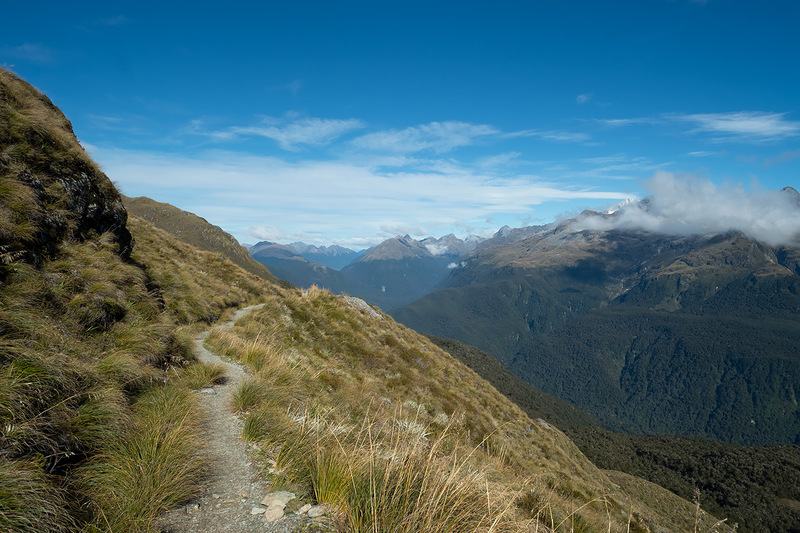 That's Harris Saddle. 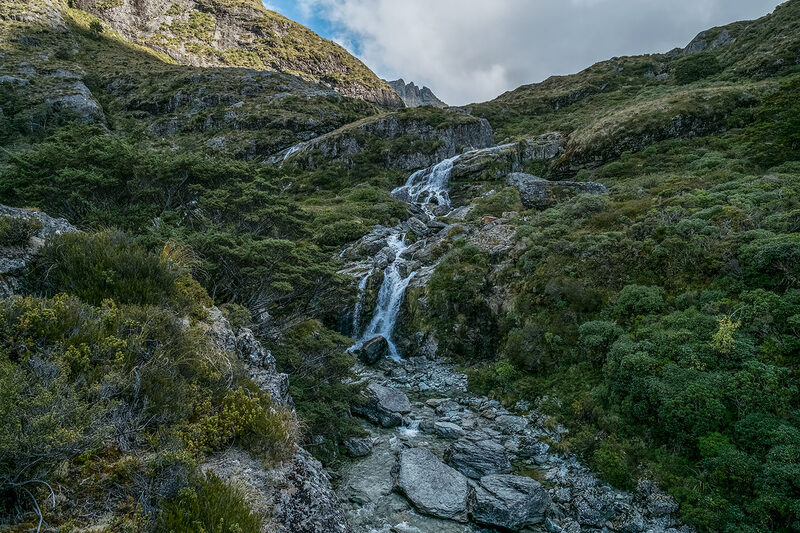 Looking back towards the top of the Routeburn Falls. 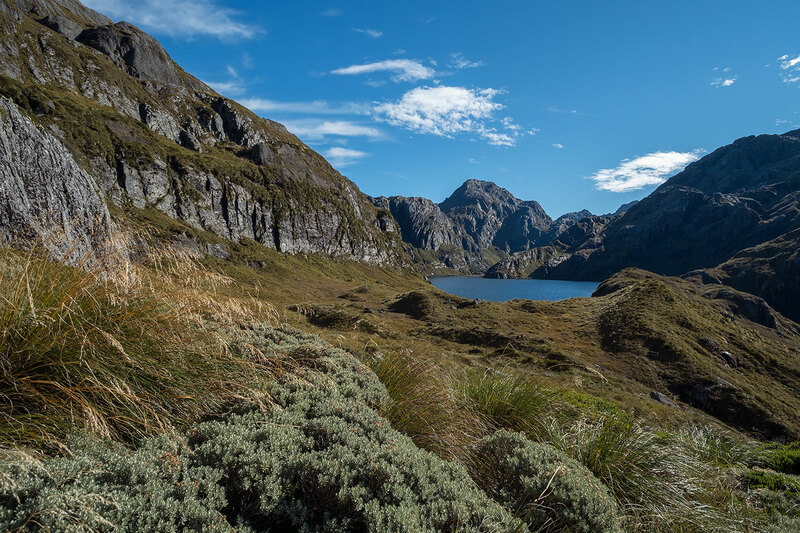 The endangered Pīwauwau / New Zealand Rock Wren (Xenicus gilviventris) can sometimes be seen around here. 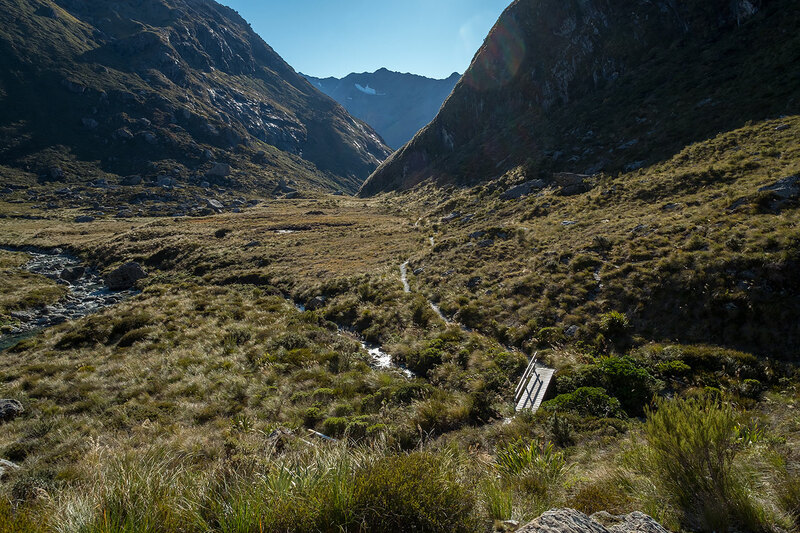 Looking back down the valley at how far we have come. 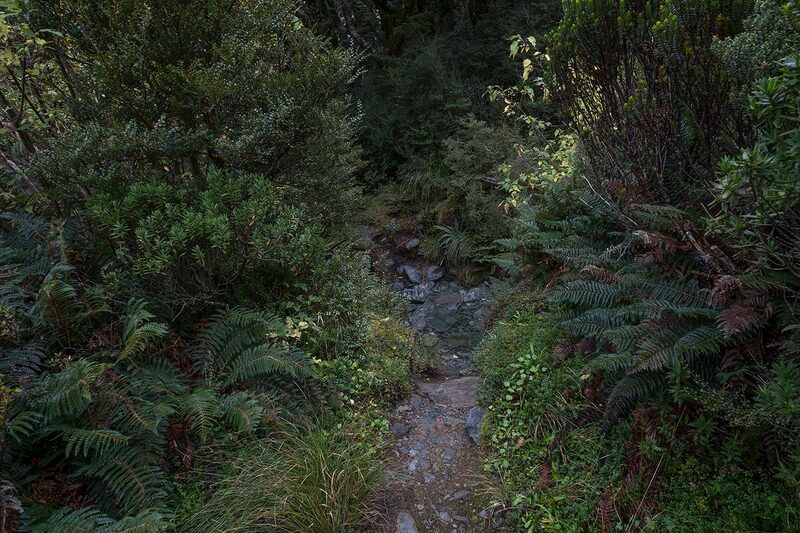 Now we begin to sidle across the bluffs above Lake Harris. 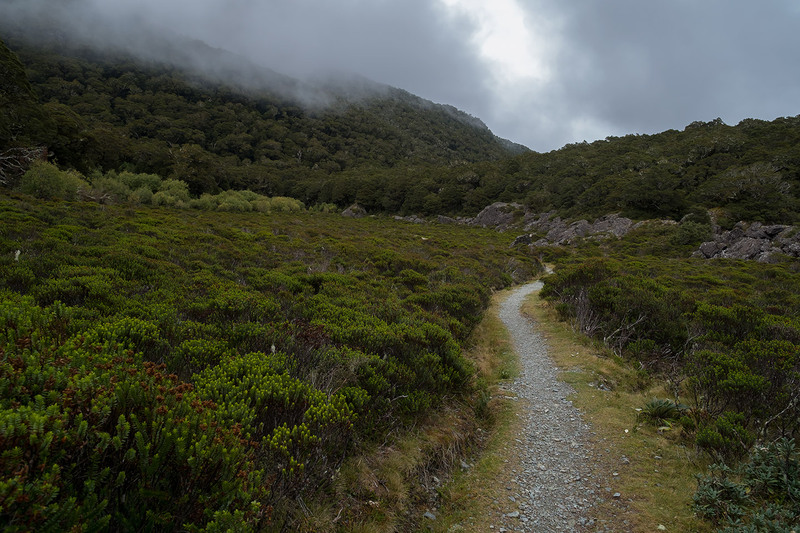 The wind is blasting strongly in our faces - and, just quietly, I hate sidling. 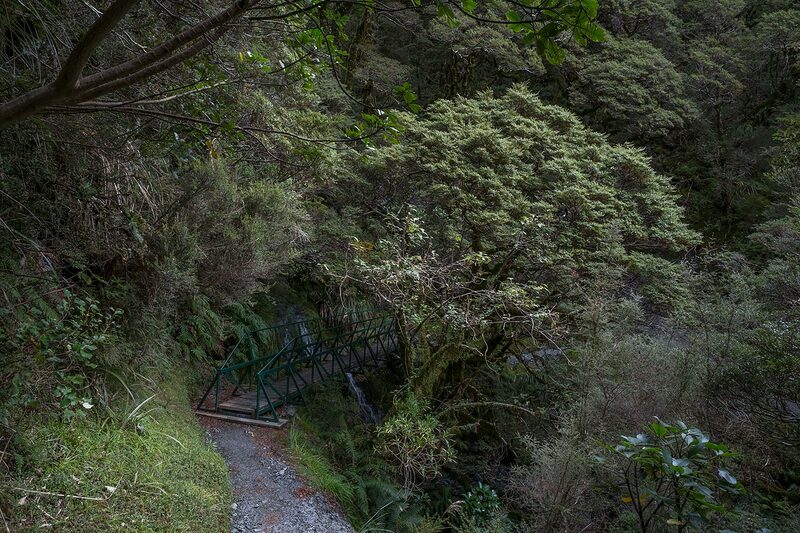 It means narrow tracks and big drop-offs - and I don't like heights. 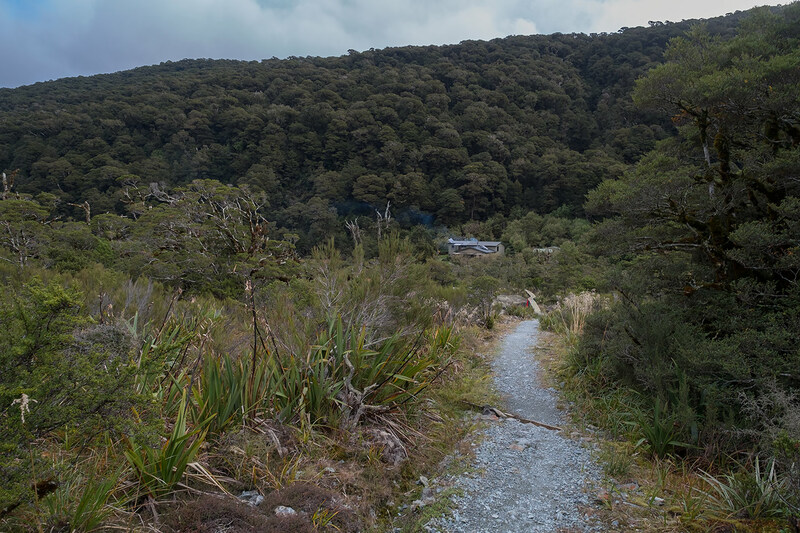 Looking back from a viewpoint next to the track. 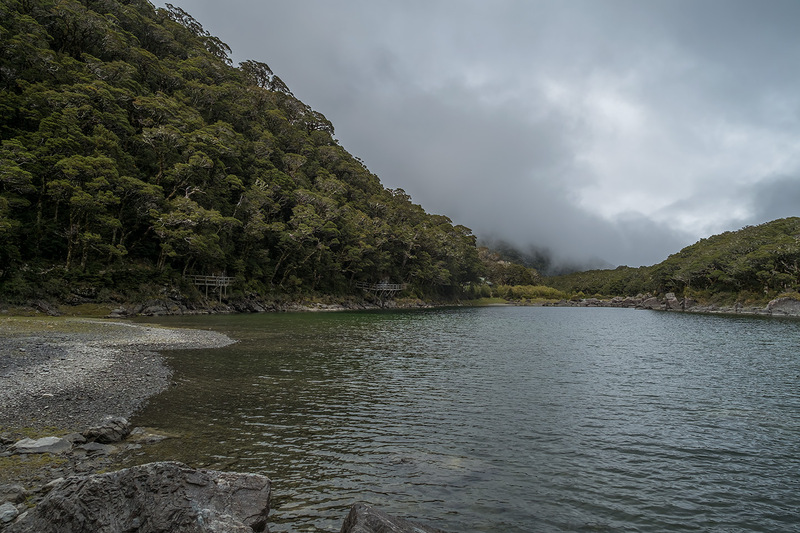 The wind was howling down the lake. 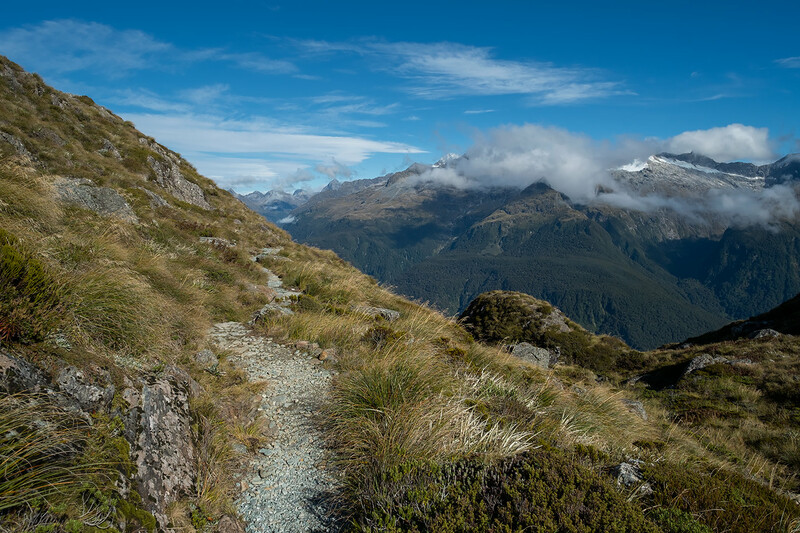 Oh wow... And then we come to this point on the track and it was all worth it - just for this one shot. 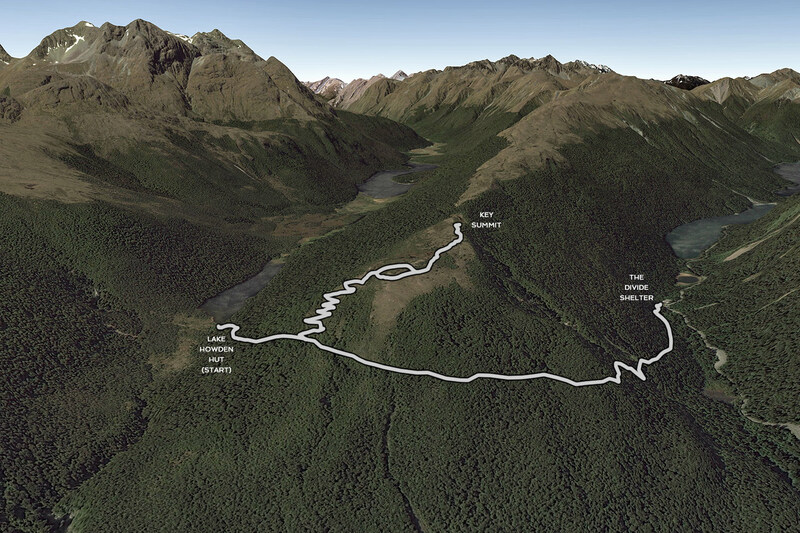 Harris Saddle. 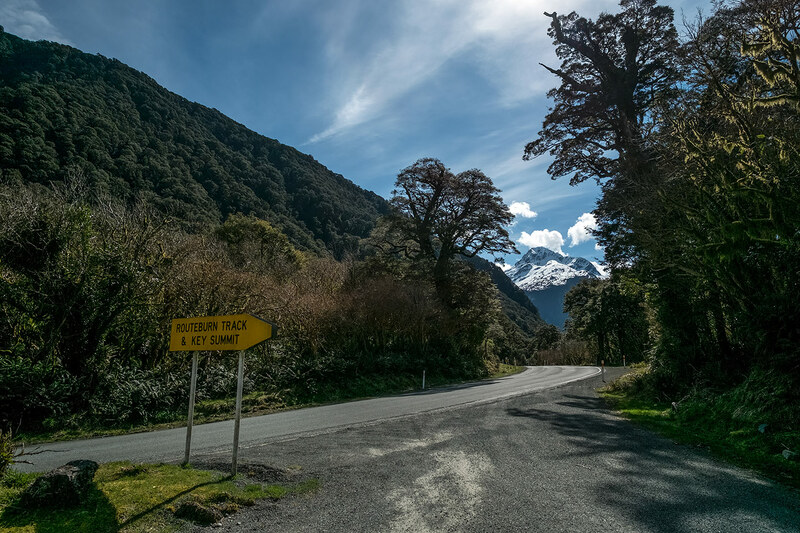 Now we cross over from Mount Aspiring National Park to Fiordland National Park. 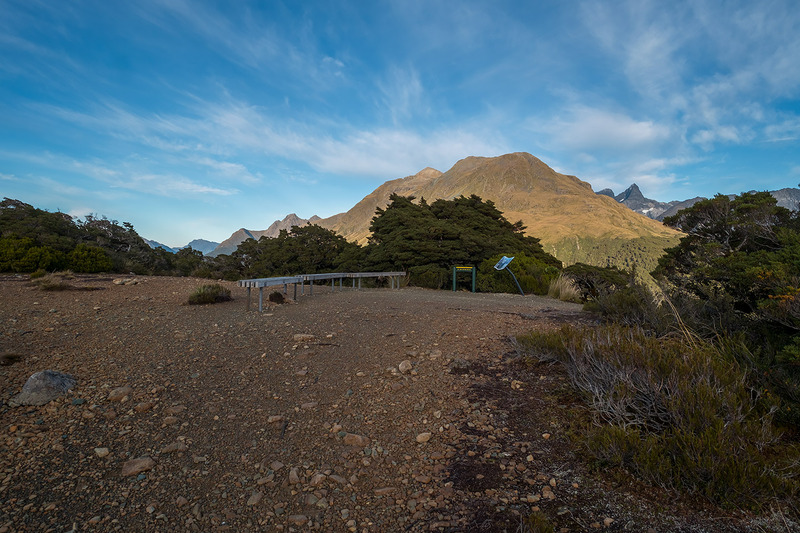 Harris Saddle with Harris Shelter and the Darran Mountains in the distance. 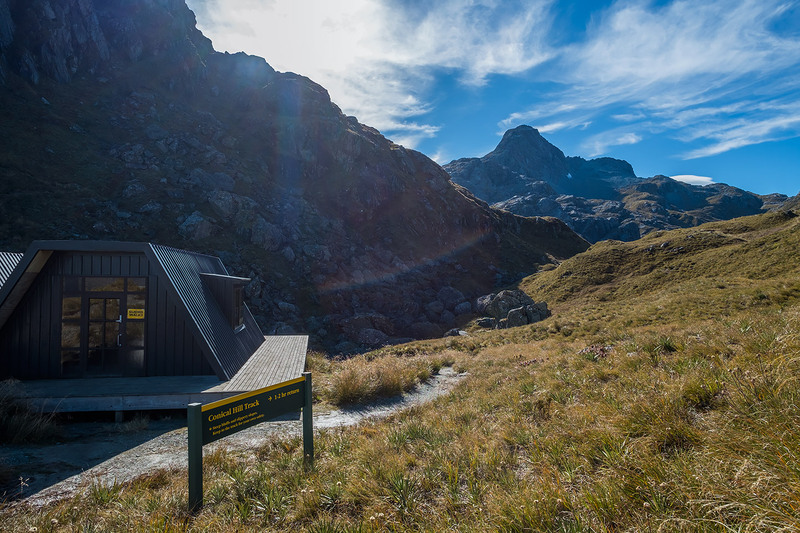 Harris Shelter and the track to climb up Conical Hill. 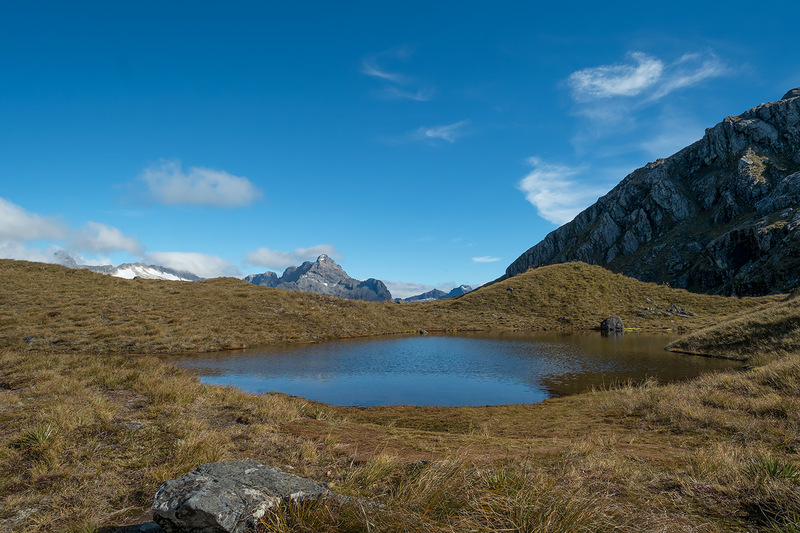 Harris Shelter and Conical Hill. 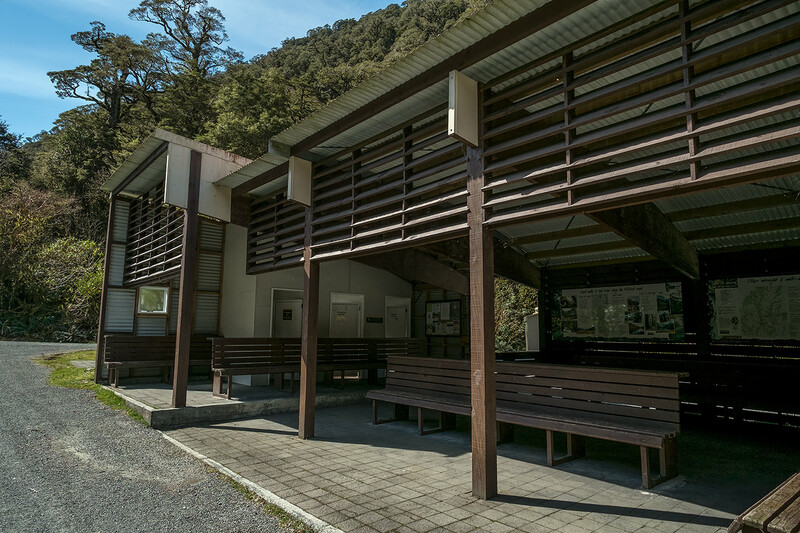 Harris Shelter. 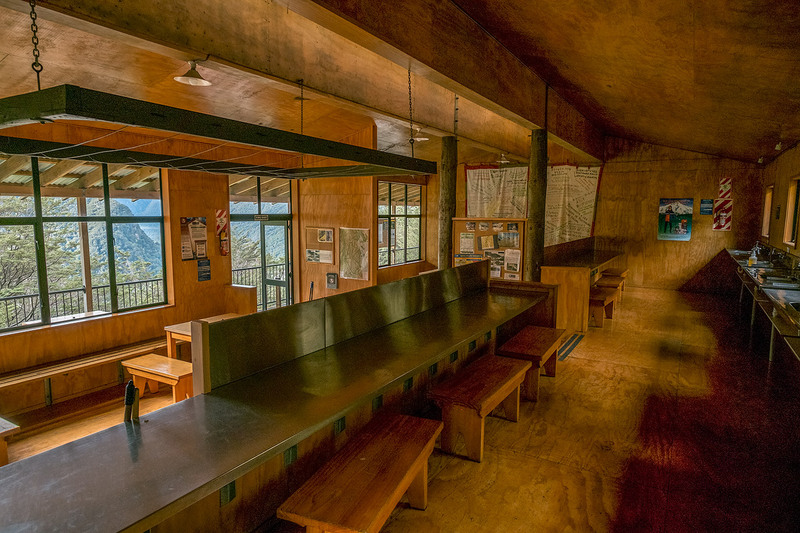 Lunchtime. 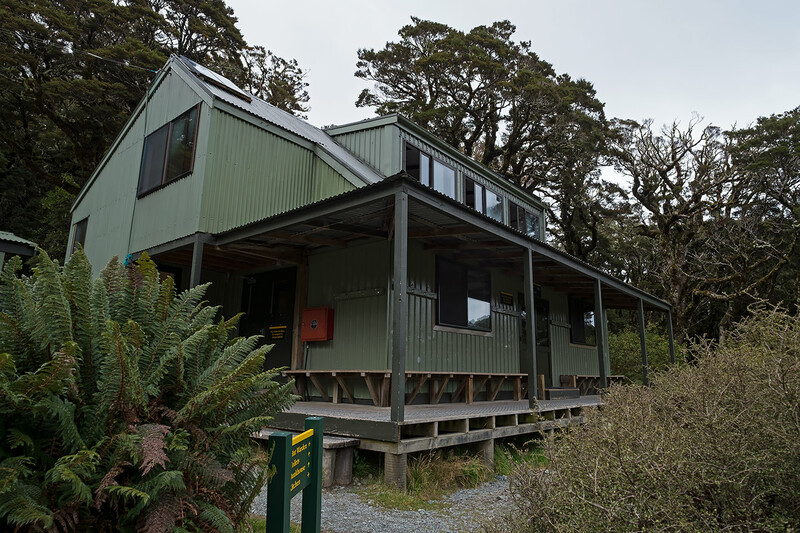 That steel roof is great to lean back on but very cold on our backs. 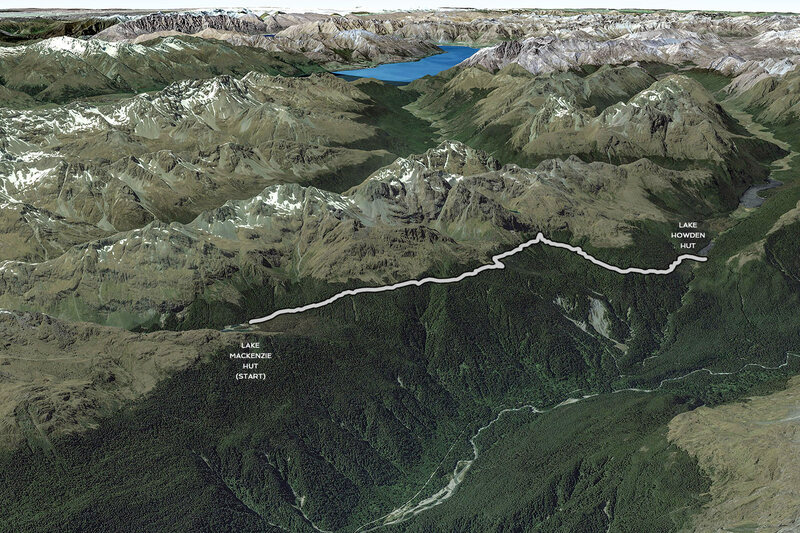 The 7 km tramp from Harris Shelter to Lake Mackenzie Hut takes 4 hours. 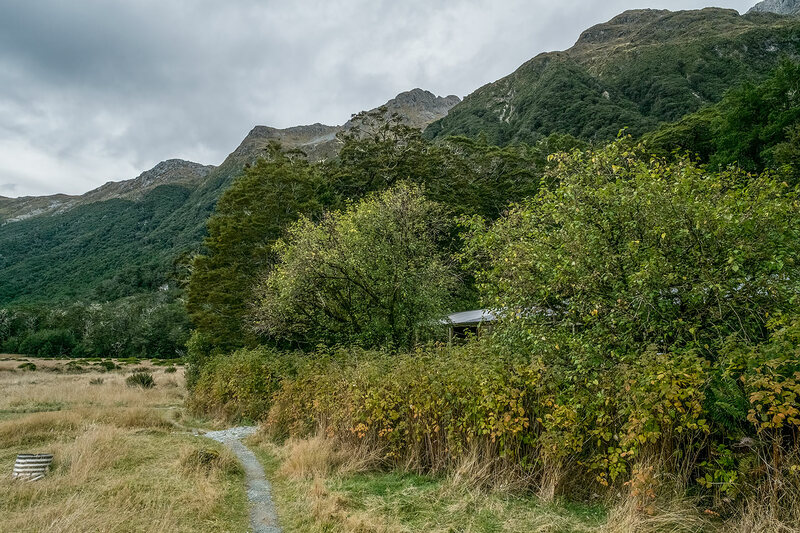 If the weather is clear, we will enjoy spectacular views of the Darran Mountains as we make our way along the exposed Hollyford Face for most of this part of today's walk. 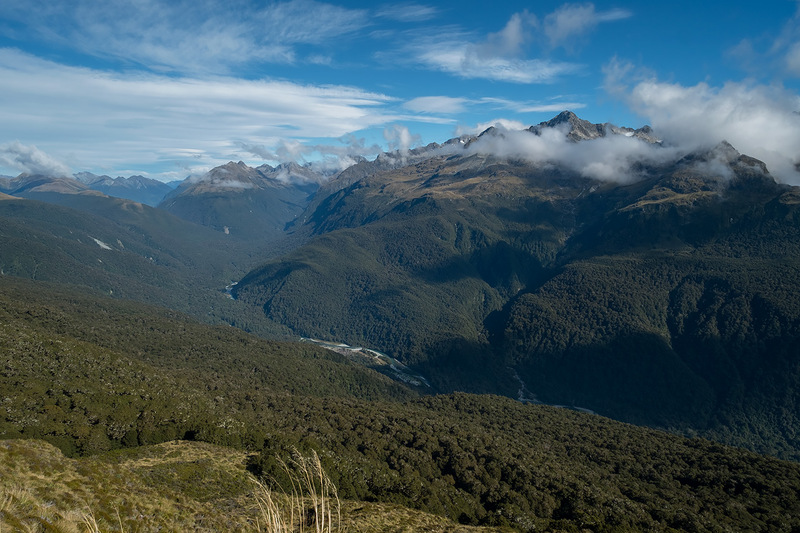 Looking down into the Hollyford Valley and across to the Darran Mountains. 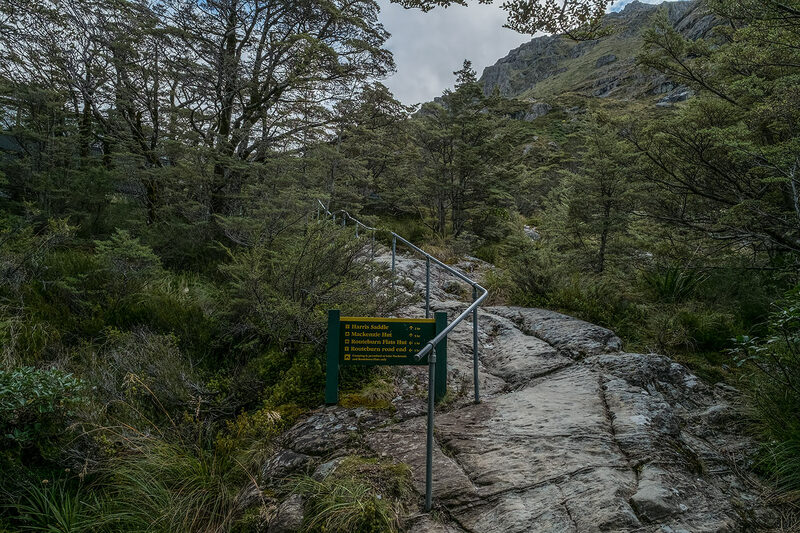 Coming up to the end of our walk along the Hollyford Face. 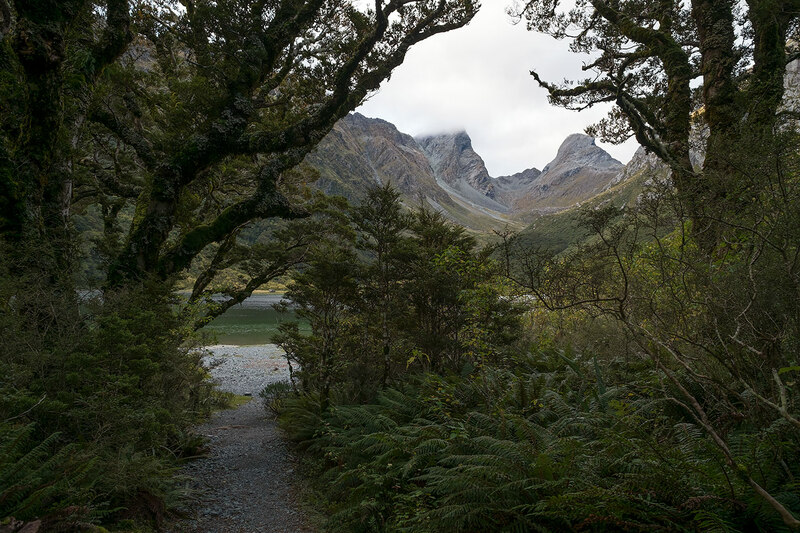 There it is - Lake Mackenzie Hut down there in the distance (just to the left of centre in this photo). 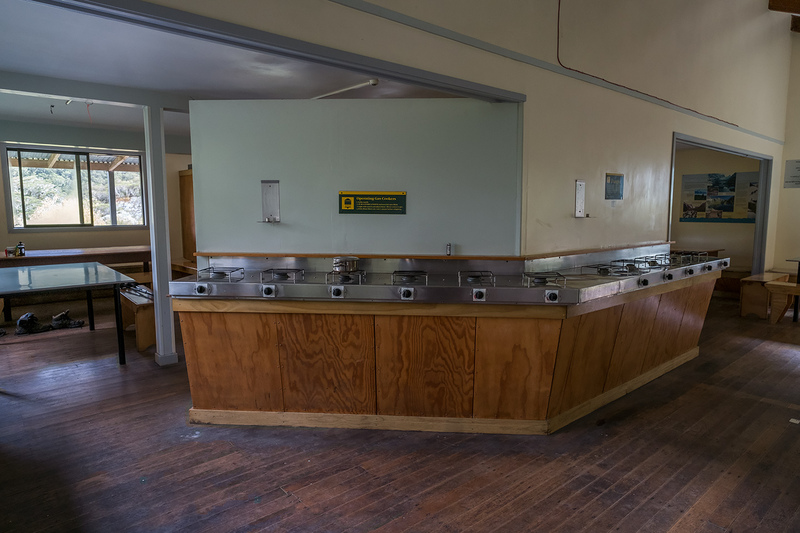 Don't get too excited though... 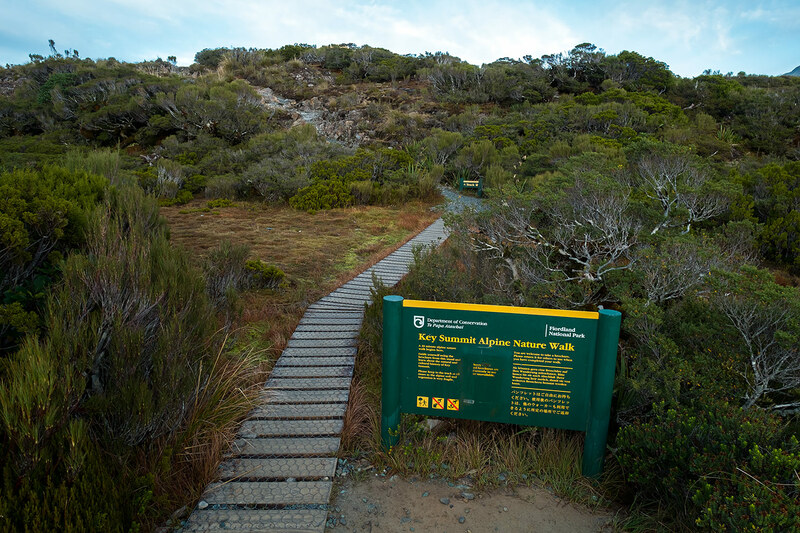 It takes ages to get there. 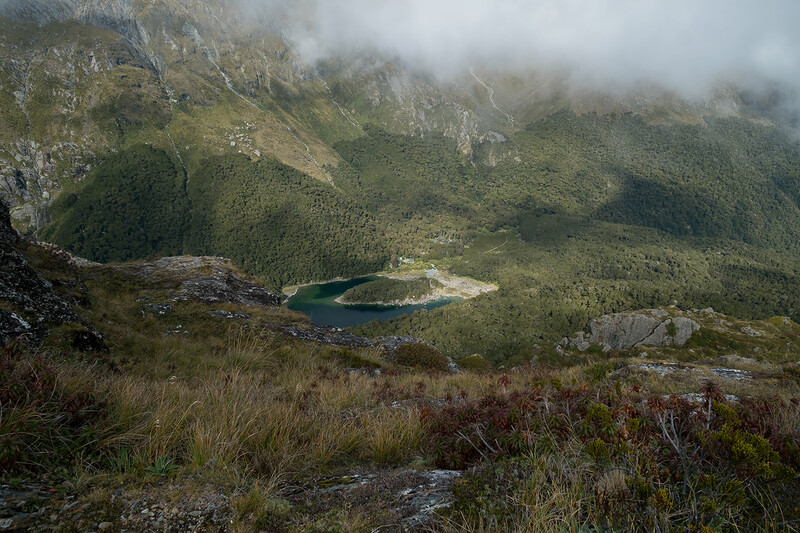 Looking down on Lake Mackenzie. 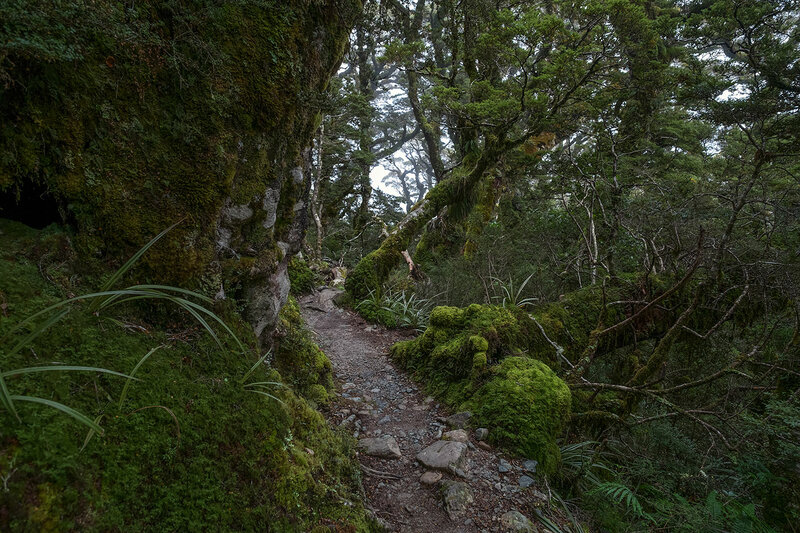 The track enters beautiful forest. 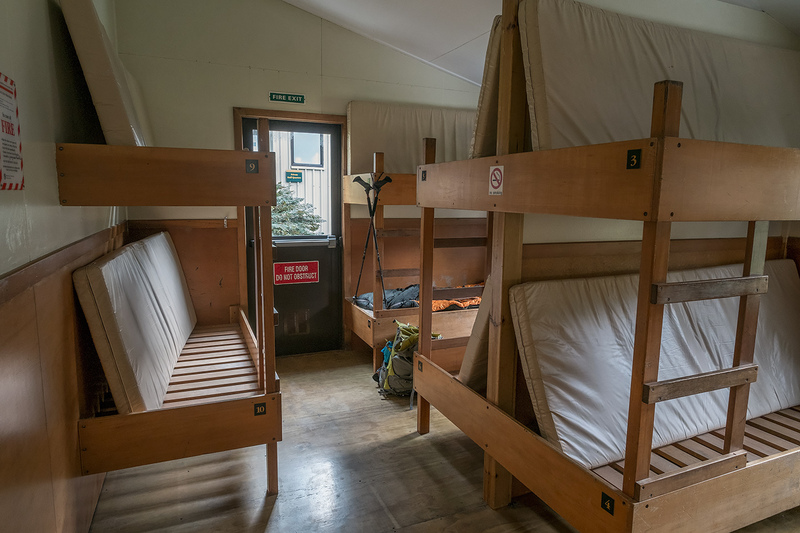 LAKE MACKENZIE HUT - 50 bunk beds, gas cooking (during Great Walks season), heating, lighting, mattresses. 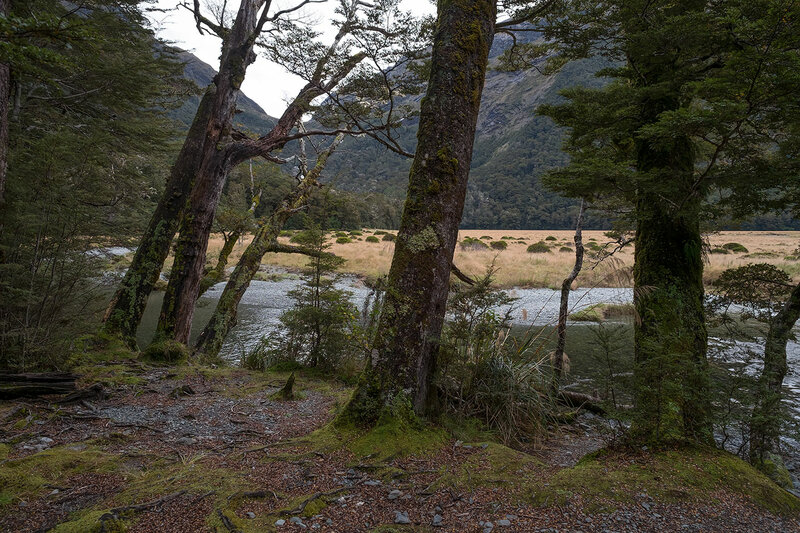 LAKE MACKENZIE HUT - Looking from the deck towards the Ranger's Hut and Lake Mackenzie. 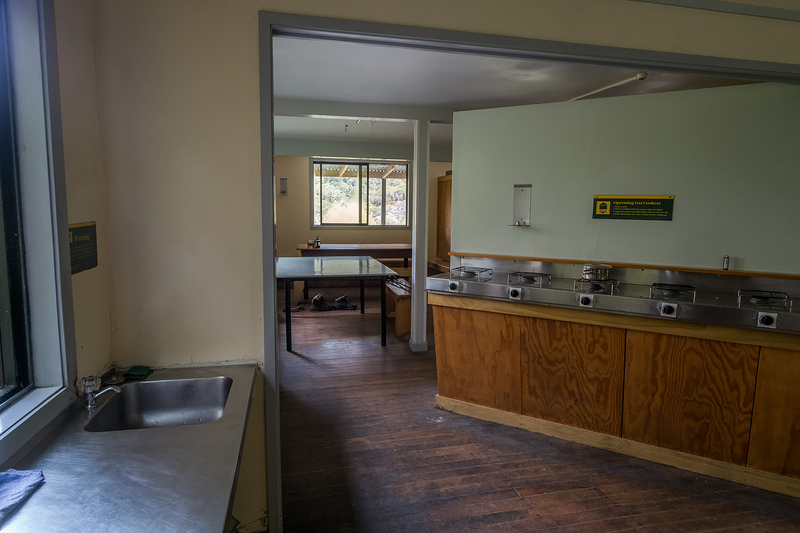 LAKE MACKENZIE HUT - Dining Area. 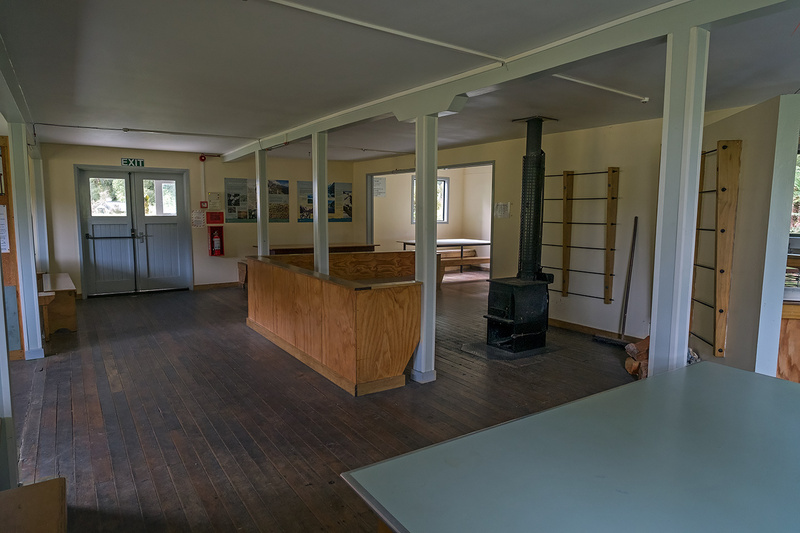 LAKE MACKENZIE HUT - Dining Area and seating around Woodburner for heating the hut. 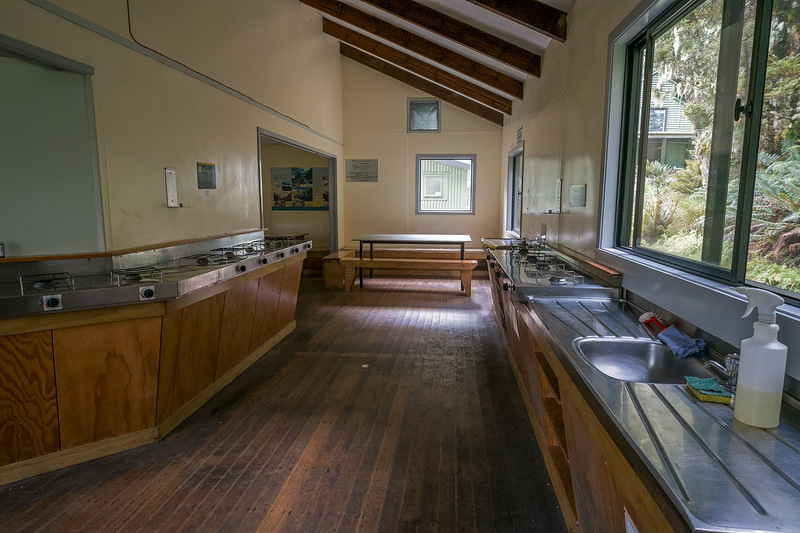 LAKE MACKENZIE HUT - Kitchen. 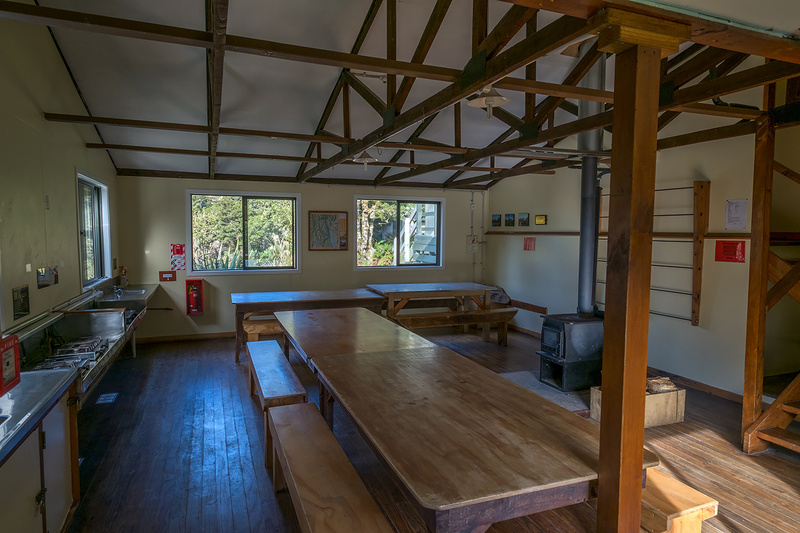 LAKE MACKENZIE HUT - Seating around fireplace. 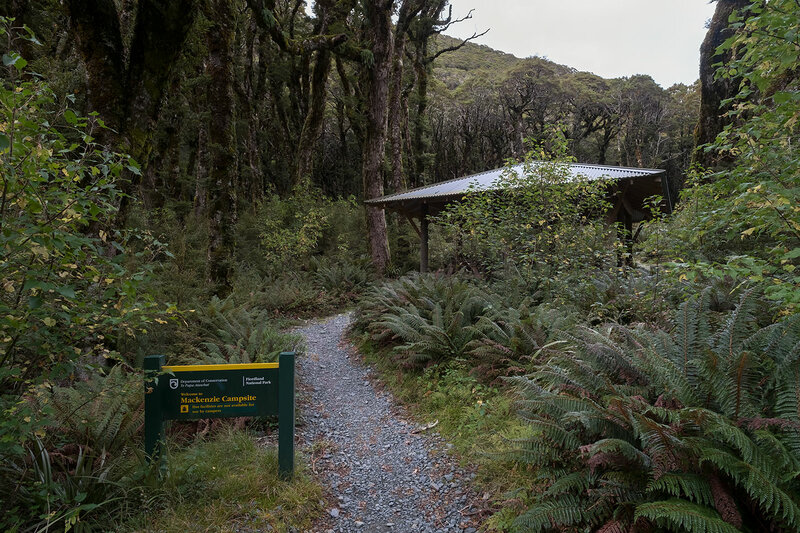 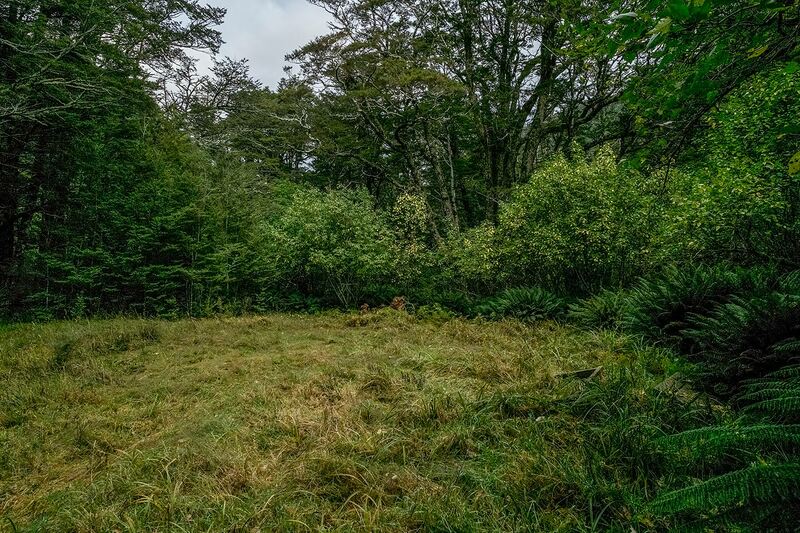 On this very spot, we get to hear what is famously known as New Zealand's longest hut talk by a ranger. 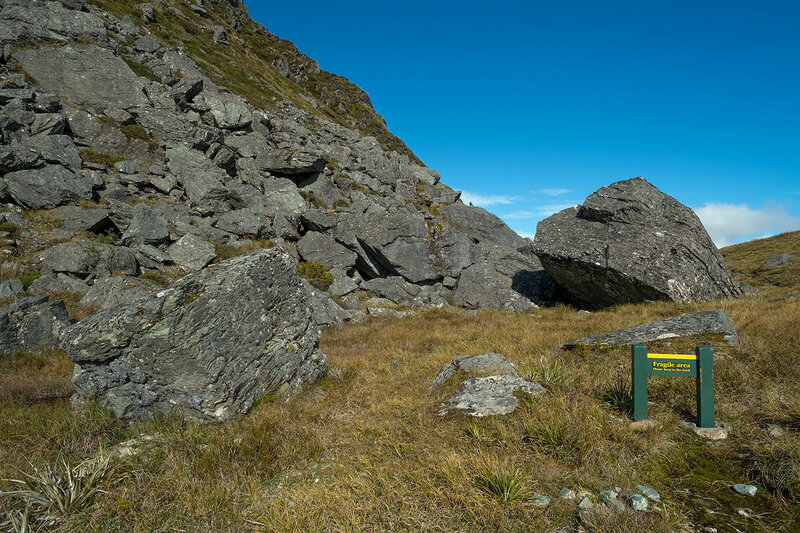 It is very interesting - but after a 6 hour alpine traverse, it's hard to stay excited by this lengthy lesson in trapping stoats. 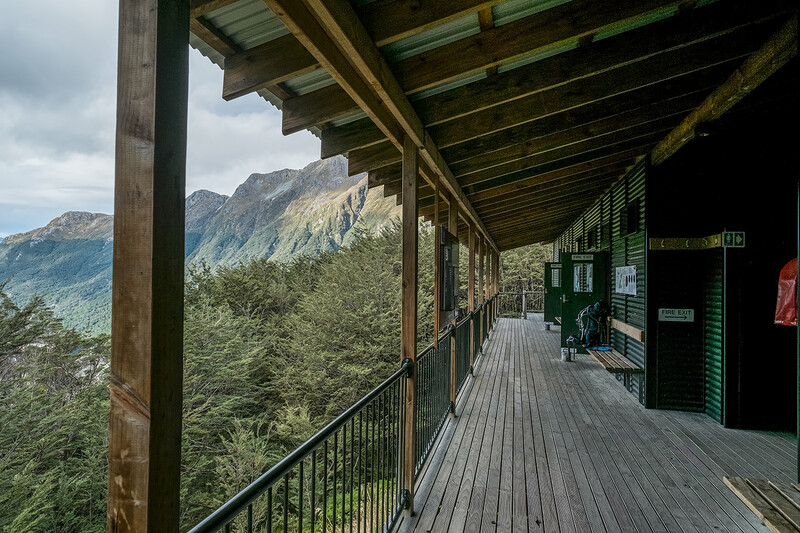 LAKE MACKENZIE HUT - Looking from the corner of the deck towards the Toilets. 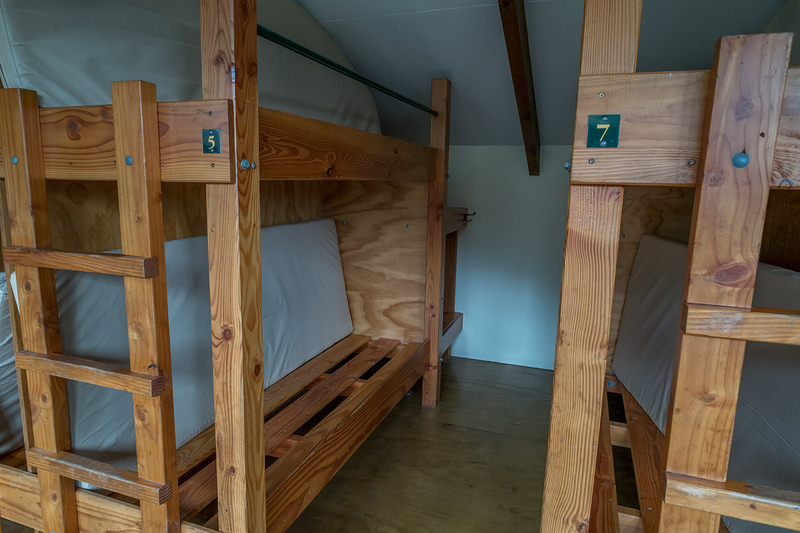 The open door leads to the Upstairs Bunkroom. 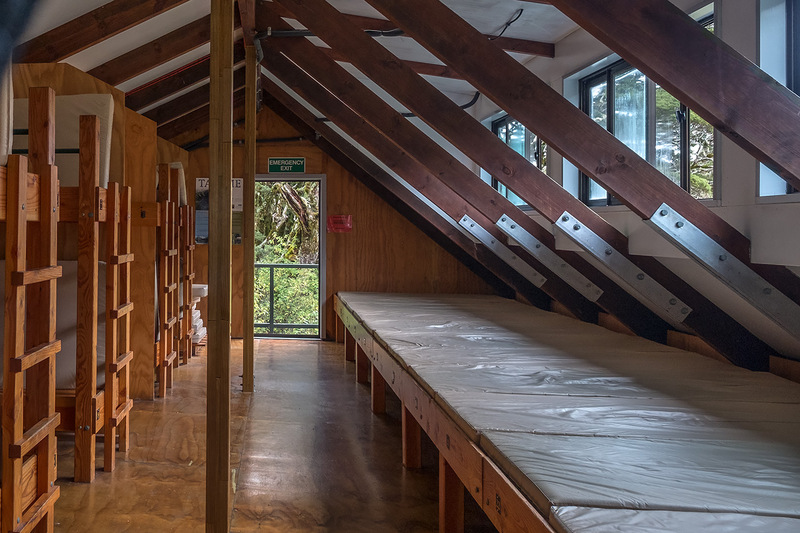 LAKE MACKENZIE HUT - The Upstairs Bunkroom. 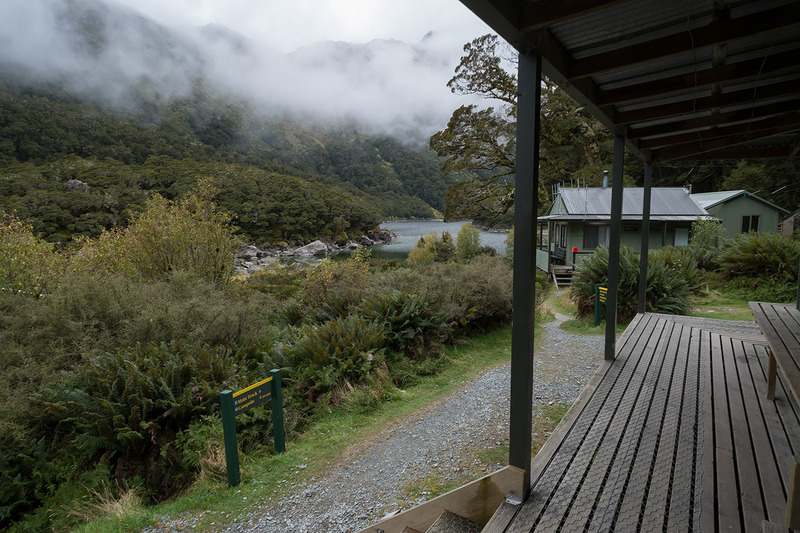 LAKE MACKENZIE HUT - Heading back down from the Upstairs Bunkroom. 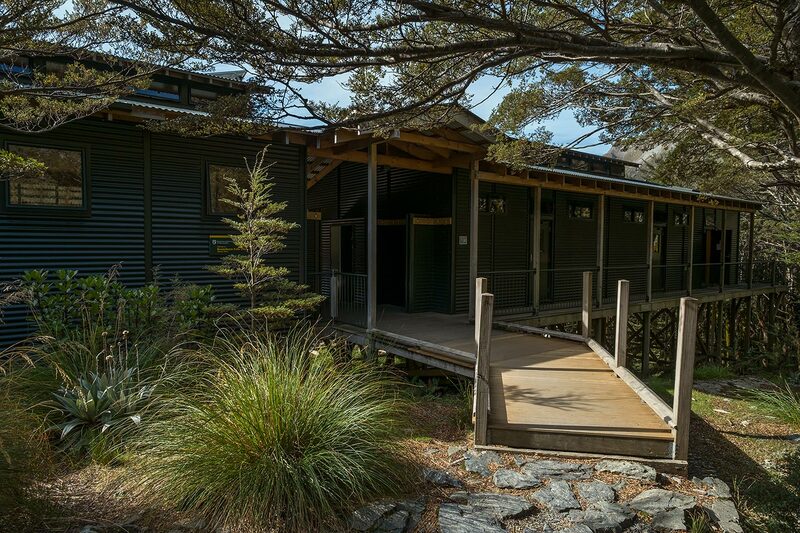 LAKE MACKENZIE HUT - Toilets and Ablution Block. 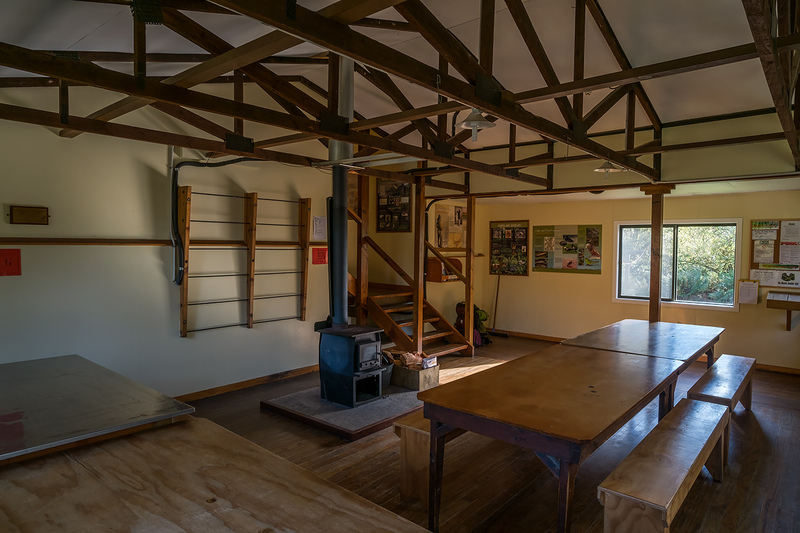 LAKE MACKENZIE HUT - Looking from the Toilets and Ablution Block towards the Second Bunkroom. 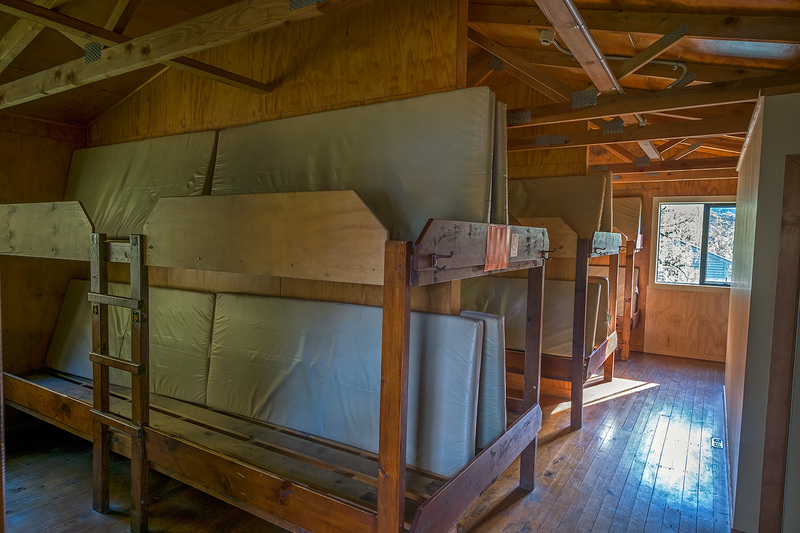 LAKE MACKENZIE HUT - The Second Bunkroom. 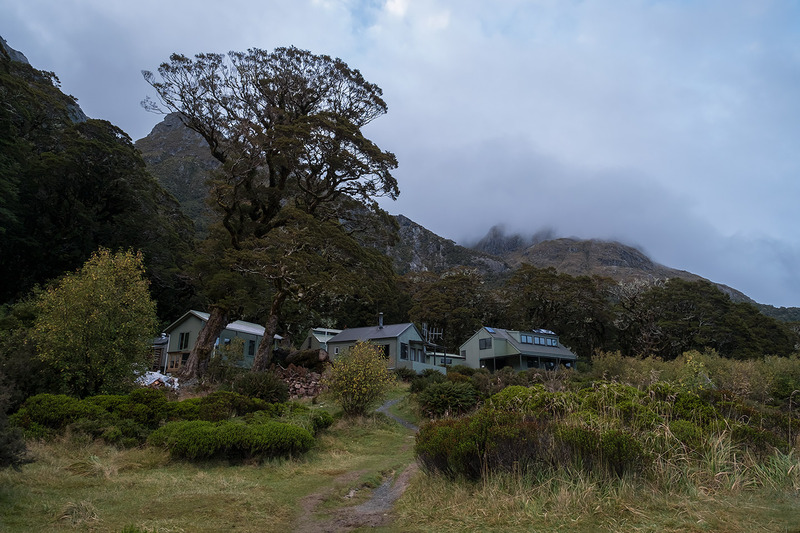 LAKE MACKENZIE HUT - Ranger's Hut. 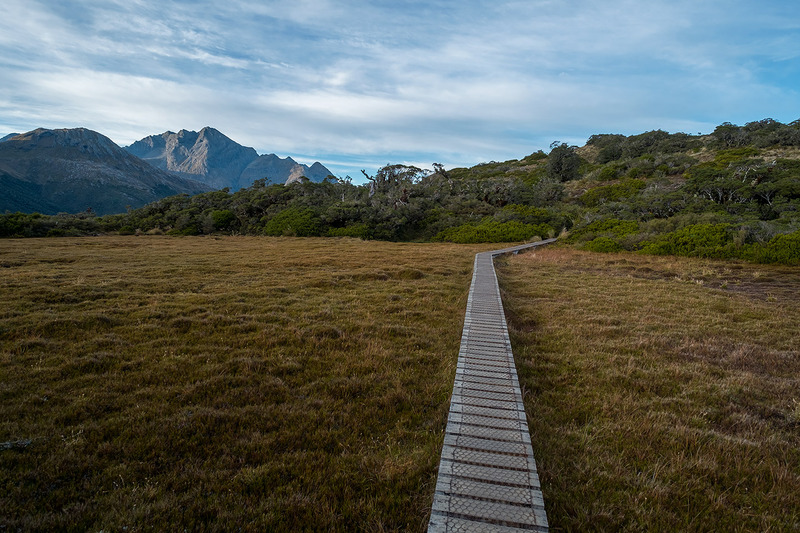 Heading towards the Mackenzie Campsite and the Split Rock. 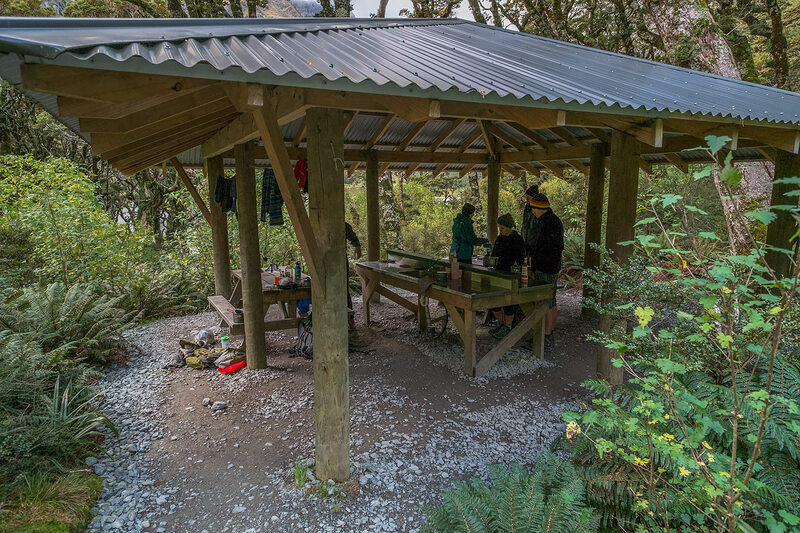 MACKENZIE CAMPSITE - 9 gorgeous tent sites, cooking shelter, toilet. 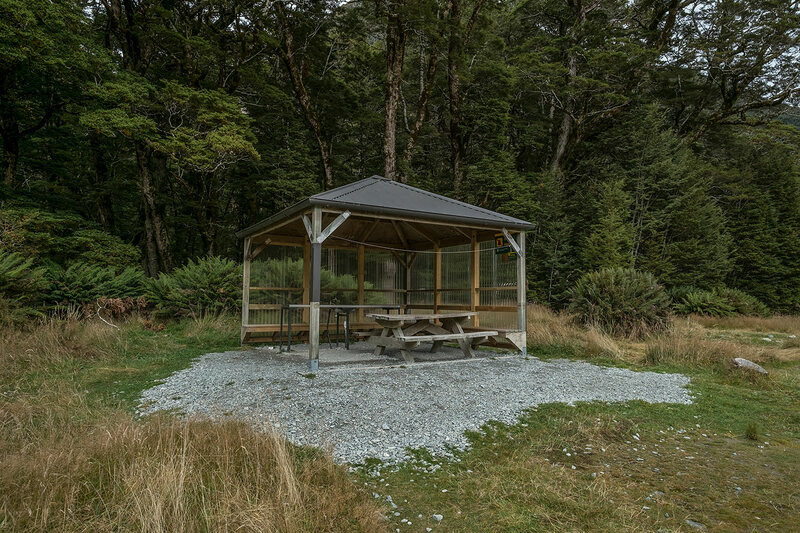 MACKENZIE CAMPSITE - Cooking Shelter. 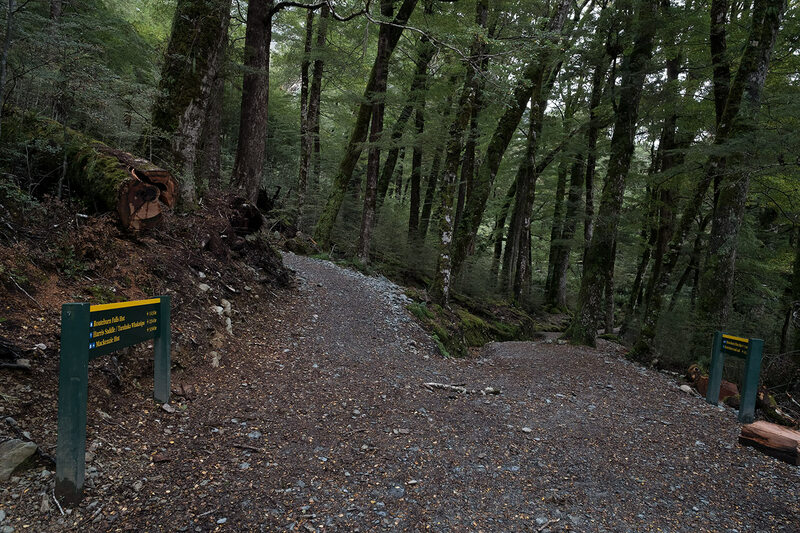 It is just a very short walk from Mackenzie Campsite to the lake. 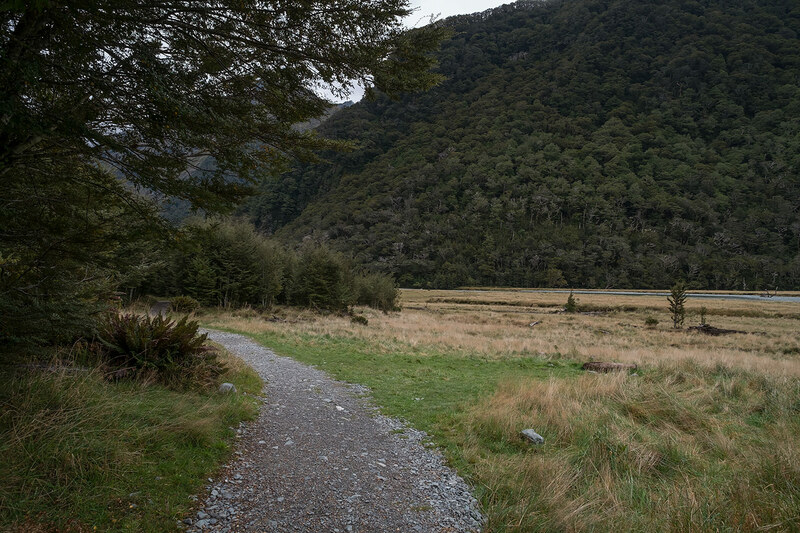 Returning almost to the campsite, now we will take the track to Split Rock. 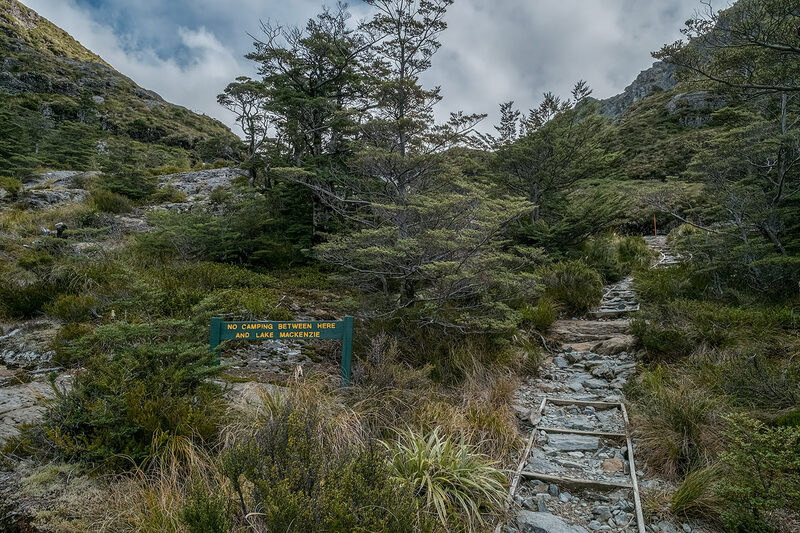 The track to Split Rock is far less civilised than we've become used to on the Routeburn. 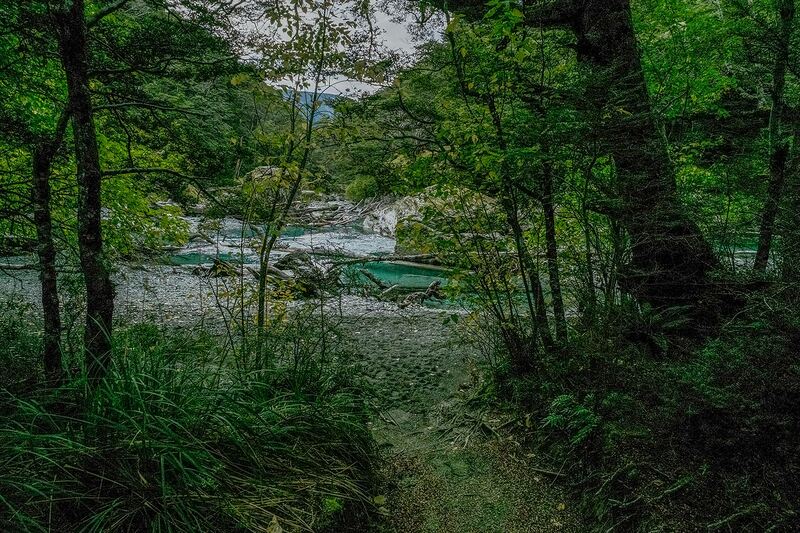 That's it... 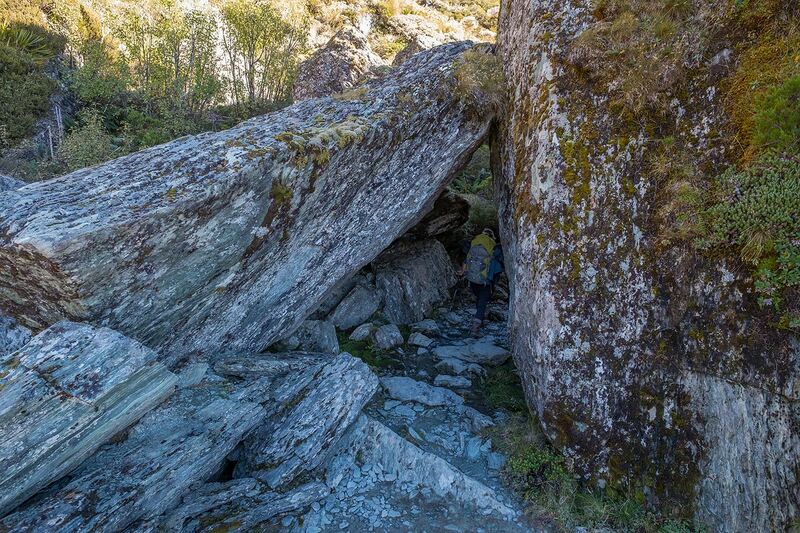 The Split Rock. 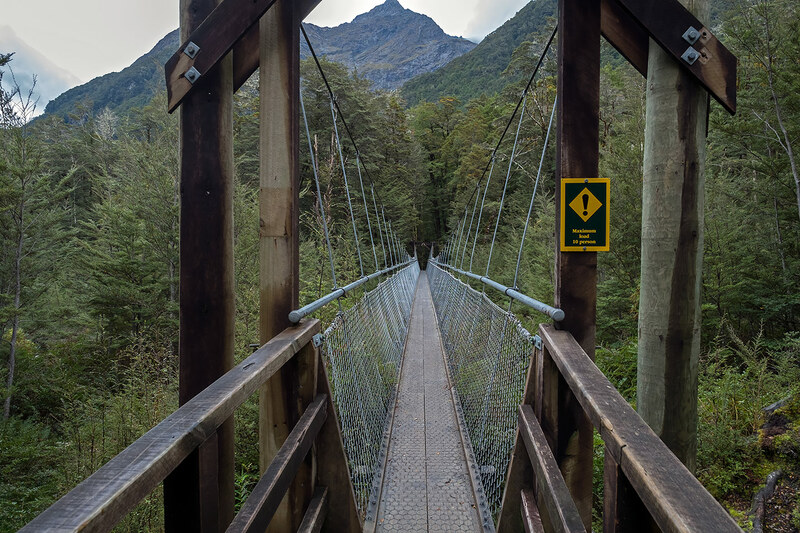 We can actually walk right through the split to the other side if we want. 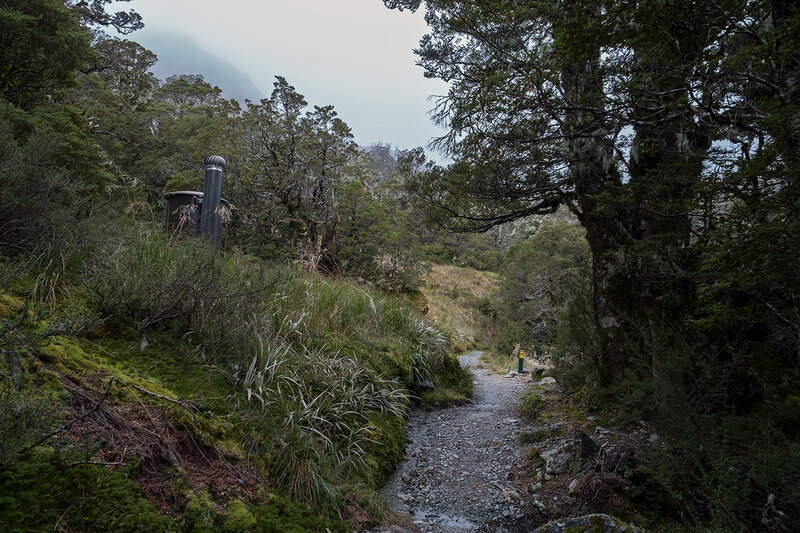 Heading back from the Split Rock to Lake Mackenzie Hut and dinner and New Zealand's Longest Hut Talk By A Ranger about how he started the very admirable stoat trapping program in these parts. 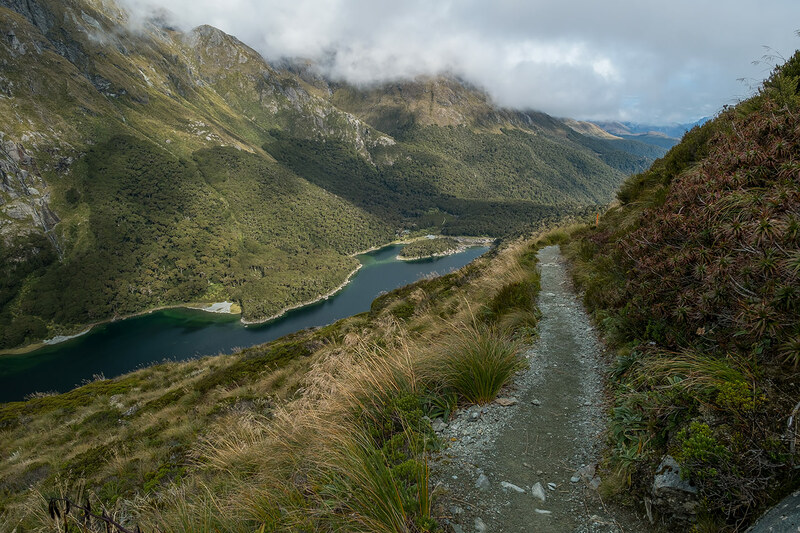 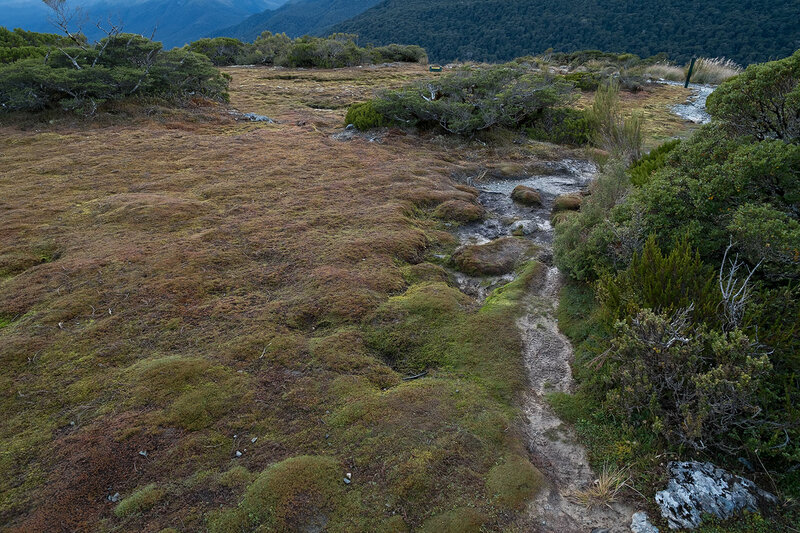 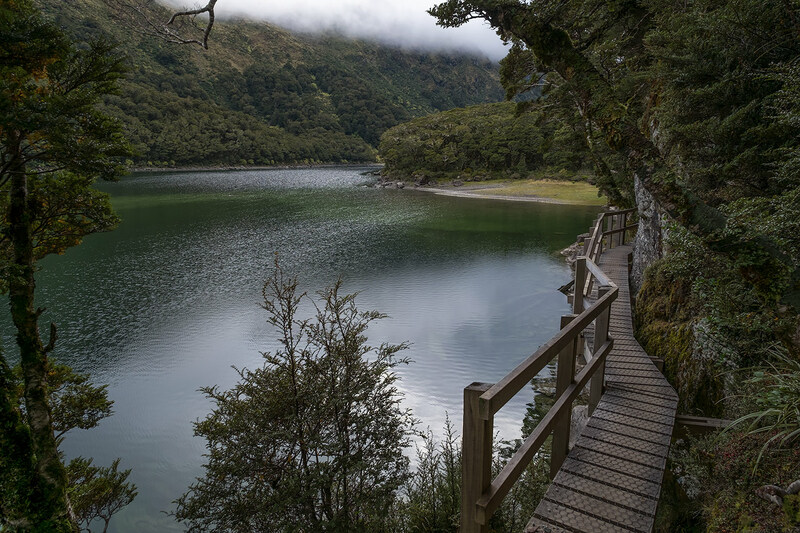 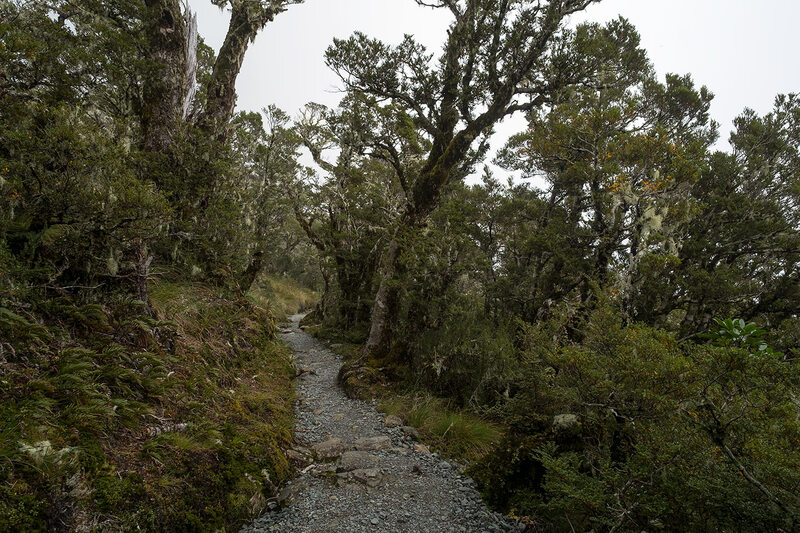 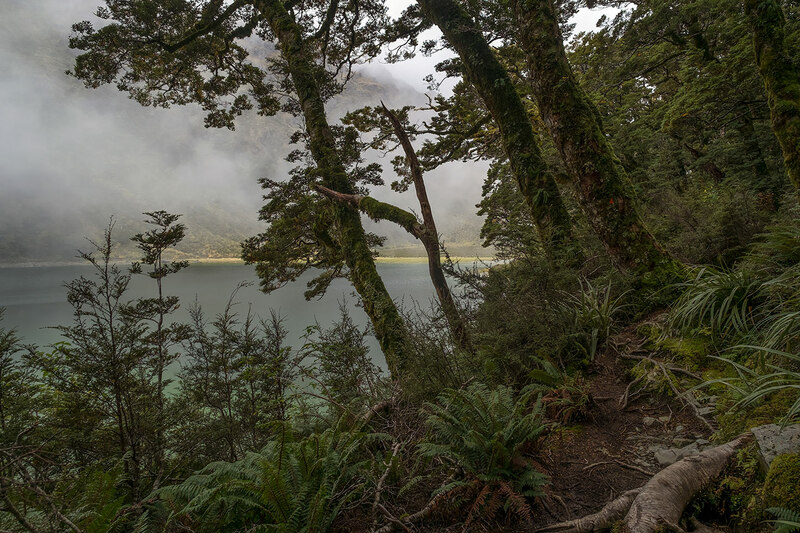 The fairly easy 8.6 km walk from Lake Mackenzie Hut to Lake Howden Hut takes 4 hours. 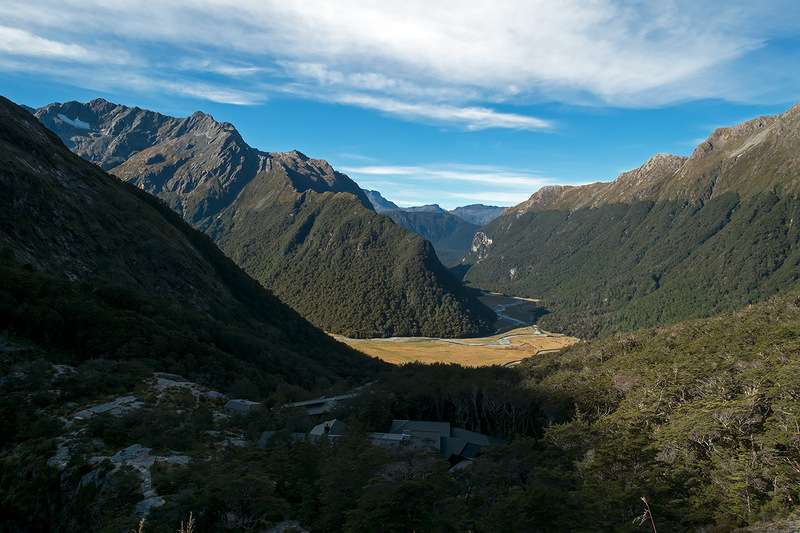 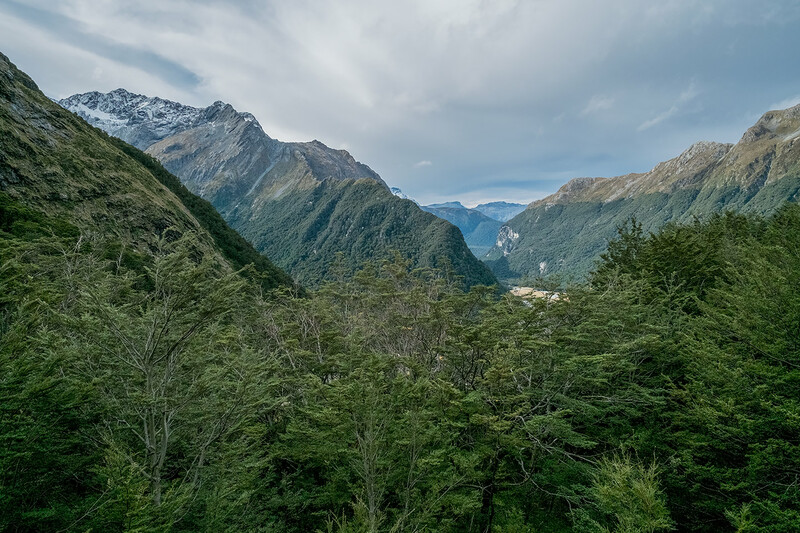 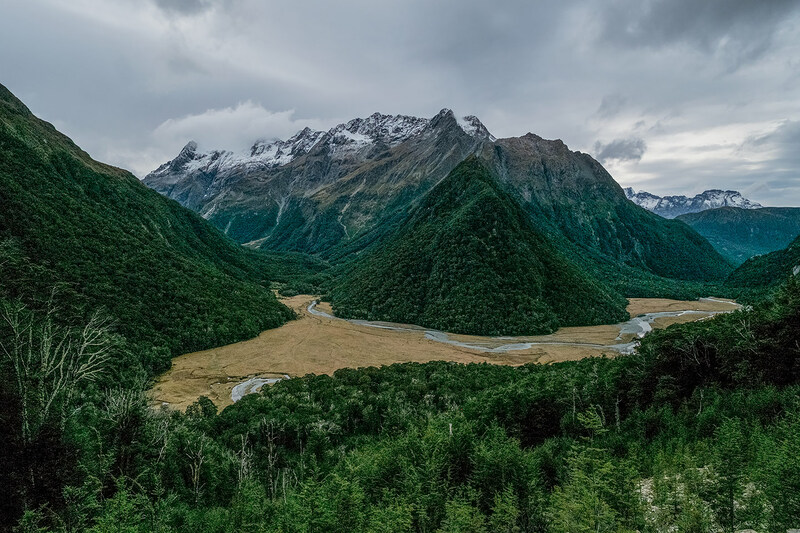 Looking down into the Hollyford Valley. 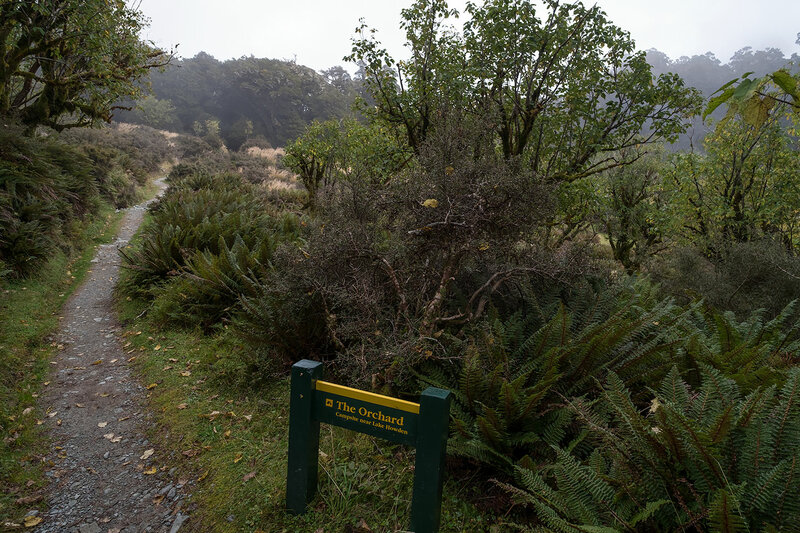 This bit of the track is called The Orchard. 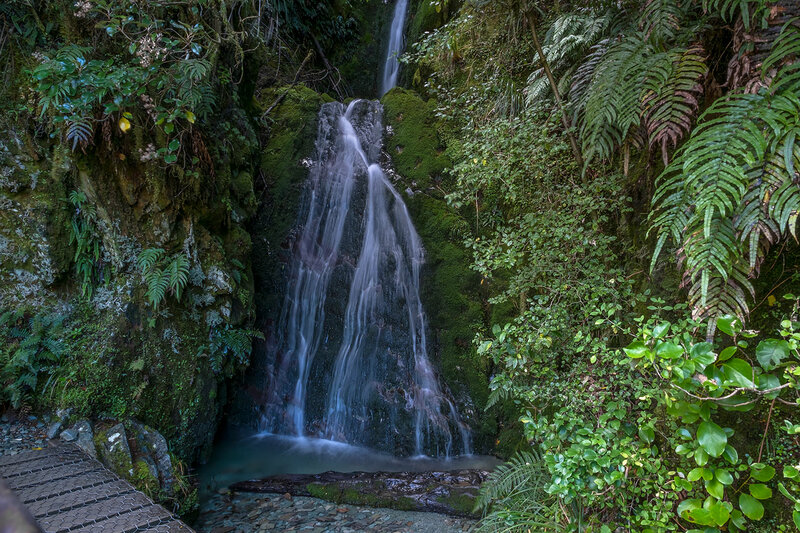 A stunningly beautiful little waterfall. 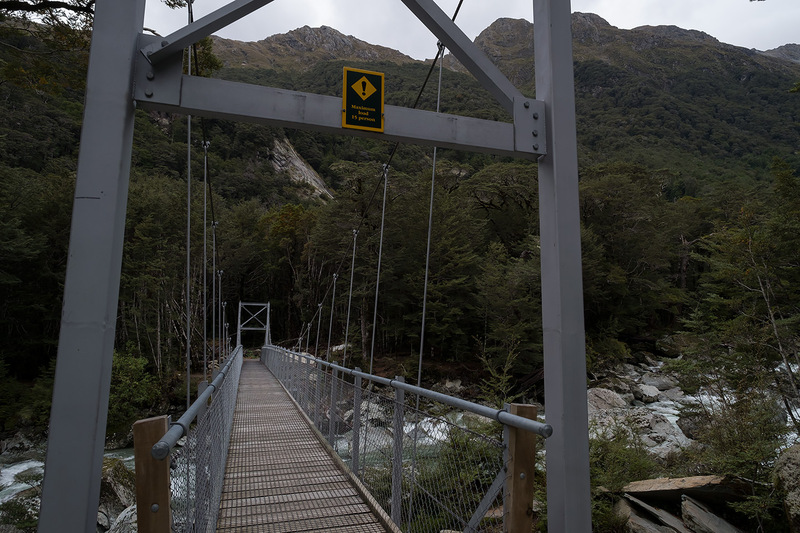 Some of the bridges on the Routeburn are taken out by helicopter during Avalanche Season. 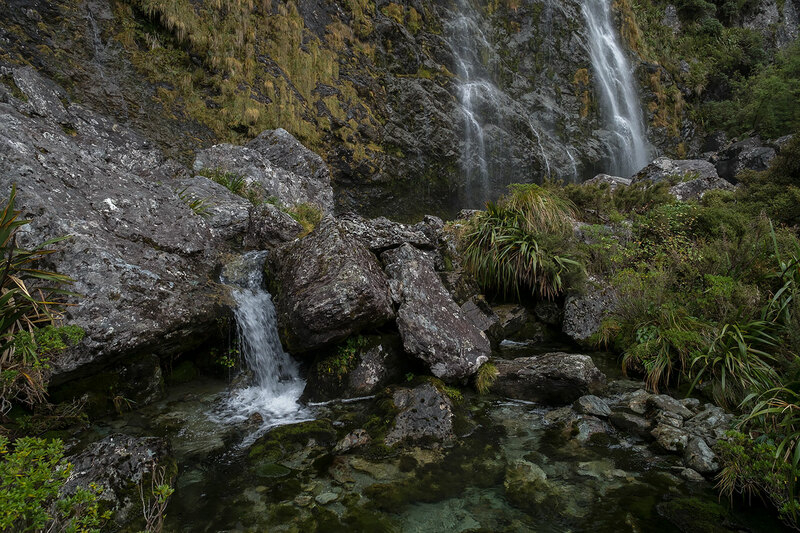 From this point we can hear the roar of Earland Falls in the distance. 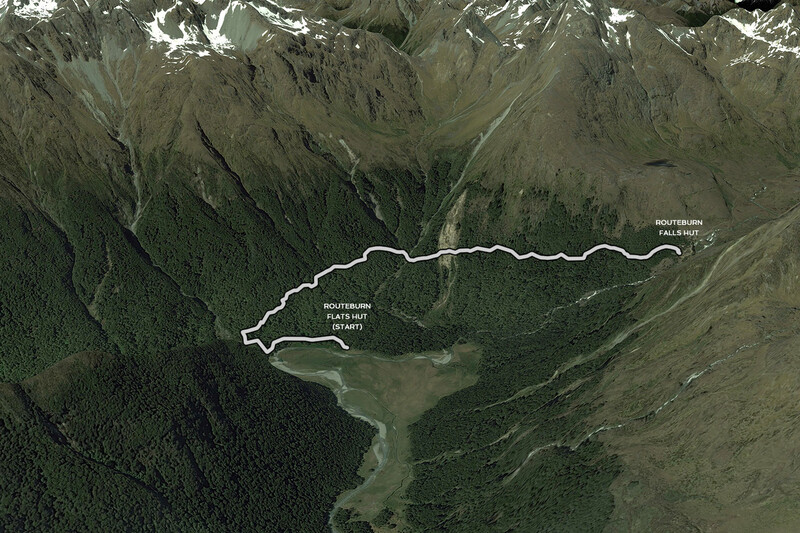 This is the Flood Detour if the flow over Earland Falls is too great to pass underneath. 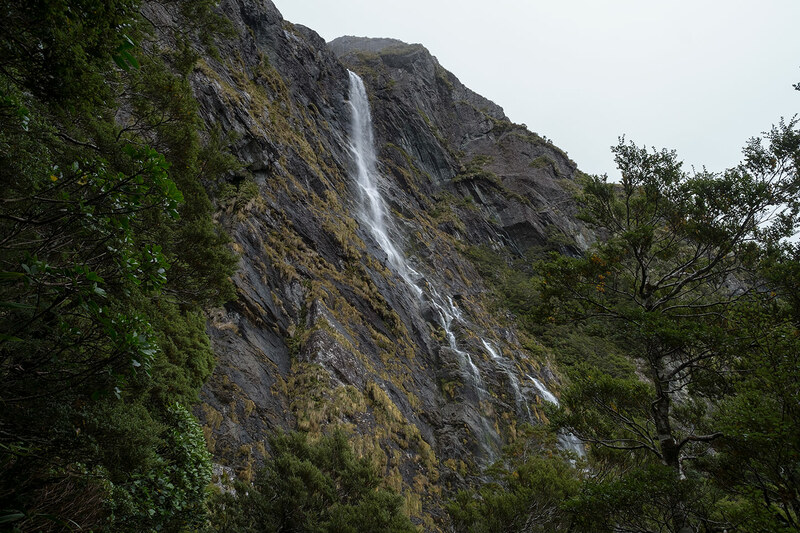 Earland Falls - 174 metres high. 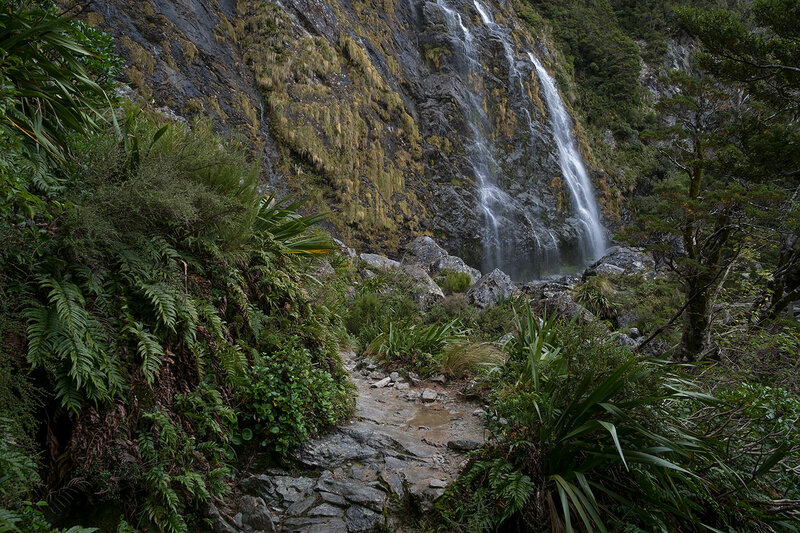 Earland Falls - After heavy rain the falls cascade right onto the track, enabling hikers to walk "under" the waterfall. 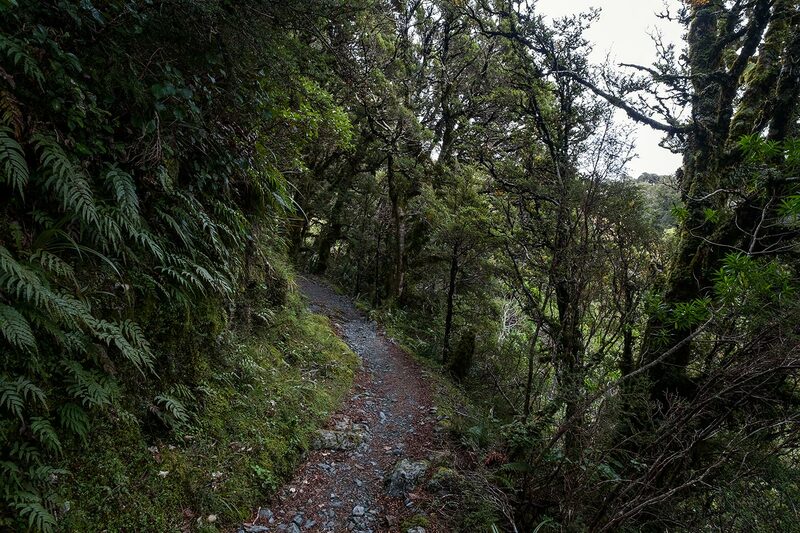 From Earland Falls on, the track gets easier and much more civilised. 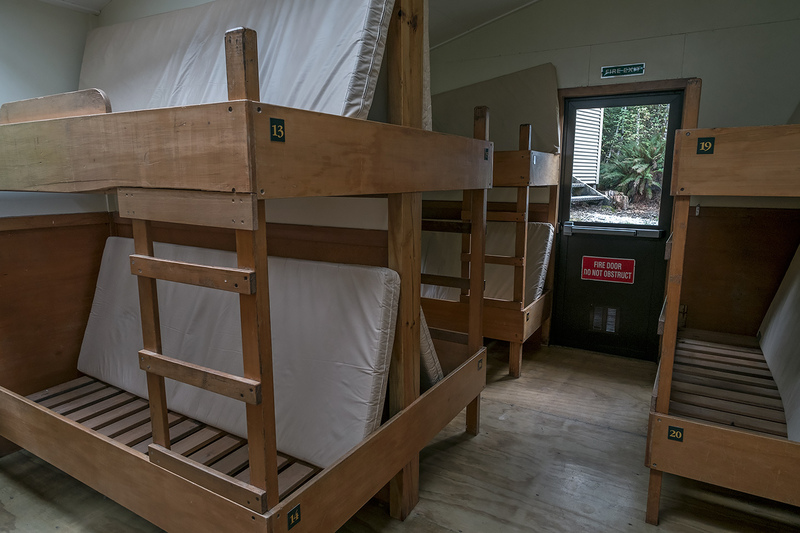 LAKE HOWDEN HUT - 28 bunk beds, gas cooking (during Great Walks season), heating, lighting, mattresses. 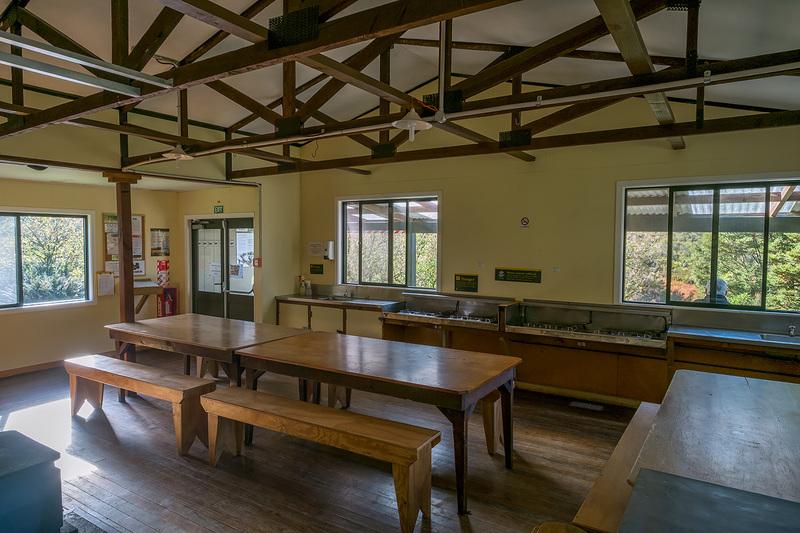 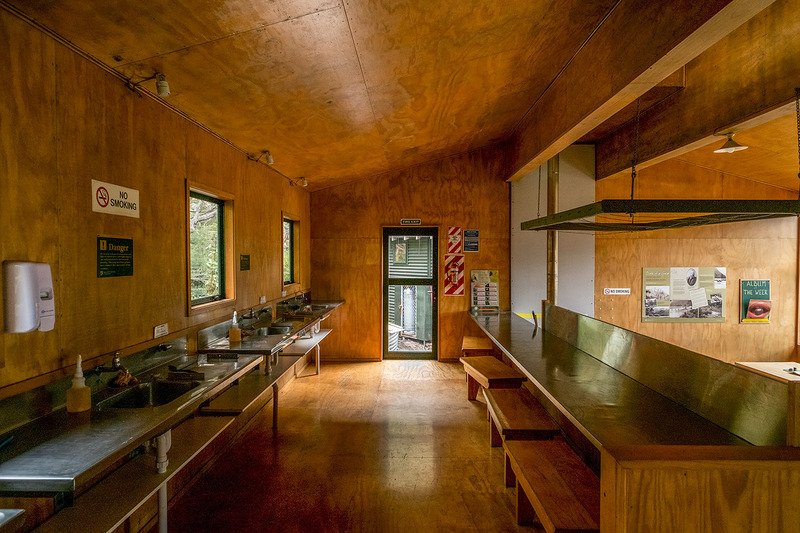 LAKE HOWDEN HUT - Dining Area. 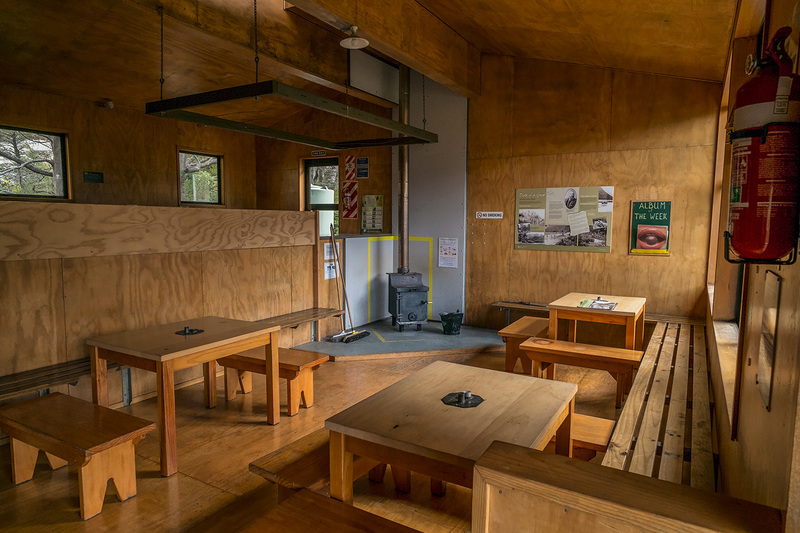 LAKE HOWDEN HUT - Dining Area and Woodburner for heating the hut. 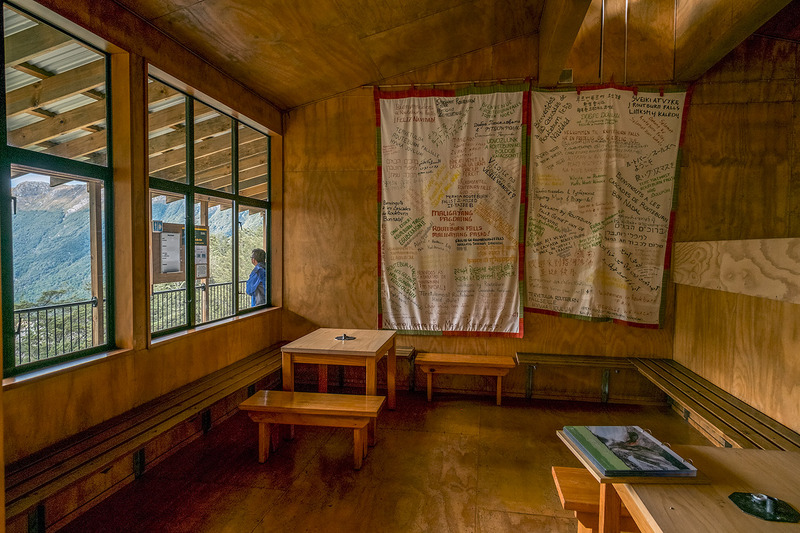 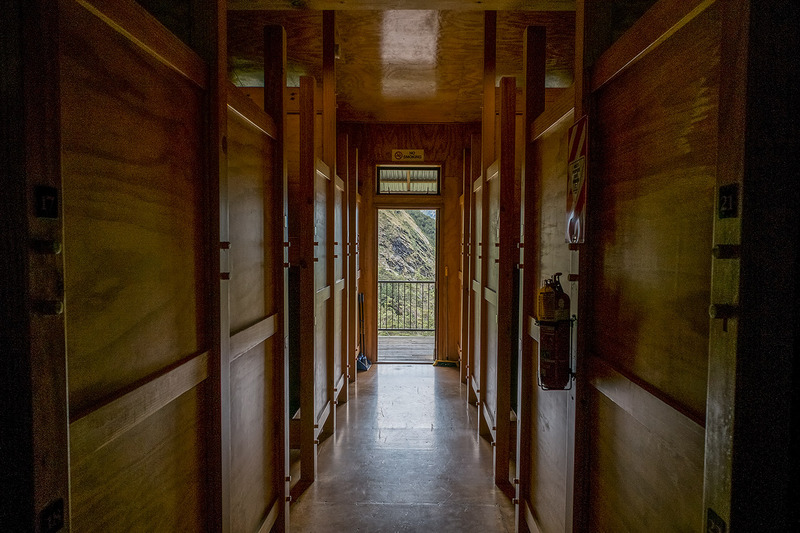 LAKE HOWDEN HUT - Bunkroom. 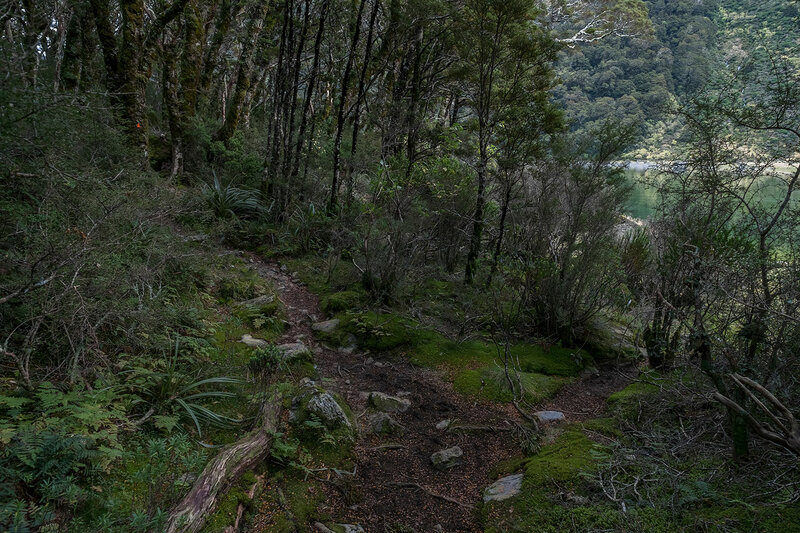 Lake Howden - just a few metres from Lake Howden Hut. 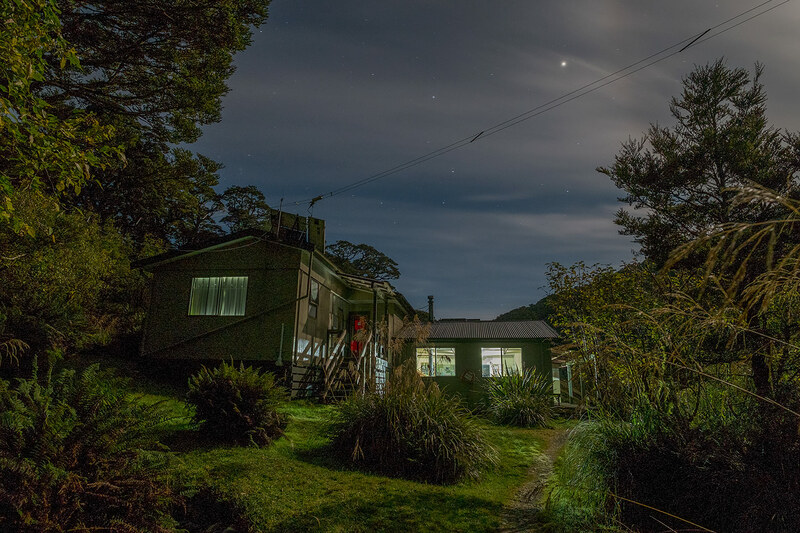 LAKE HOWDEN HUT - Viewed from beside the lake at night. 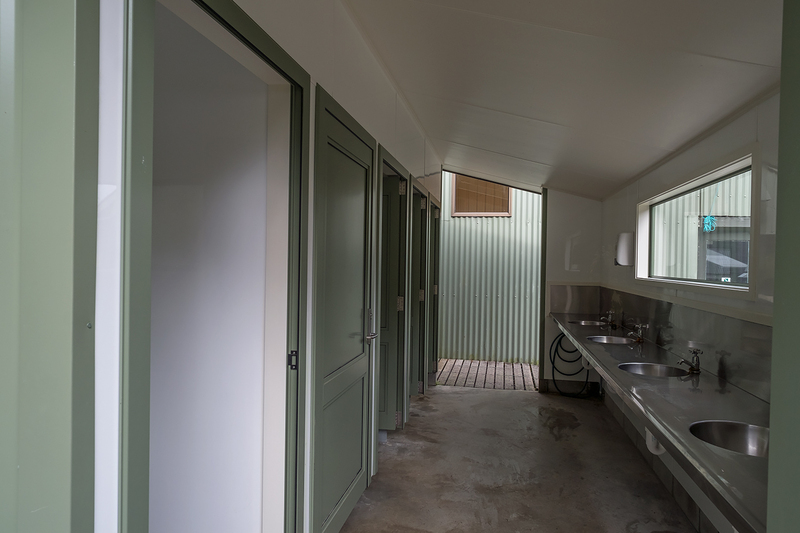 ...And leads up past the Toilets and Ablution Block. 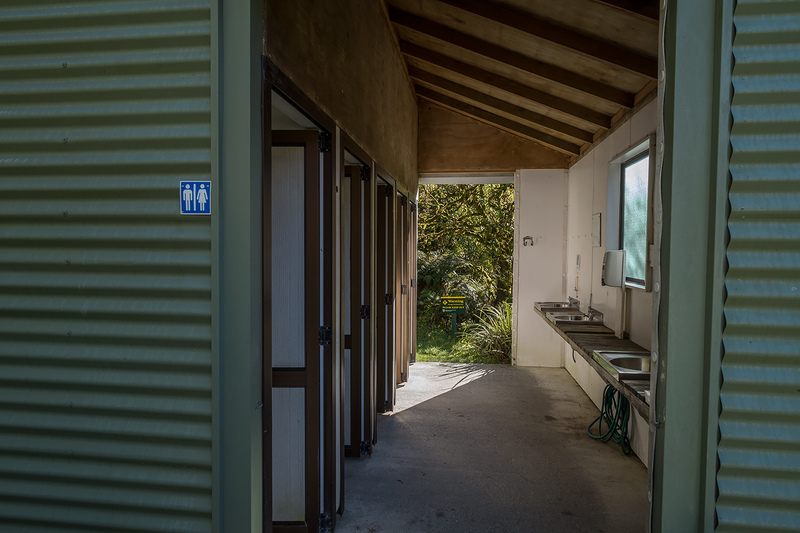 Lake Howden Toilets. 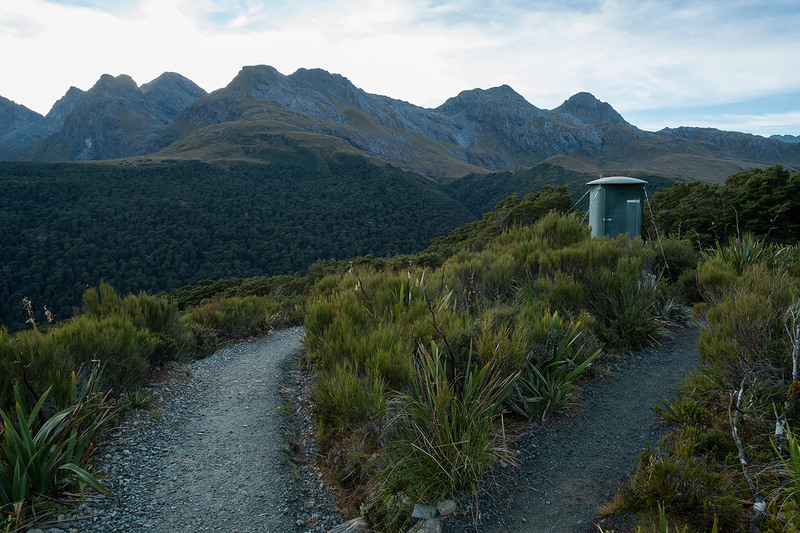 These toilets are only used during the Great Walks Season. 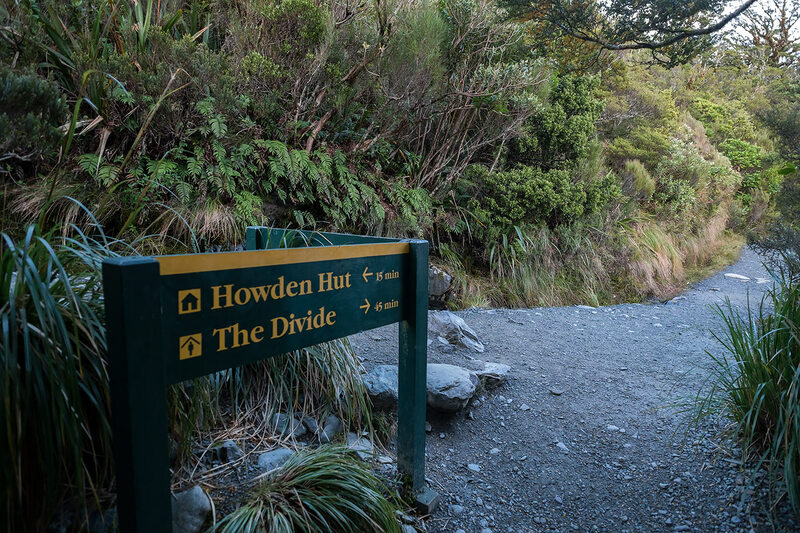 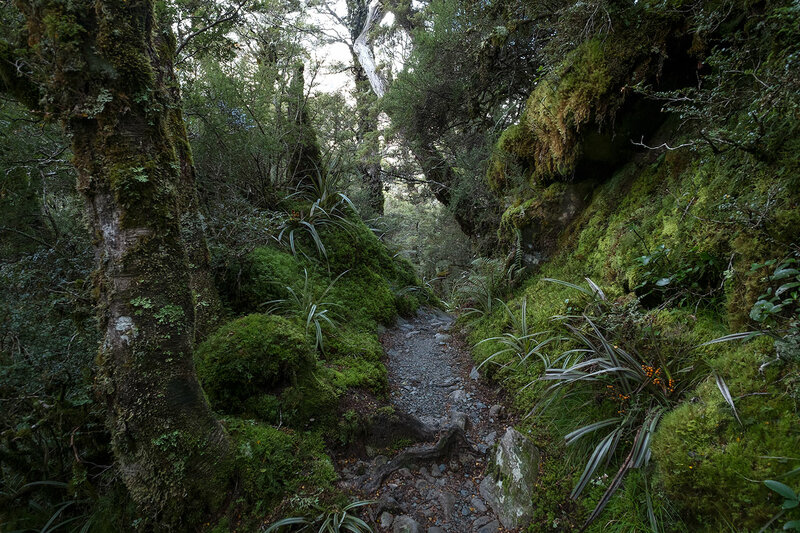 The fairly easy 3.4 km walk from Lake Howden Hut to The Divide takes 1 hour to 1 hour 30 minutes. 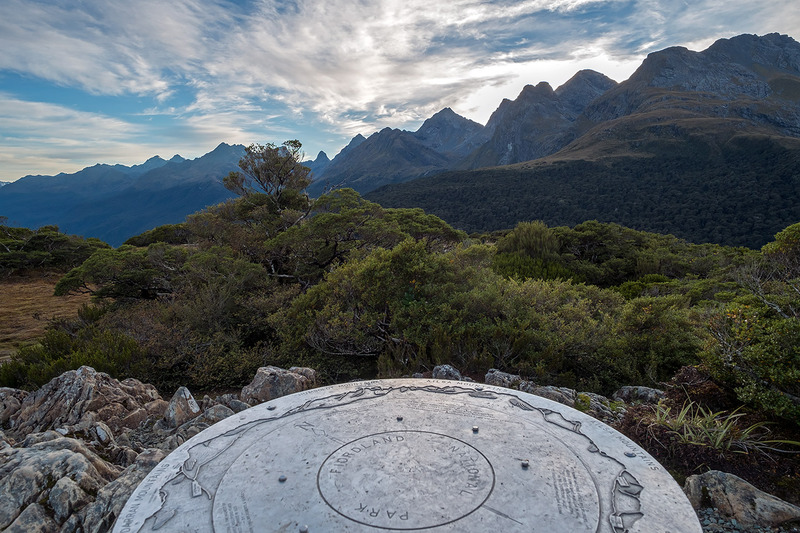 It is very definitely well worth doing the 1 hour side trip to Key Summit - possibly the most spectacular part of the whole Routeburn Track. 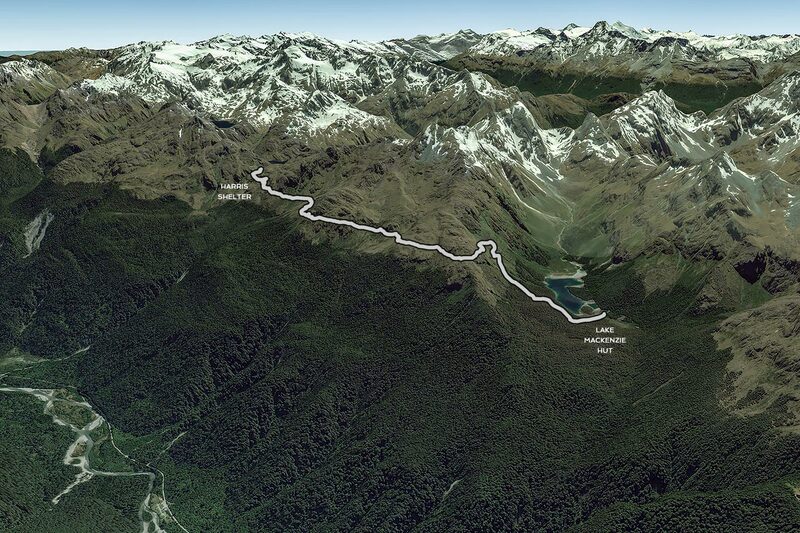 The track climbs steadily for the first 15 minutes or so. 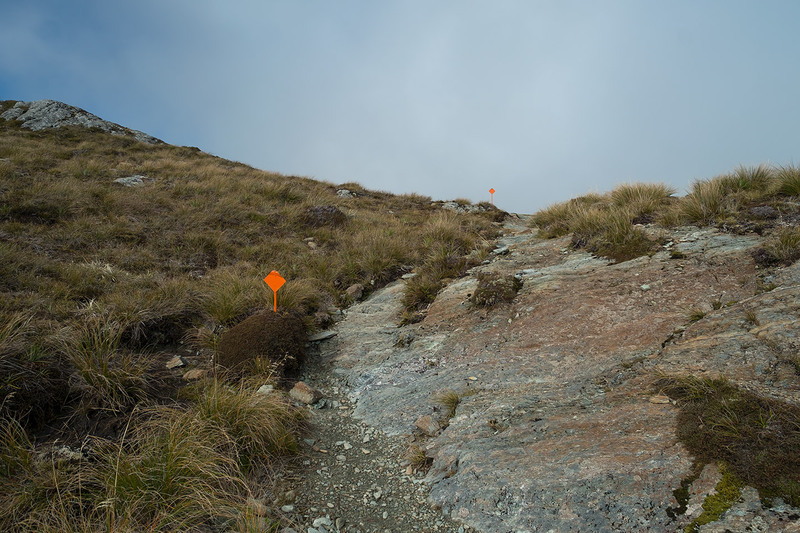 Here we will turn off to the left and head up to Key Summit. 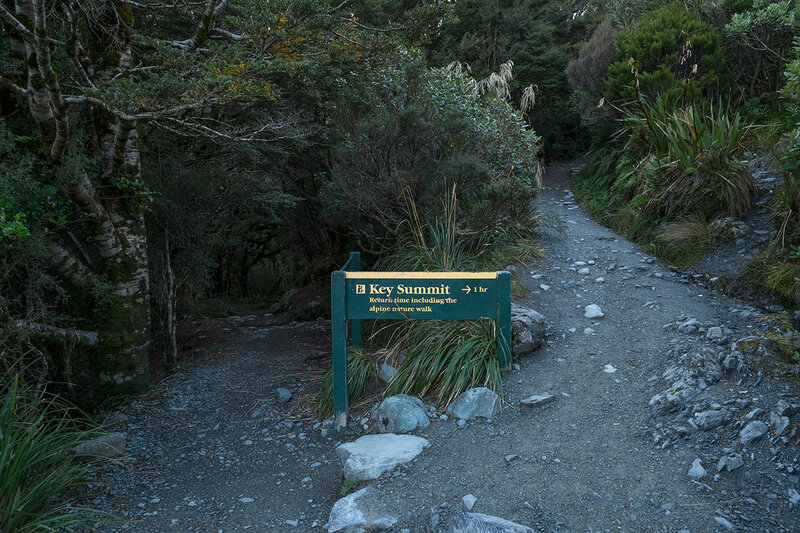 Key Summit. 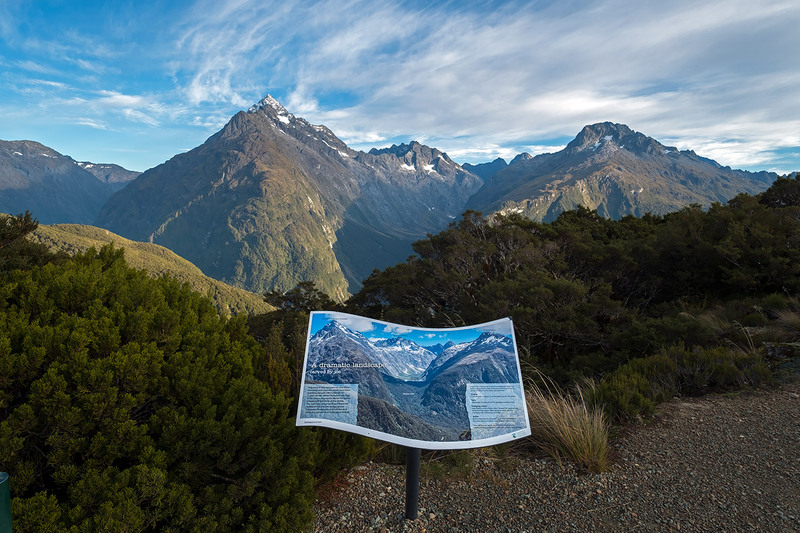 This sign describes an interpretative brochure that used to be available to guide walkers around the Key Summit Alpine Nature Walk ahead. 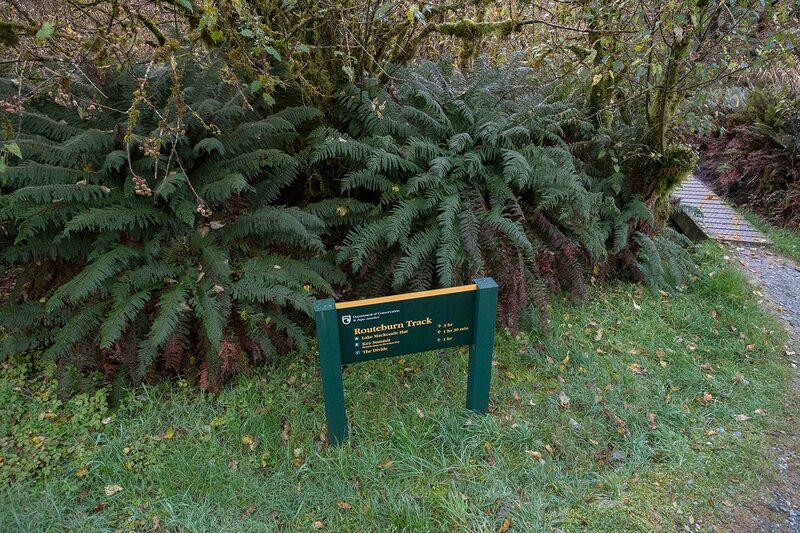 It's a shame not to have that information nowadays. 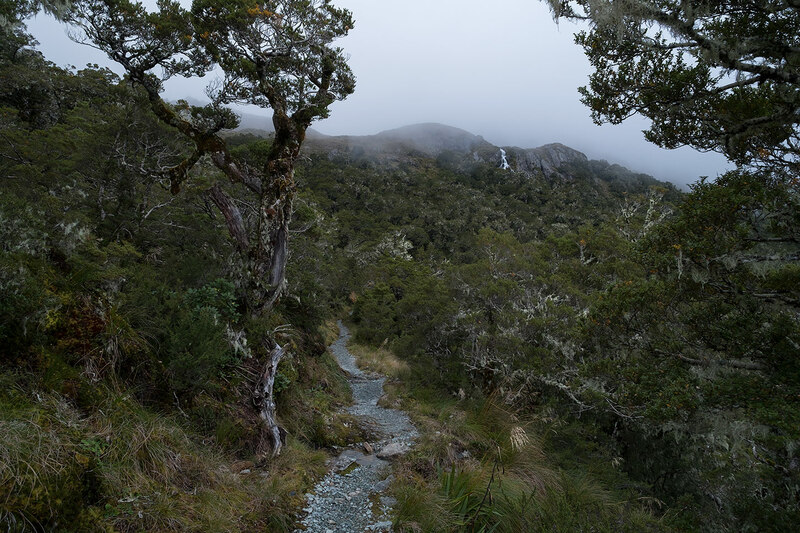 Key Summit is a beautiful and in places fragile environment. 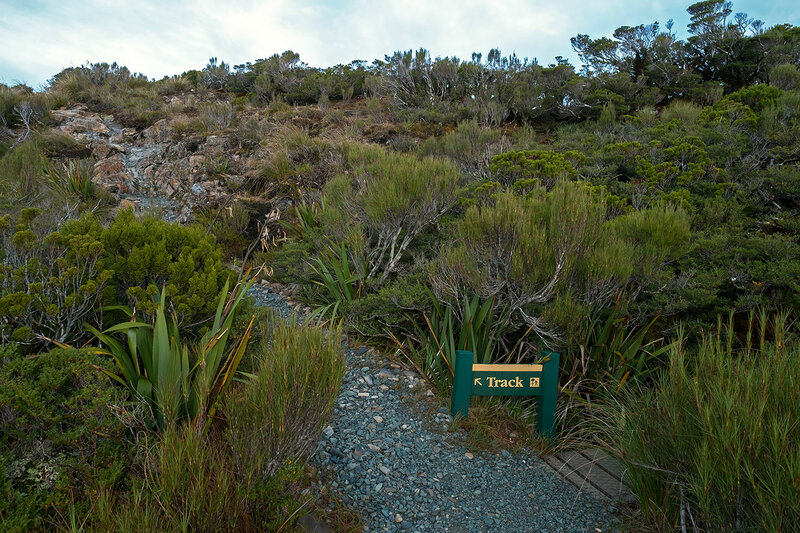 Please stay on the track. 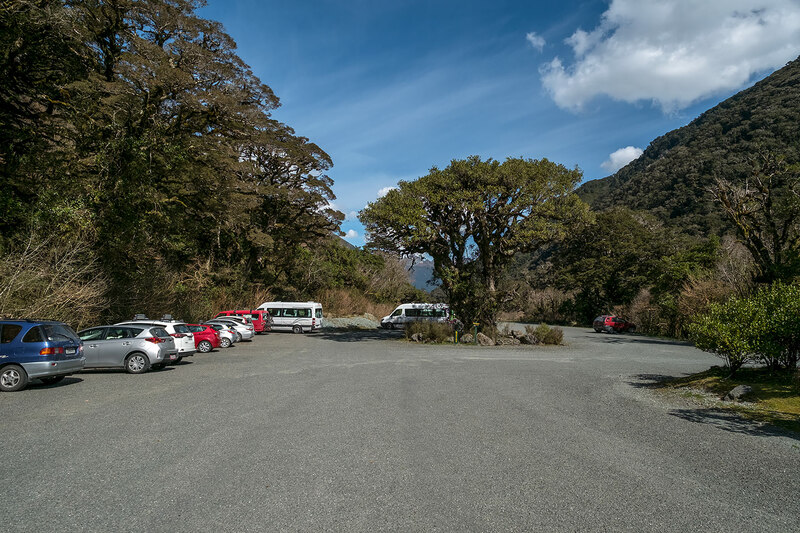 Key Summit. 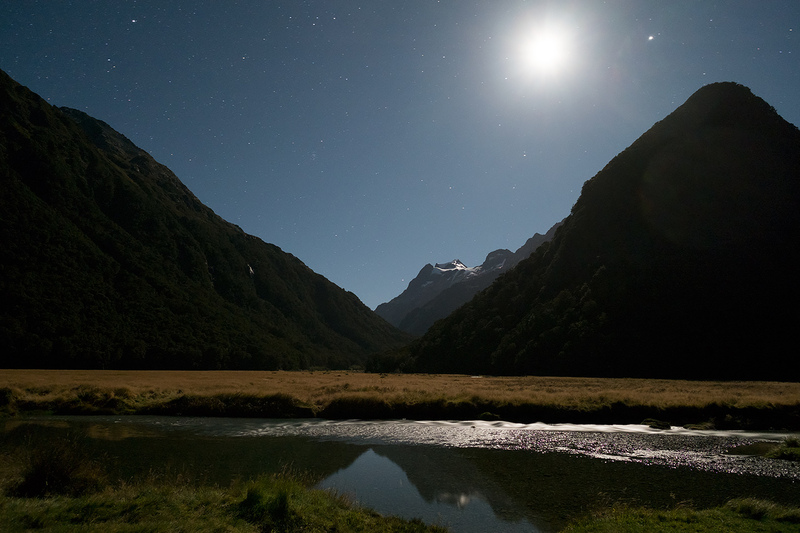 Wow... That's the shot. 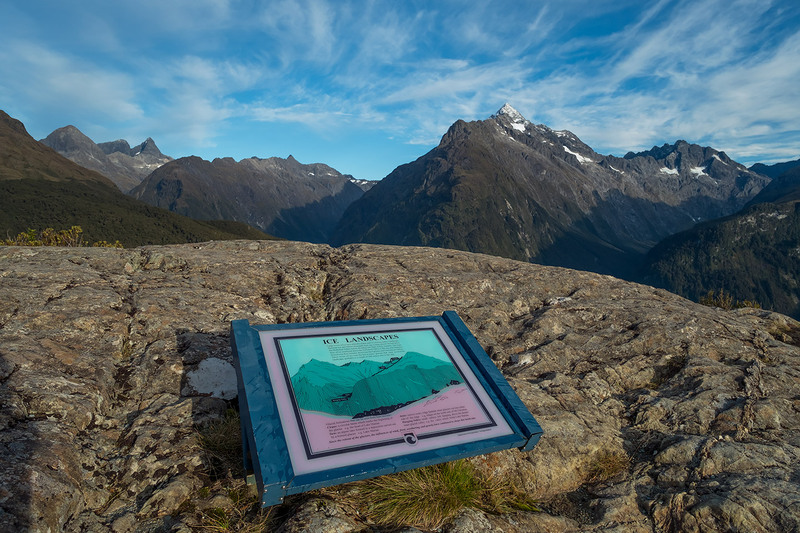 Key Summit. 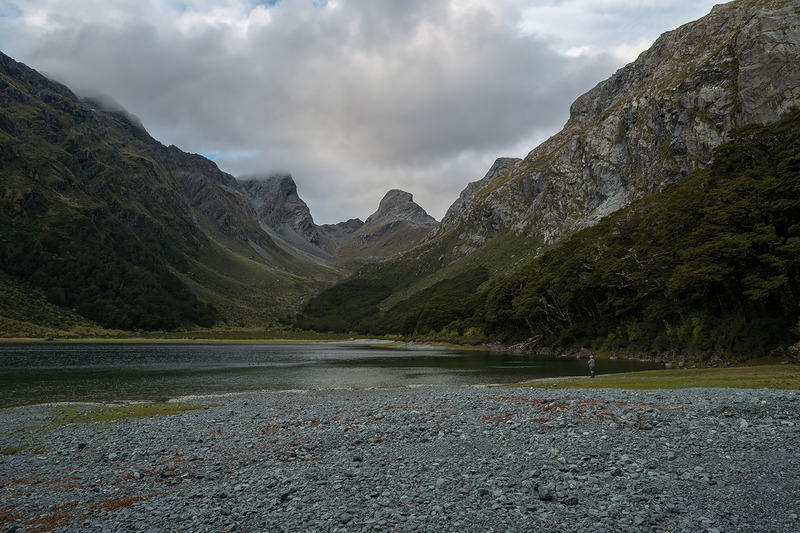 The surrounding landscape is incredible. 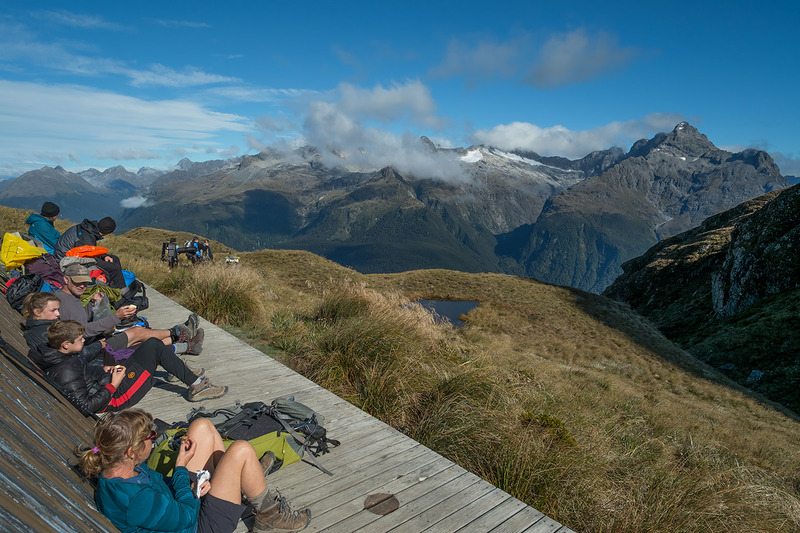 Key Summit. 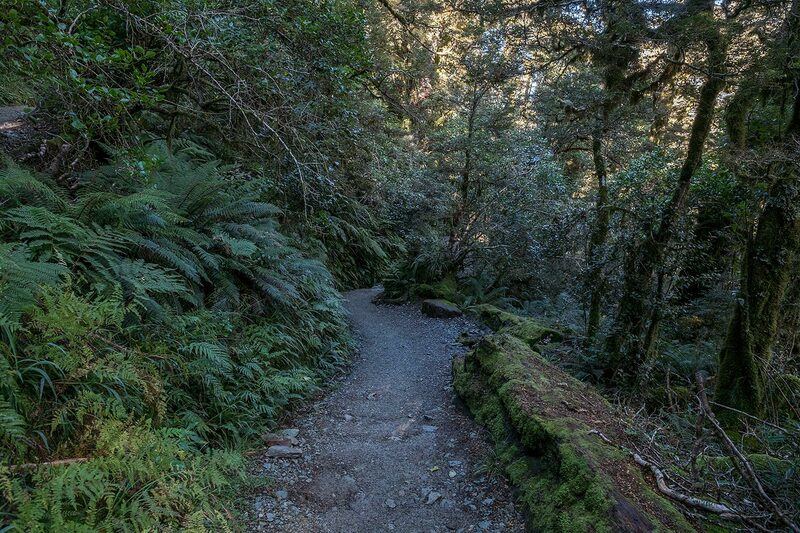 See that little track there..? 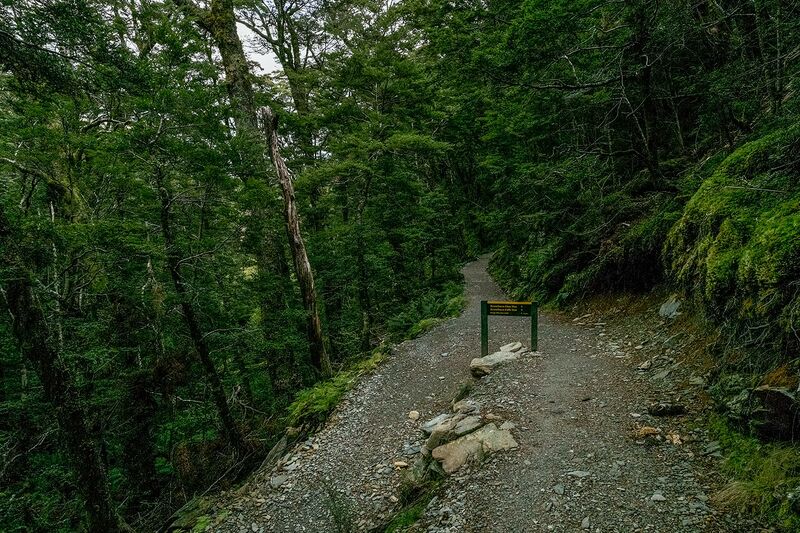 That's not the track. 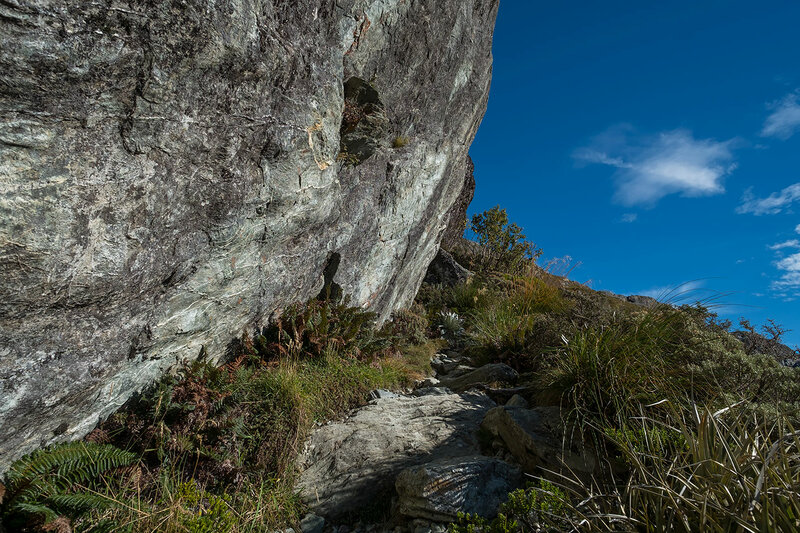 Stay on the real track. 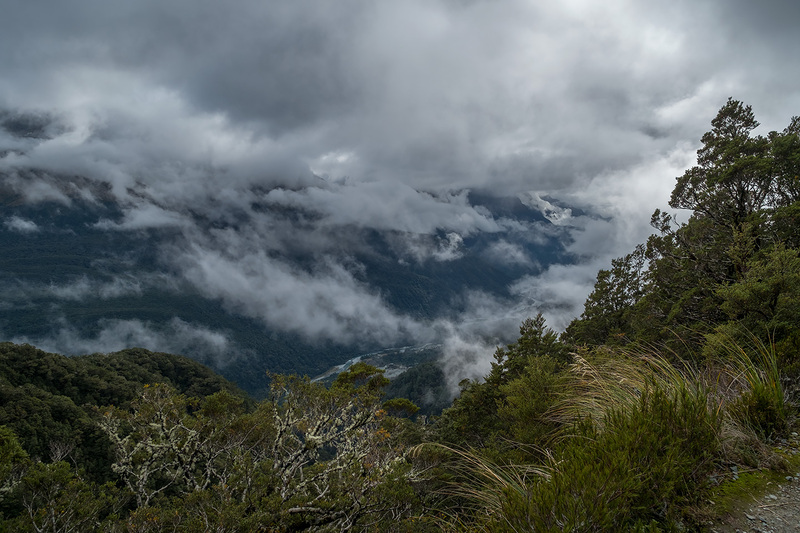 Key Summit. 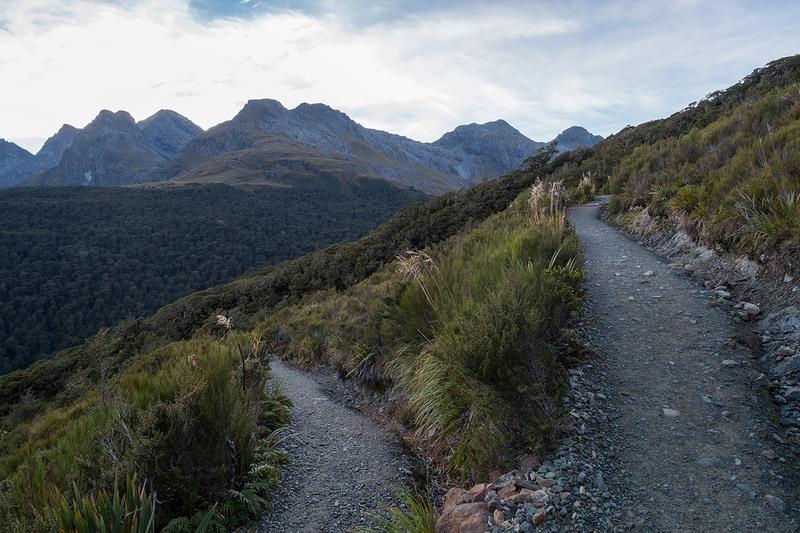 Heading back down to finish the Routeburn Track. 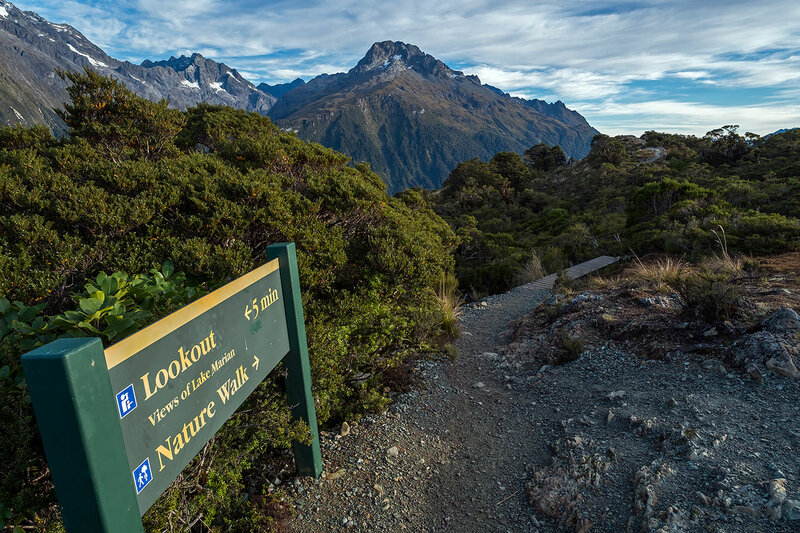 The rest of this Great Walk is easy and downhill all the way. 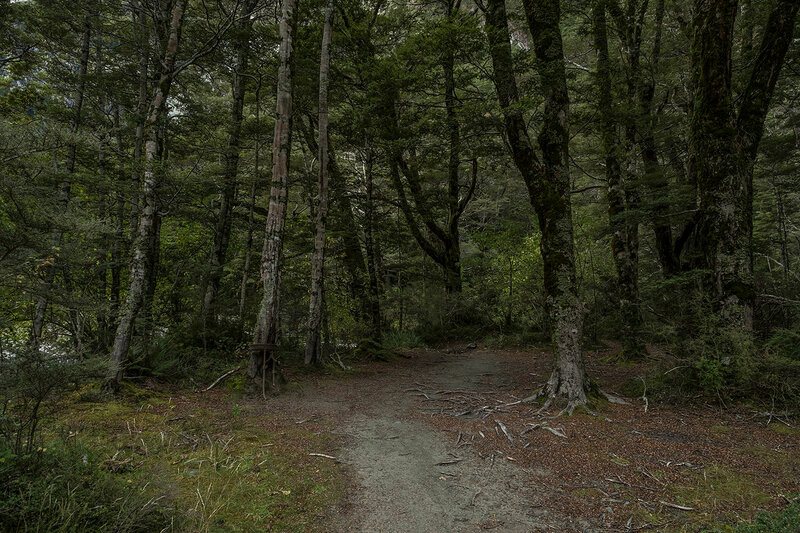 And that's it... 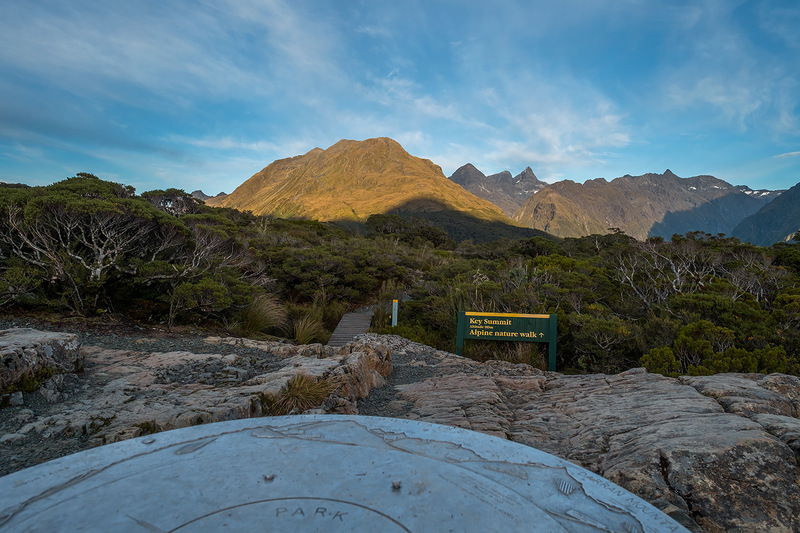 The end of the Routeburn Track. 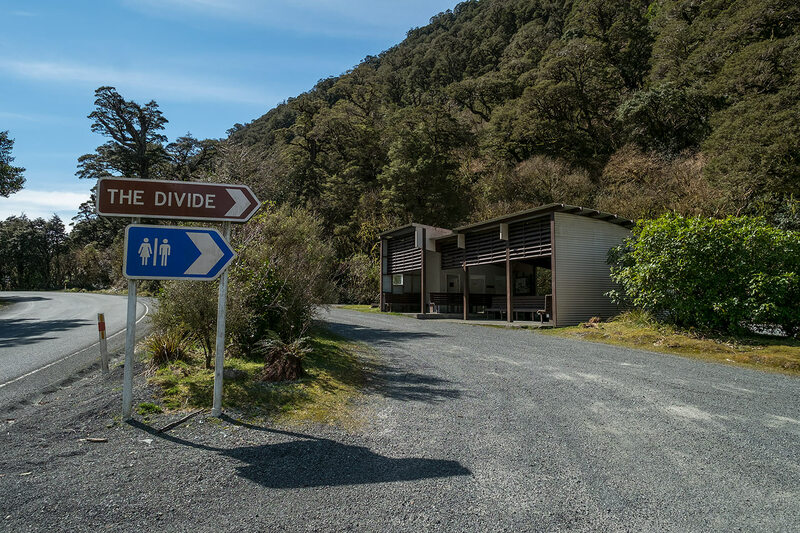 The Divide Shelter. 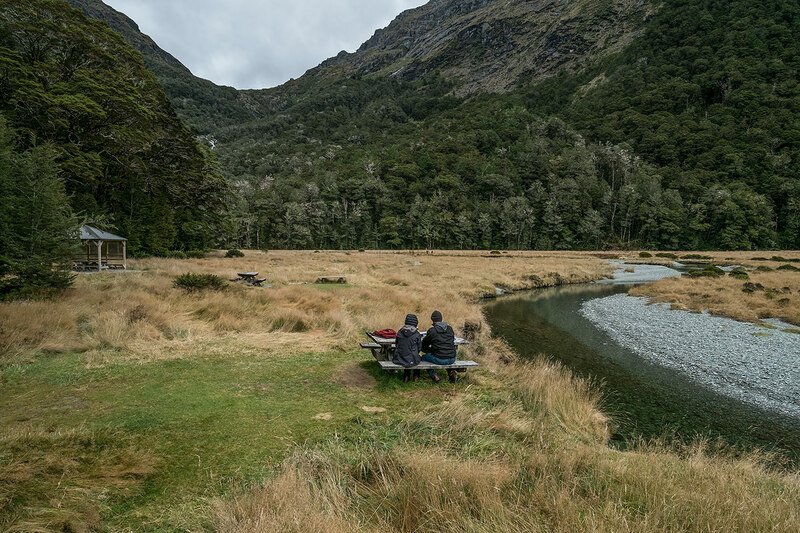 Here, we can rest and feed the sandflies.